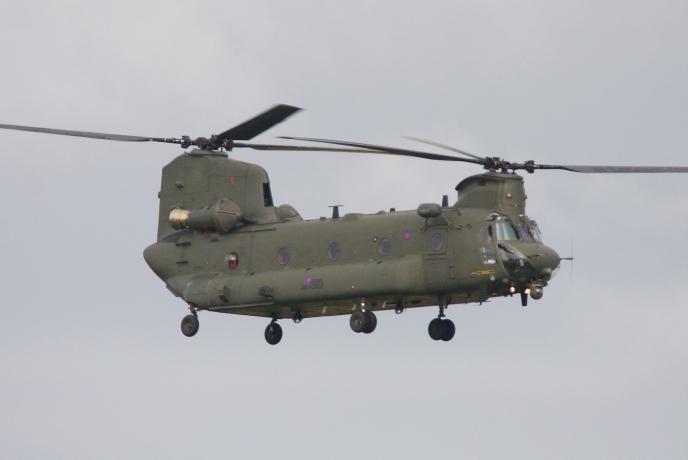 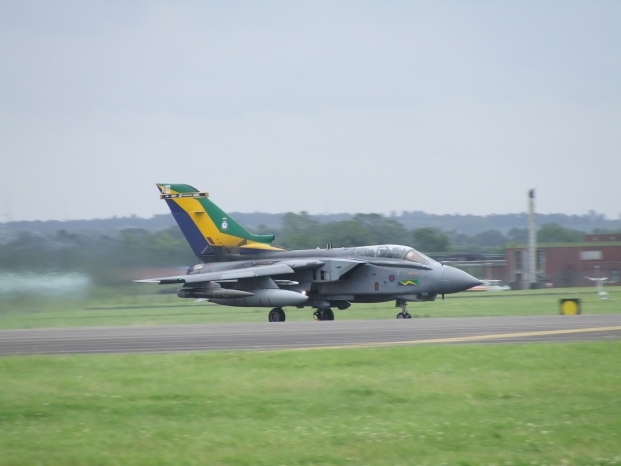 Marham was first opened in 1916 as a military night landing ground. 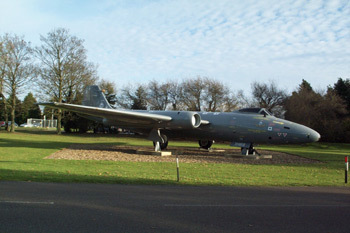 Construction started on the present-day site in 1935. 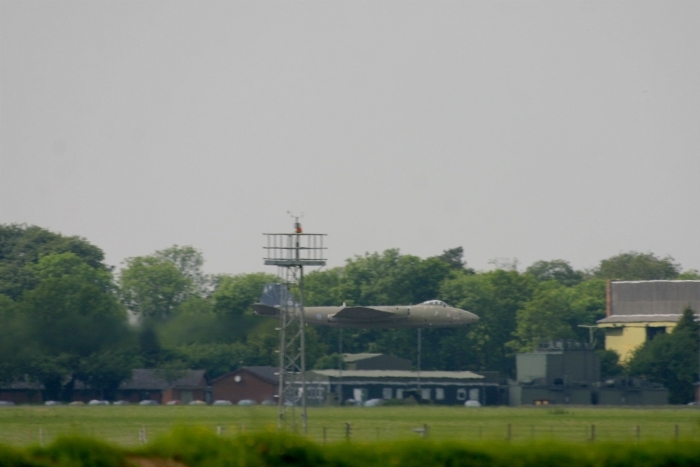 The aerodrome opened on 1st April 1937 as a heavy bomber station. 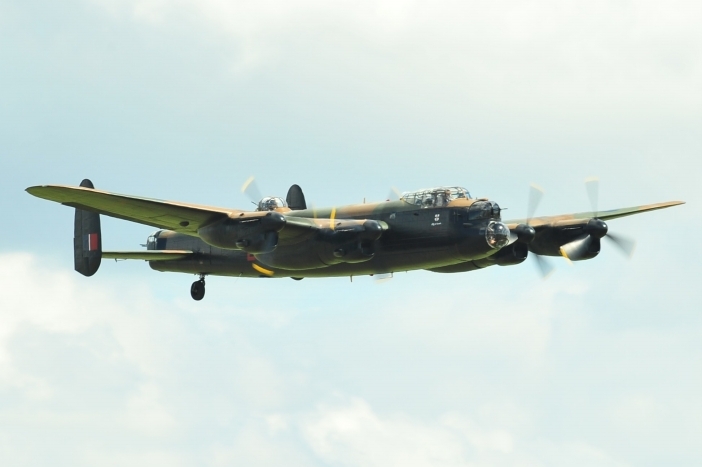 Two types of aircraft moved to Marham, Fairey Hendons and Handley Page Harrows and in December 1938 Wellington I bombers arrived. 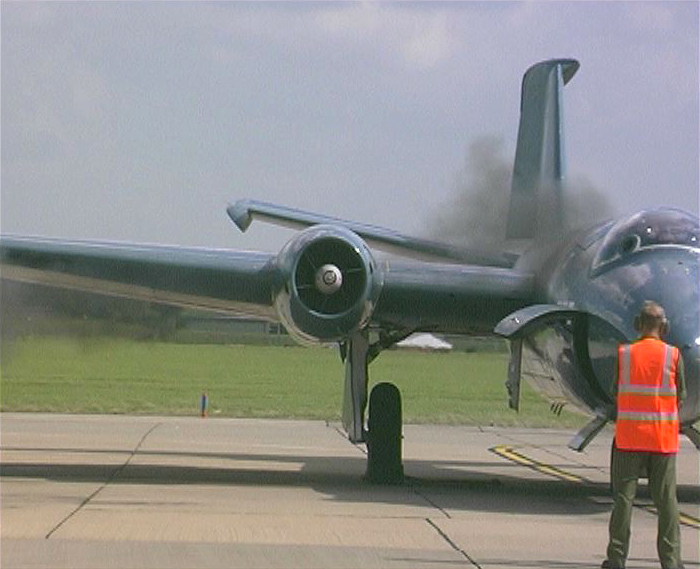 In early 1942 the Wellingtons were replaced by four-engine Sterlings. 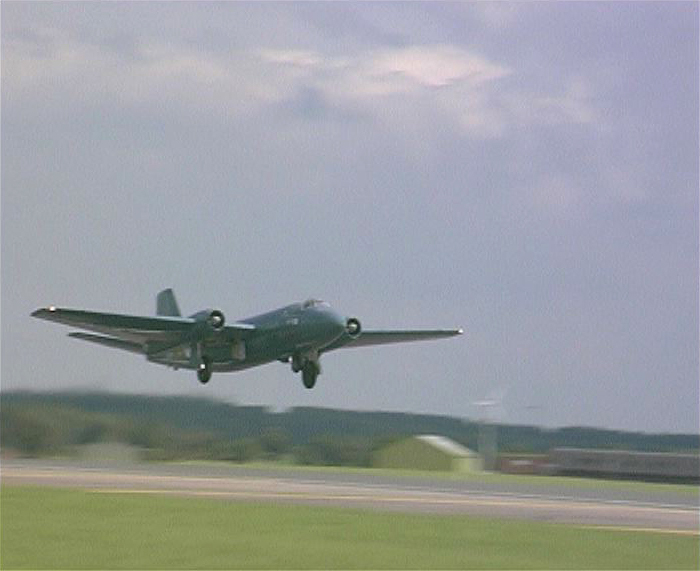 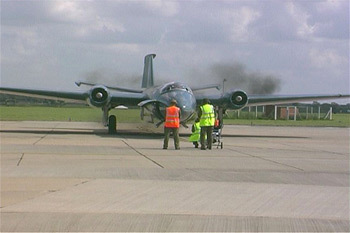 Other aircraft operating at Marham were Mosquitos and Blenheims. 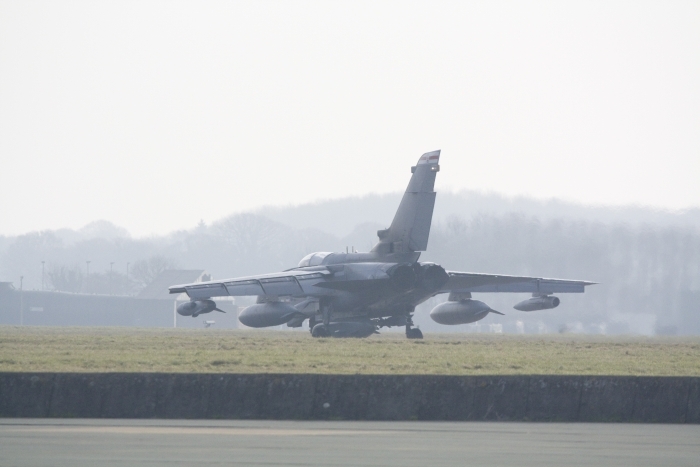 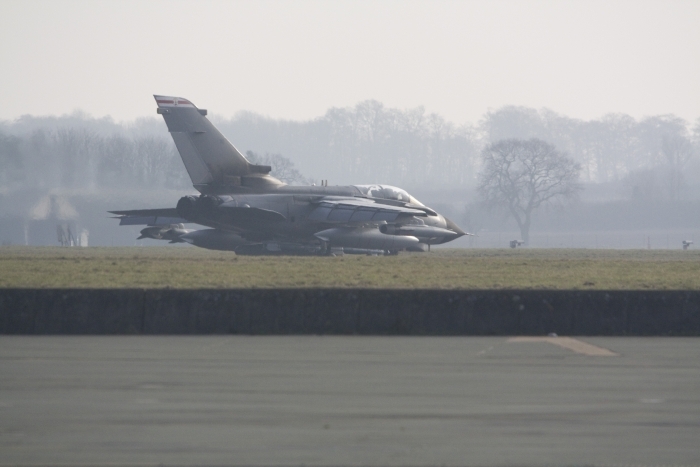 Marham closed after the war for installation of concrete runways, taxiways and dispersals. 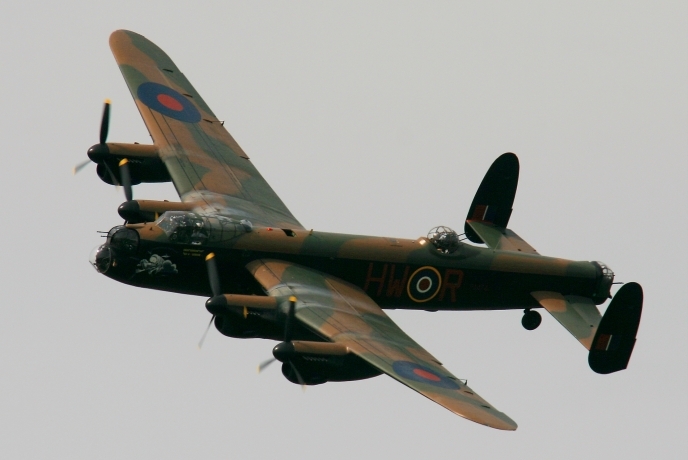 In January 1946 Marham reopened as a Lancaster base, also moving to Marham were Lincolns, Ansons and Proctor aircraft. 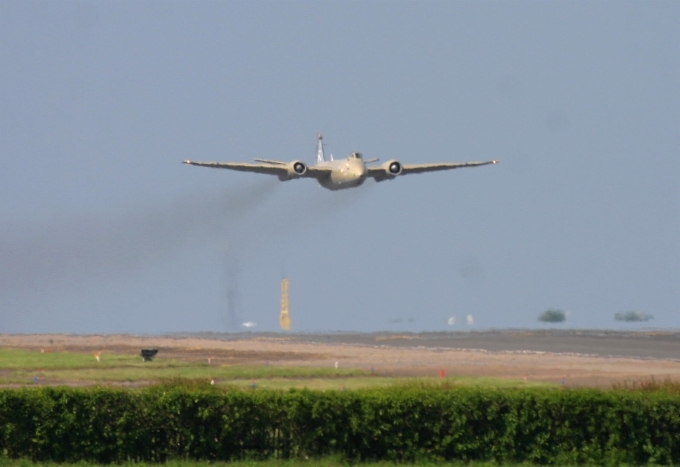 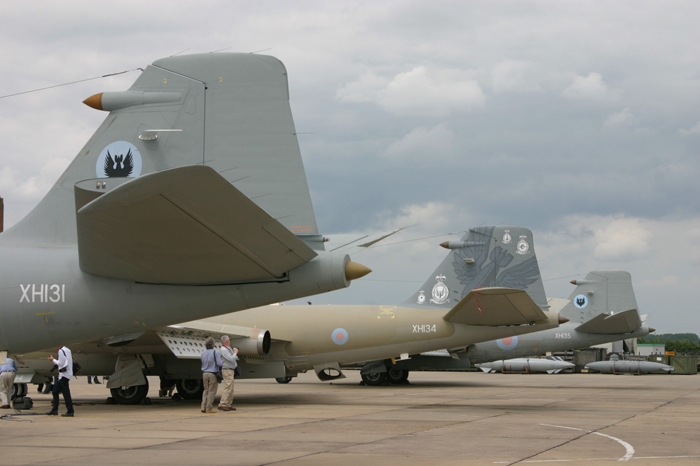 Over the next few years other types of aircraft were also moved to Marham, including B-29s and B-50s of The United States Air Force (USAF). 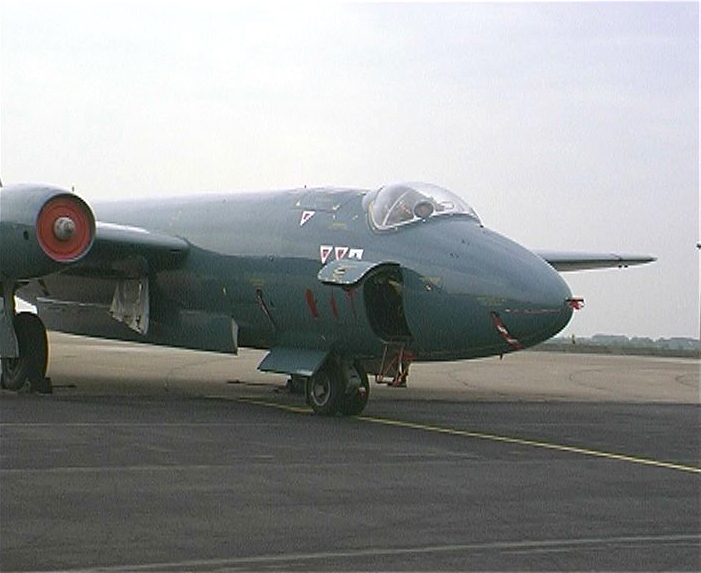 In January 1956, 214 Squadron reformed at Marham with Valiant B1s. 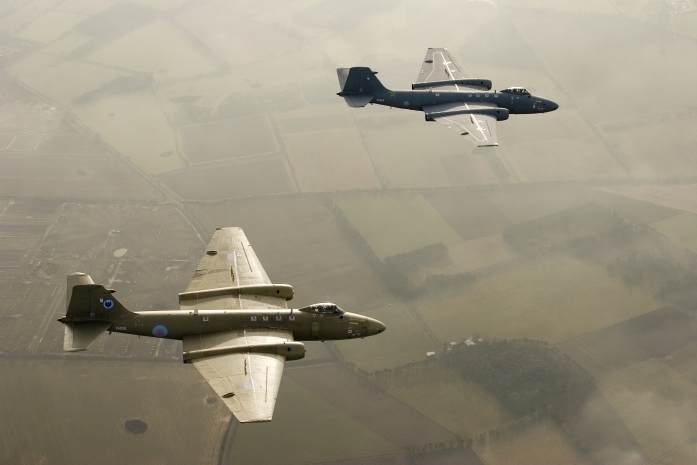 These were joined by several other Valiant squadrons over the next few months. 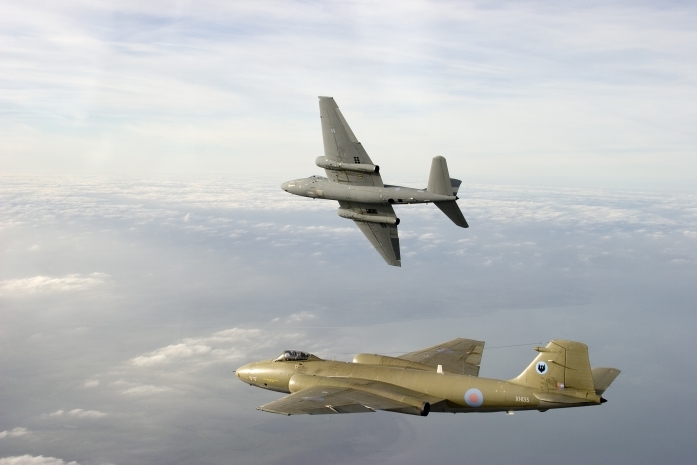 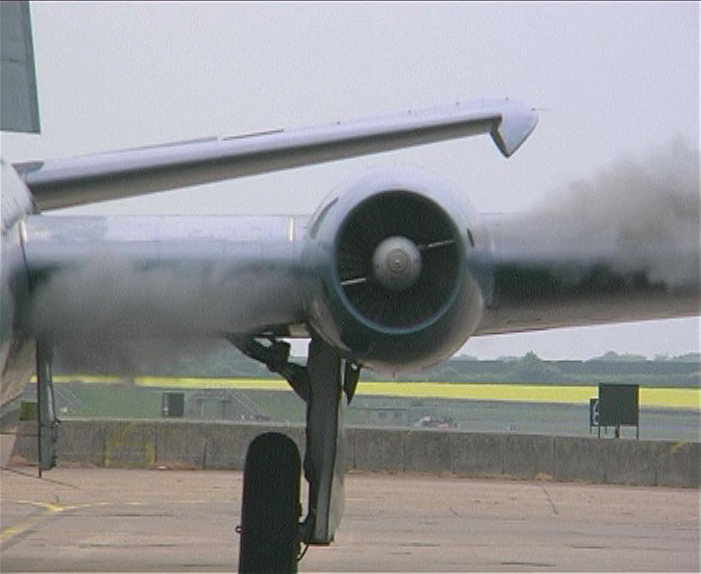 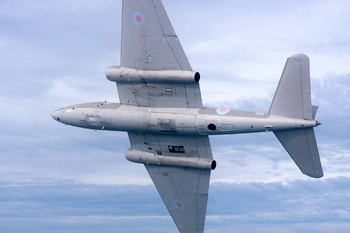 Valiant refueling started in 1957 and over a period of over three years trials were carried out. 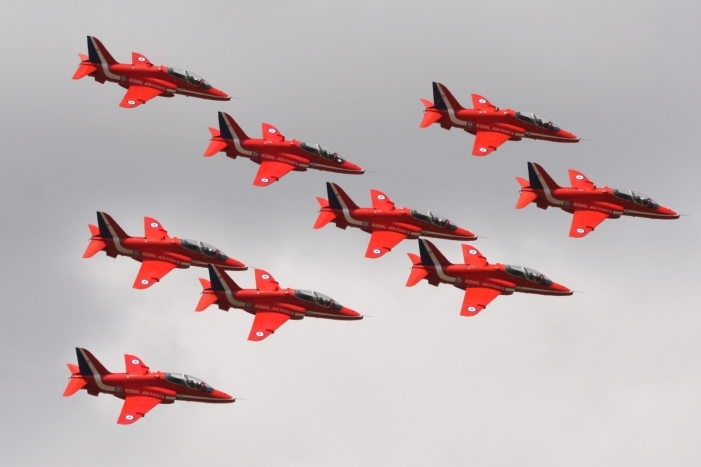 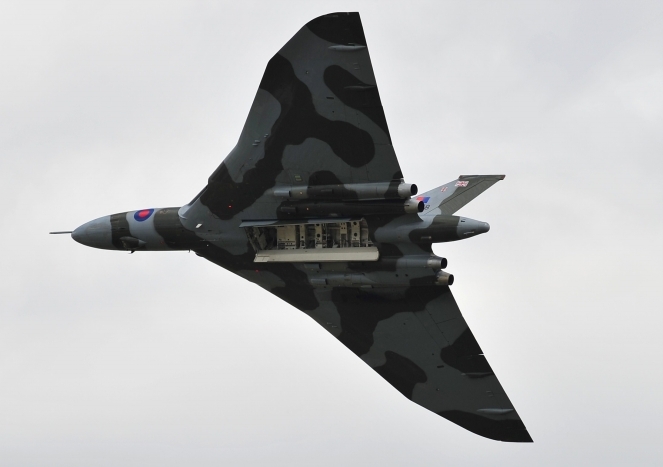 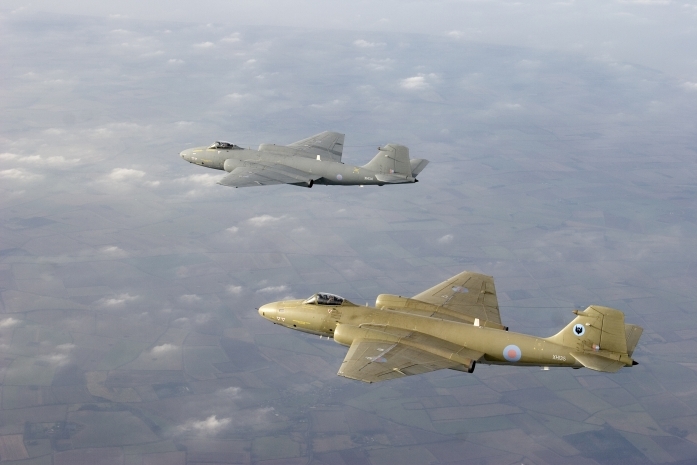 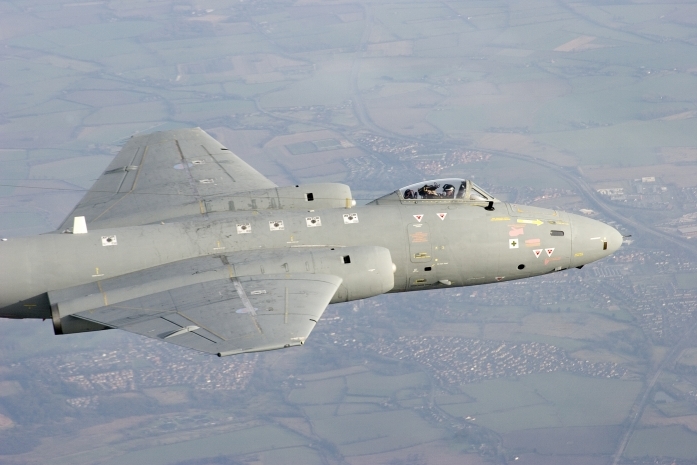 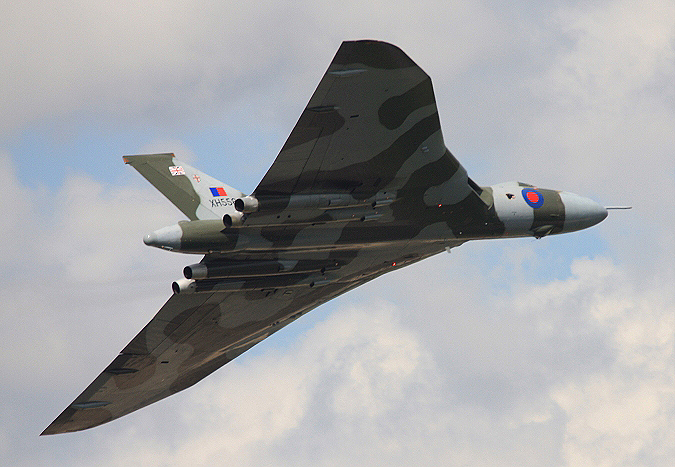 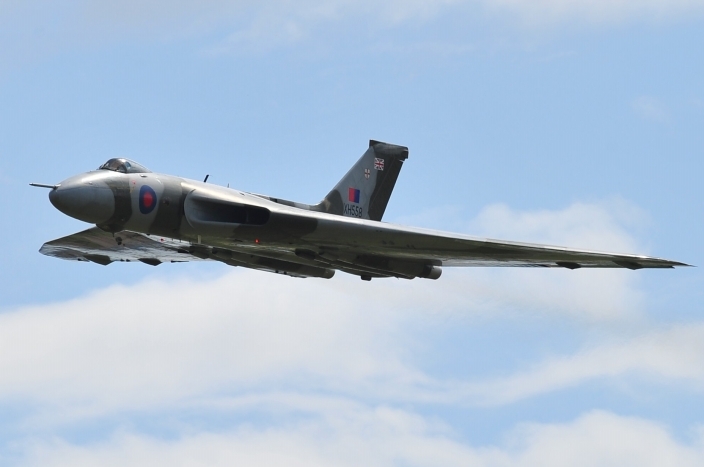 In 1960 Javelins, Lightnings, Vulcans and Victors were converted to receive fuel from the Valiants. 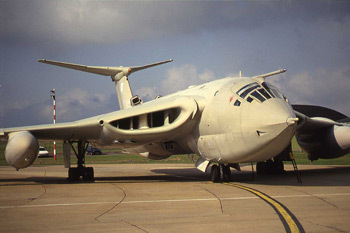 In December 1964 the Valiants were grounded because of metal fatigue and all but one aircraft was scrapped. 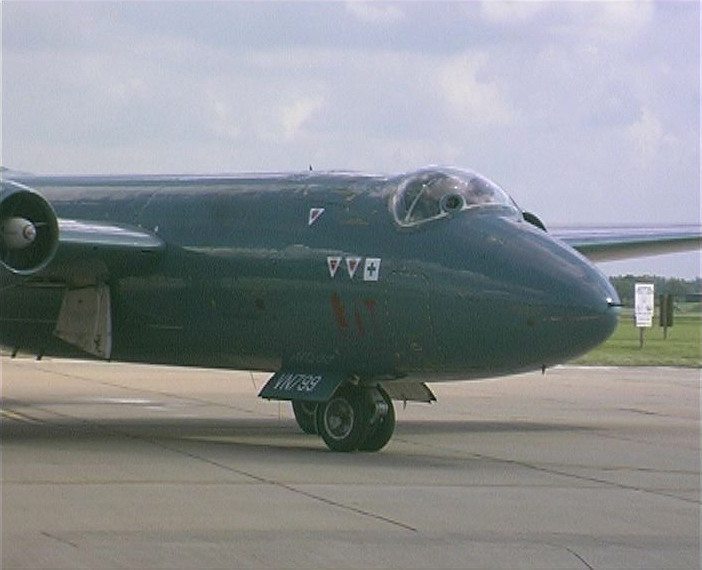 On 24th May 1965, 55 Squadron arrived at Marham with a Victor Mk BK1 aircraft. 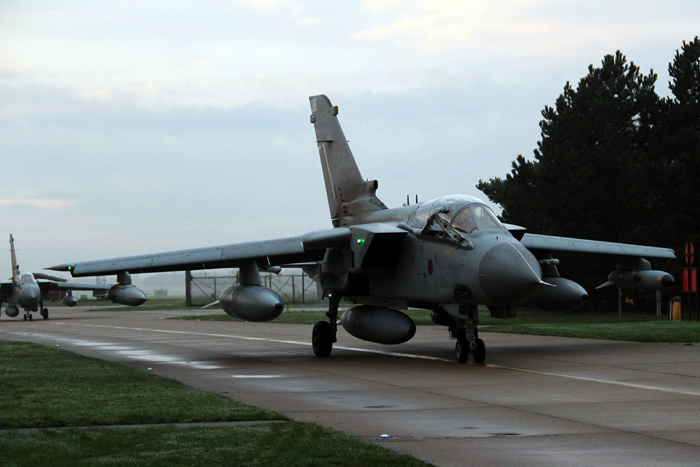 Soon followed by 57 and 214 Squadrons. 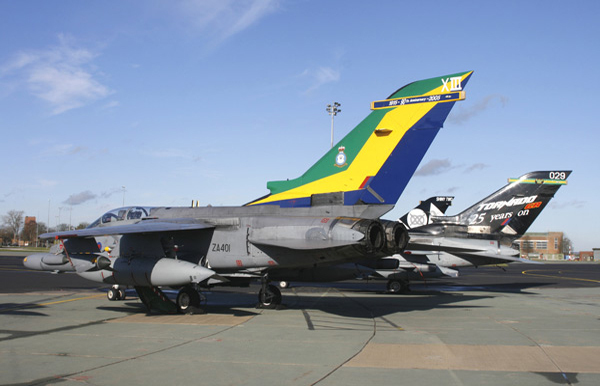 In 1976 Marham became the home to various Mks of Canberra aircraft, which operated in the target and training roles. 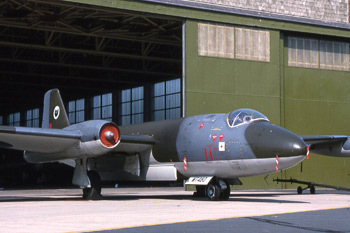 The remaining Canberras at Marham moved in 1982 to RAF Wyton. 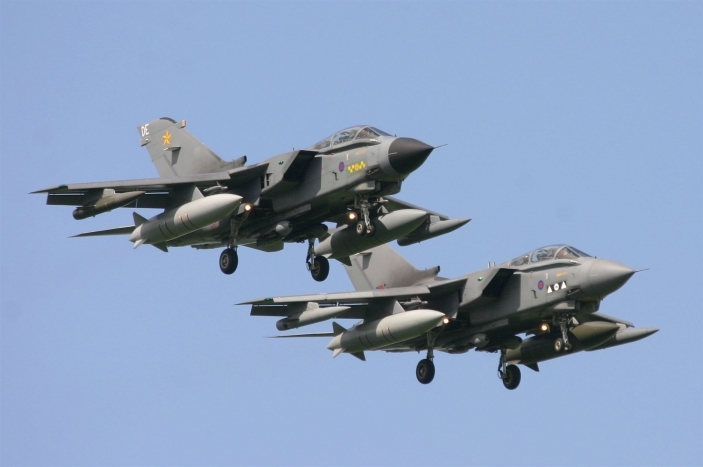 In 1982 Marham received its first squadron of Panavia GR1 Tornados which were housed in some of the twenty-four new hardened shelters which were built each end of the airfield. 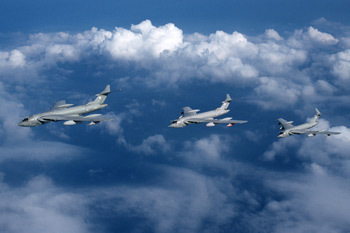 In 1982 Marham's Victors were involved in the Falklands War where they gave sterling service refueling aircraft from the UK out to Ascension Island in the South Atlantic. 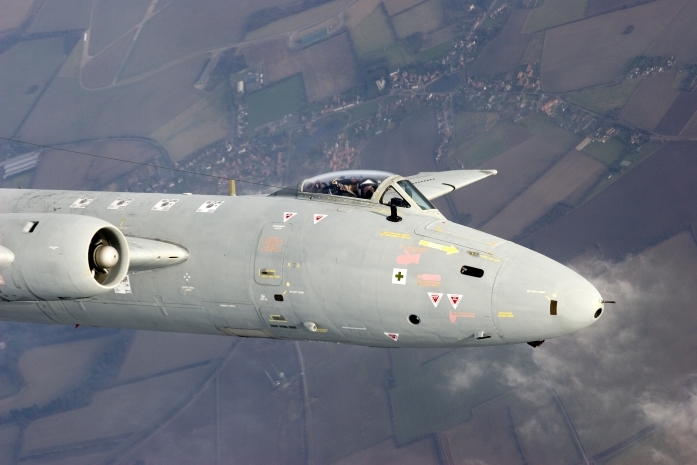 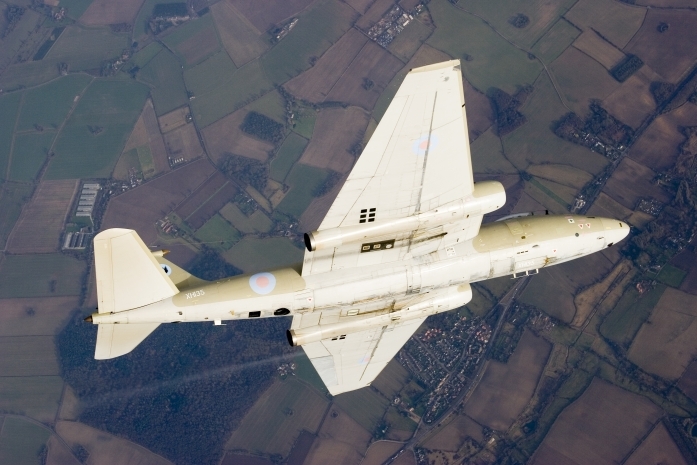 As the Victor Force was gradually run-down, Marham's Victor squadrons were disbanded, starting with 57 Squadron and finally with 55 Squadron which disbanded in 1993. 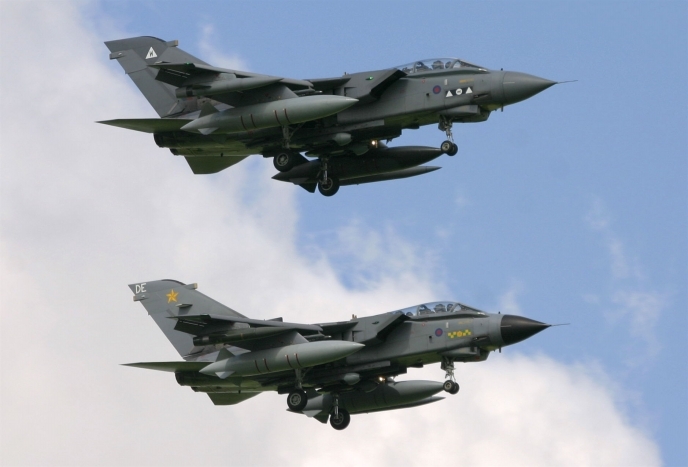 In December 1993 Marham became the home to the RAF's last squadron of Canberras when 39 Squadron arrived from RAF Wyton with its PR9, PR7 and T4 aircraft. 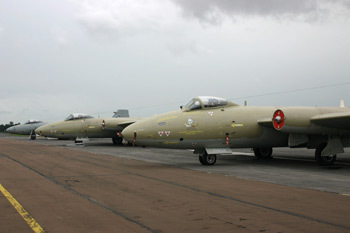 Some of these aircraft were gradually retired and by 2005 there were only five aircraft on strength, four PR9s and one T4. 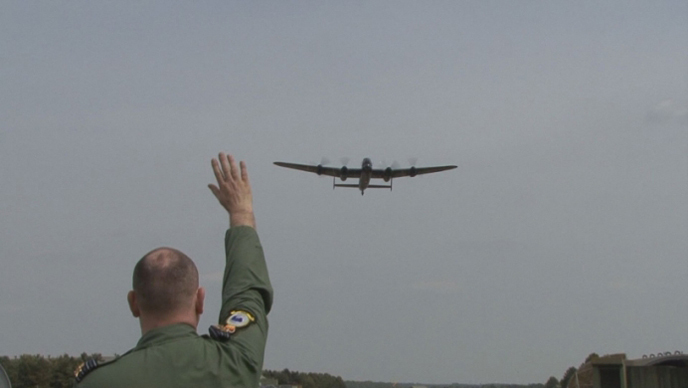 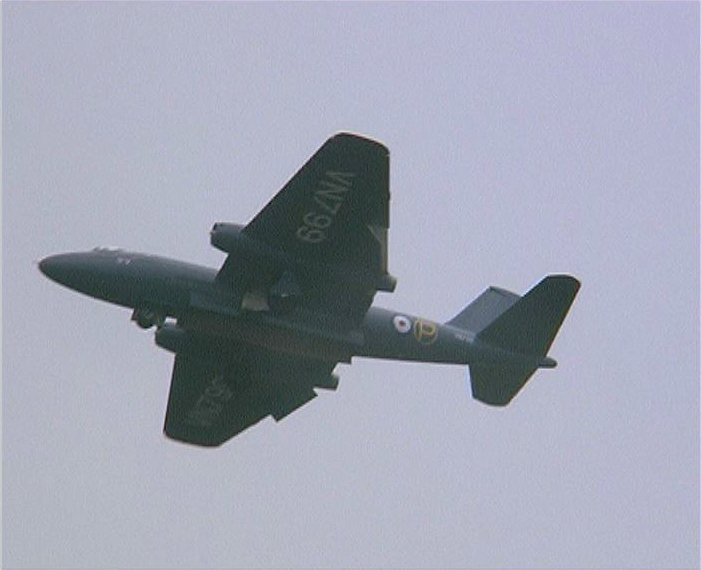 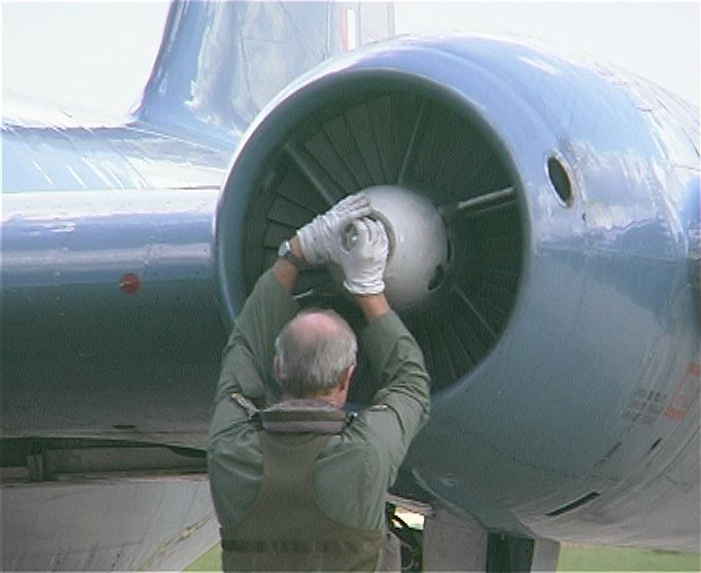 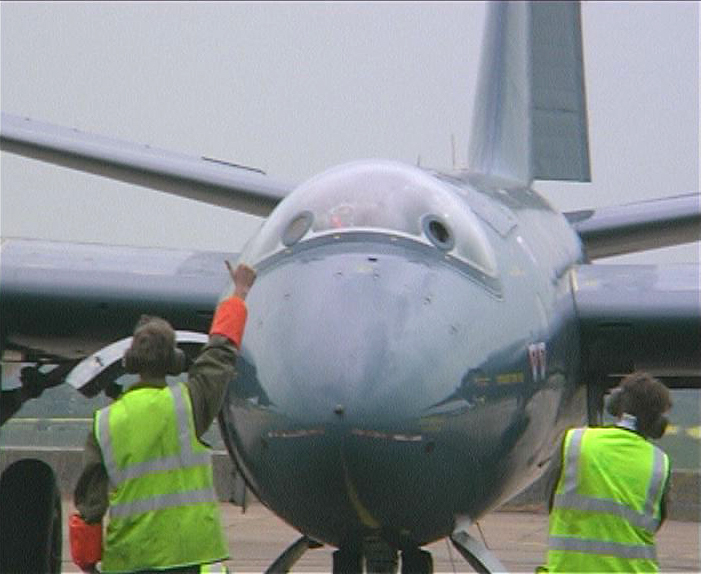 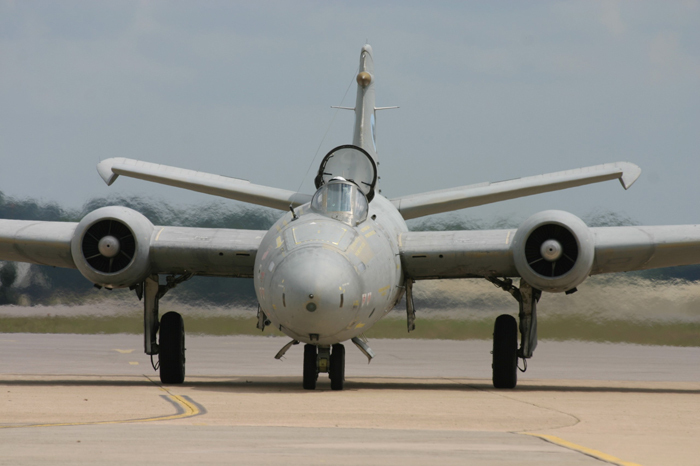 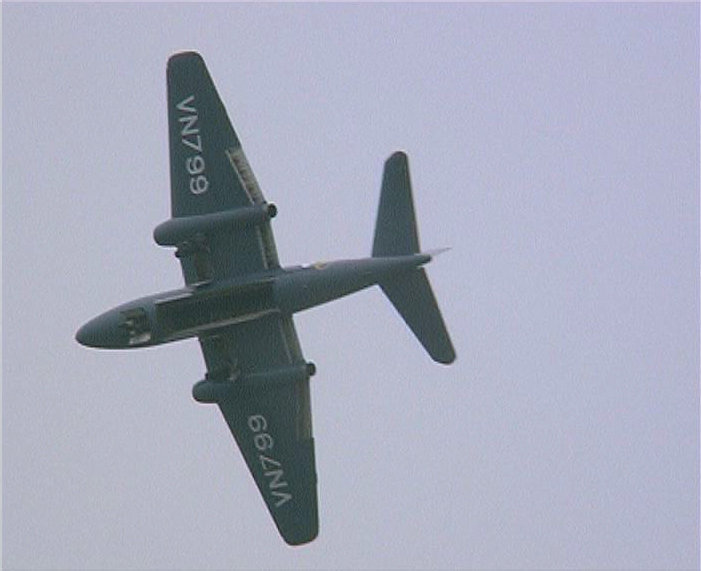 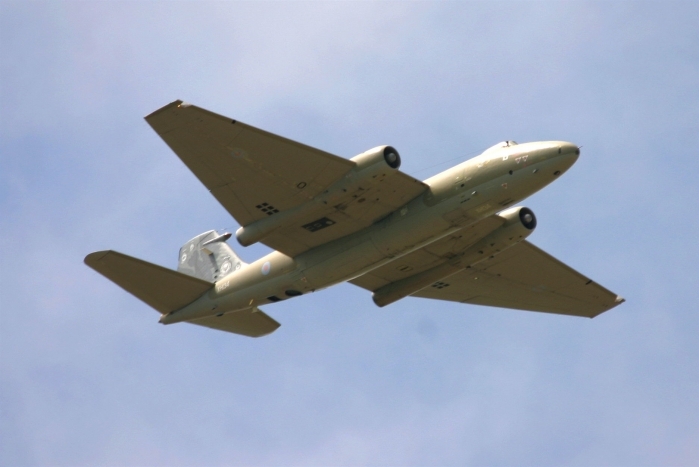 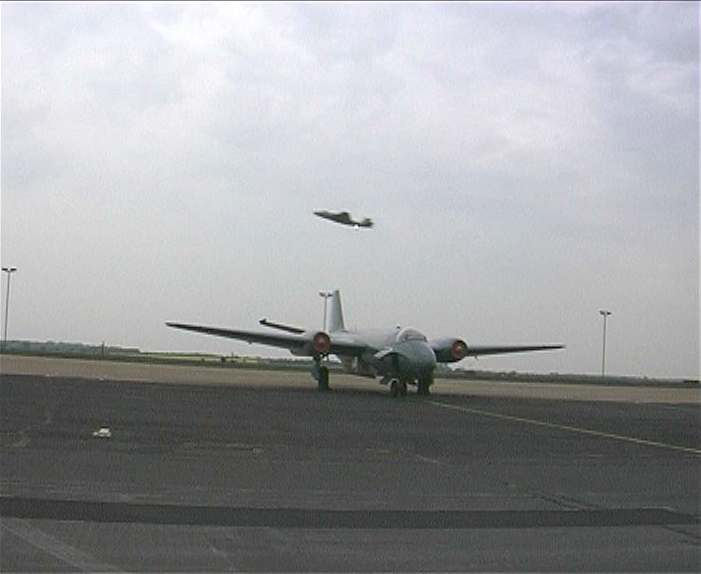 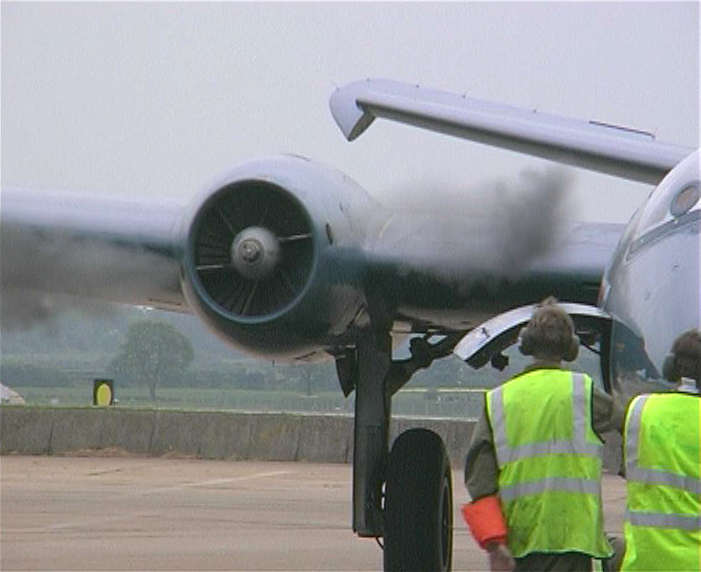 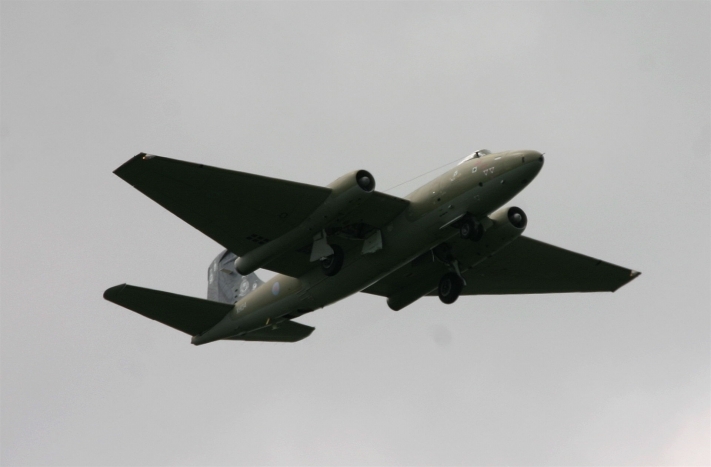 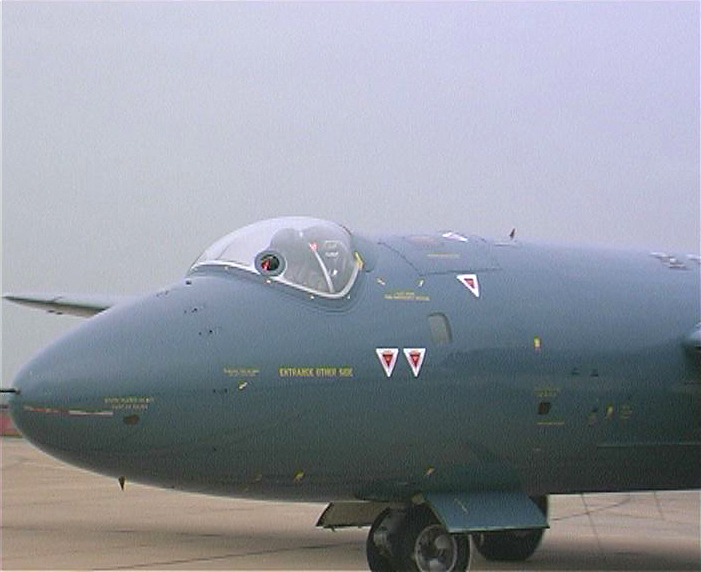 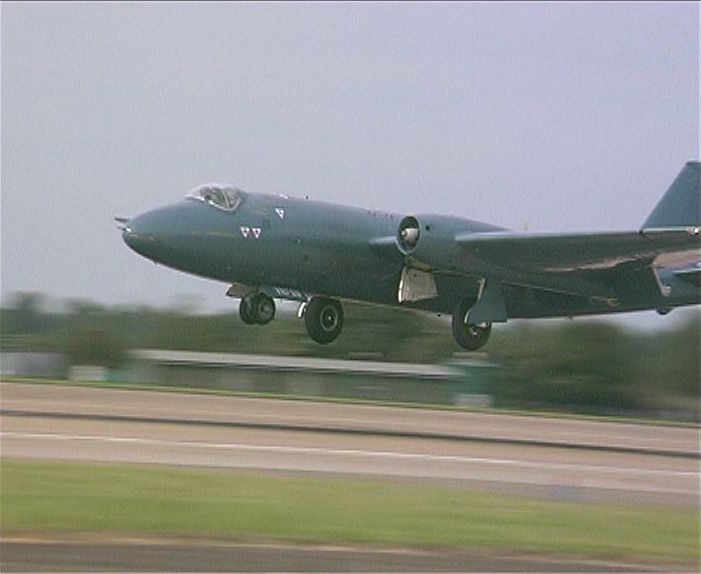 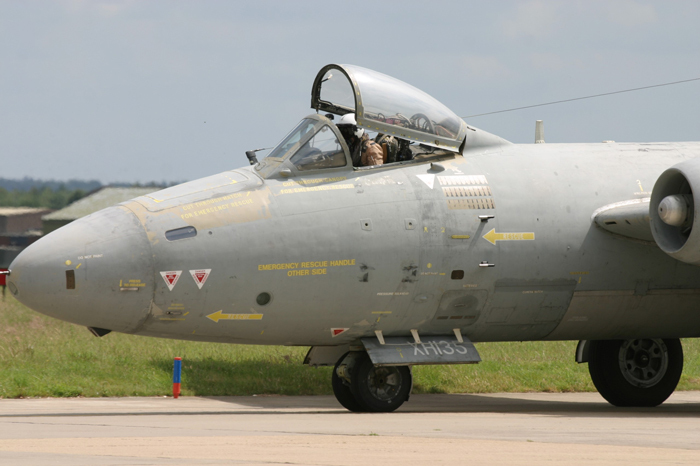 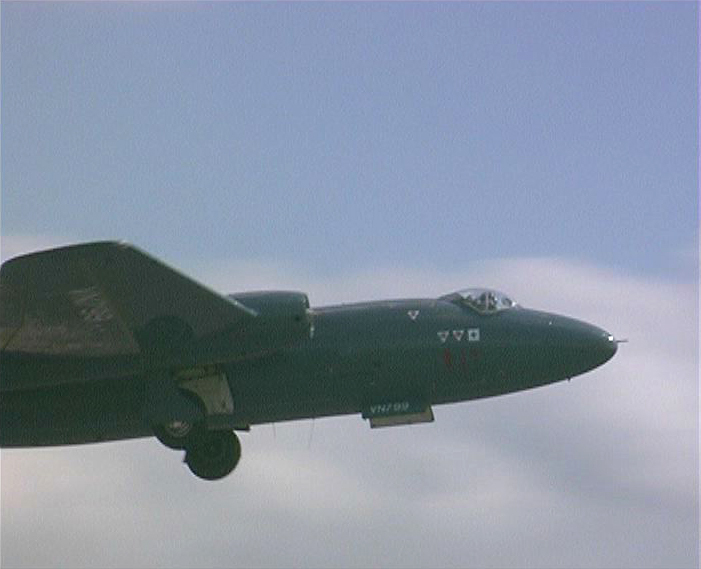 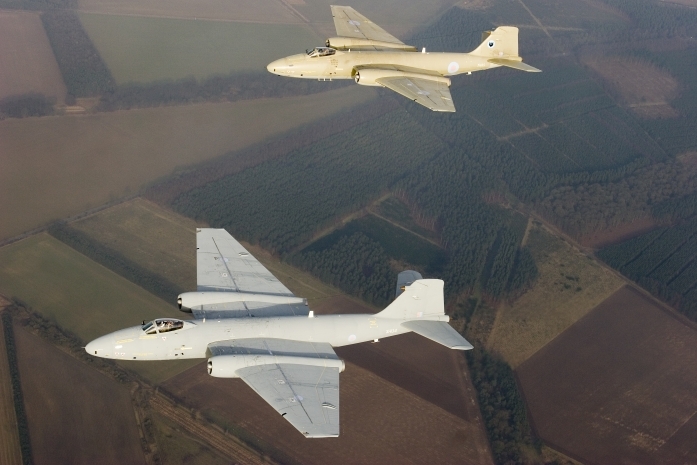 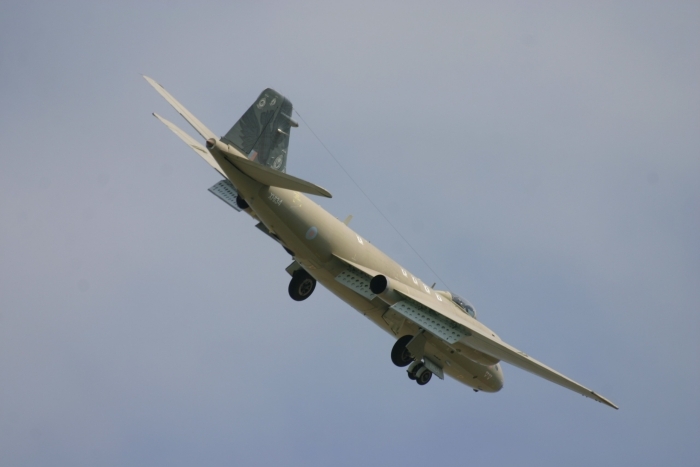 On 9th November 2005 Marham said goodbye to the RAF's last Canberra T4 WJ874/VN799. 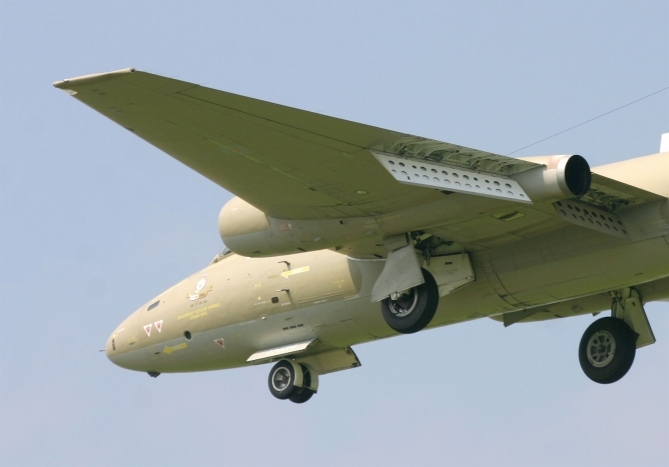 The aircraft (having been acquired by Coventry based Air Atlantique) was crewed by Flt Lt Mike Leckey (pilot) and Wing Commander Clive Mitchell OC 39 Sqn (navigator). 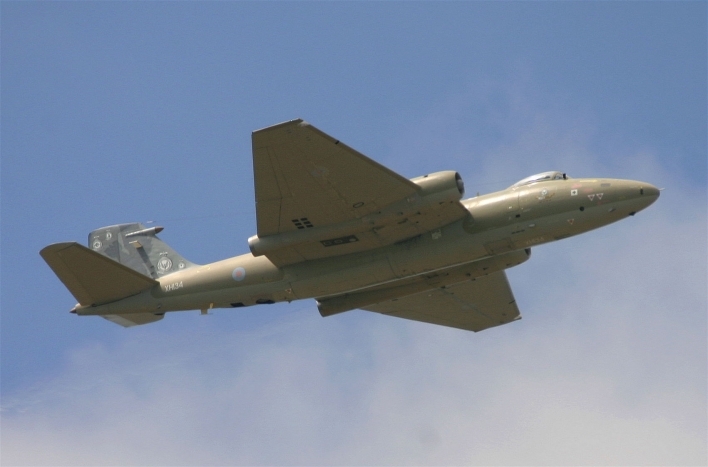 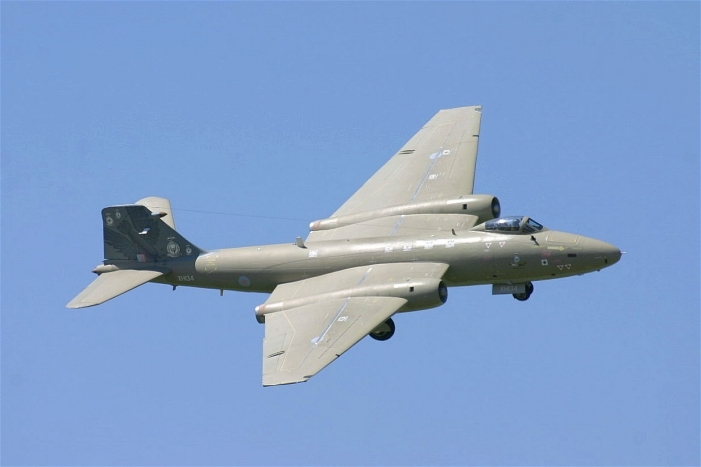 The T4 was retired from RAF service in September being the last Canberra of its type still flying with the RAF and hopefully will be seen gracing the skies alongside Canberra B2/6 WK163 in the future. 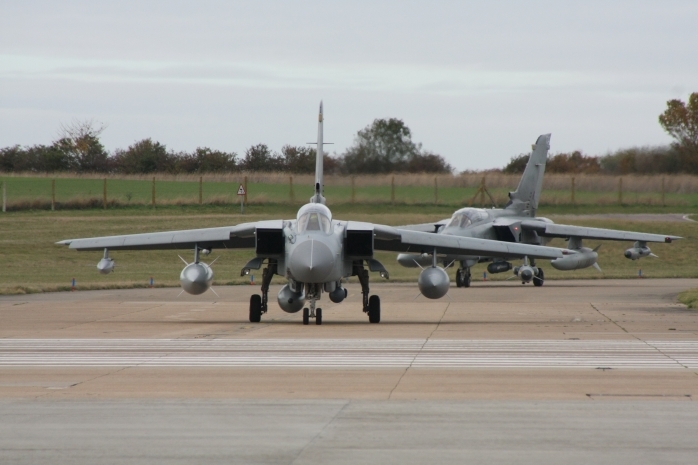 Finally the remaining three PR9s, XH130, XH134 and XH135 left RAF Marham for the last time inbound for their new home at Kemble Airfield in Gloucestershire which left Marham with its resident Tornado squadrons, 2 Squadron, 9 Squadron, 13 Squadron and 31 Squadron. 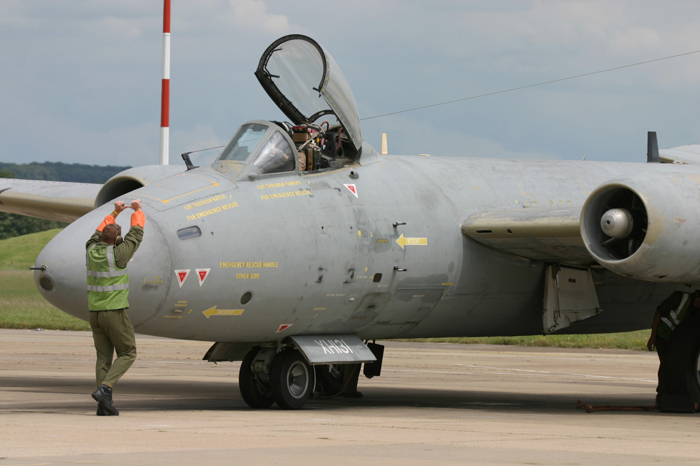 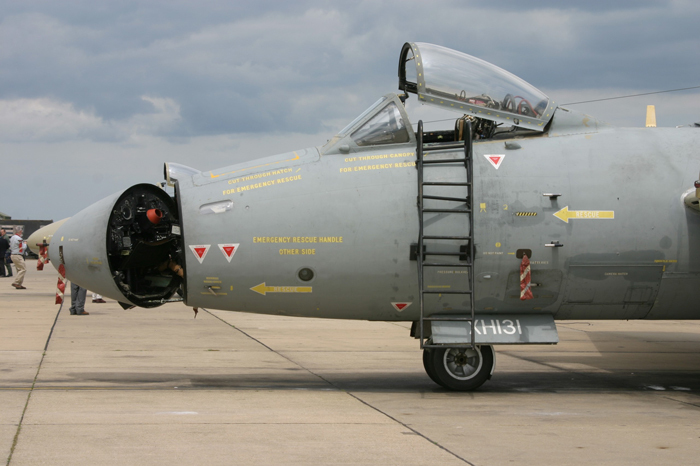 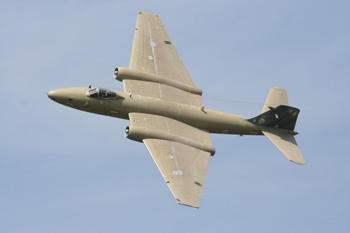 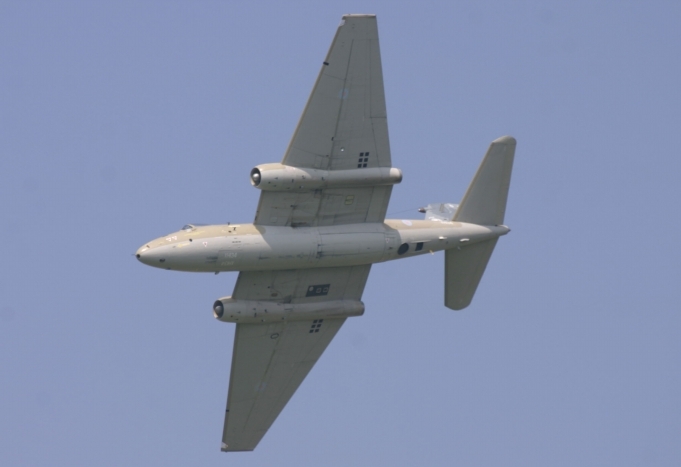 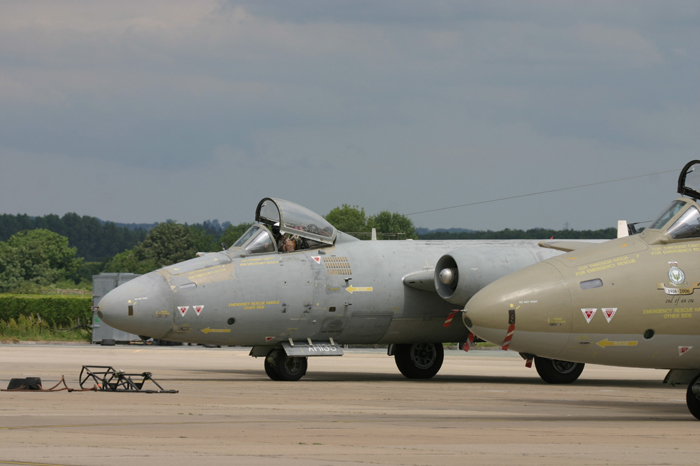 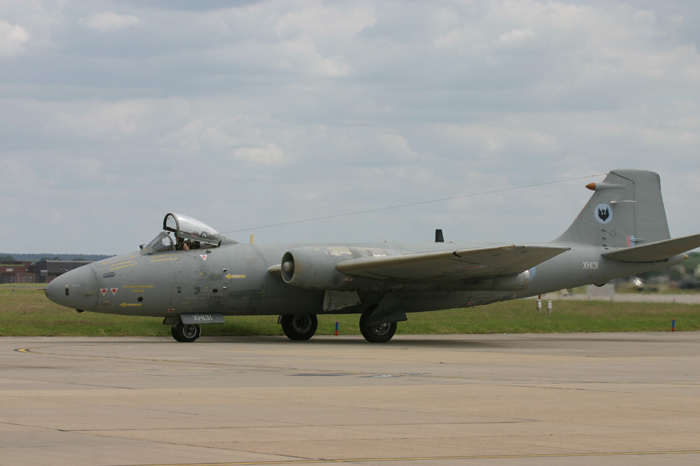 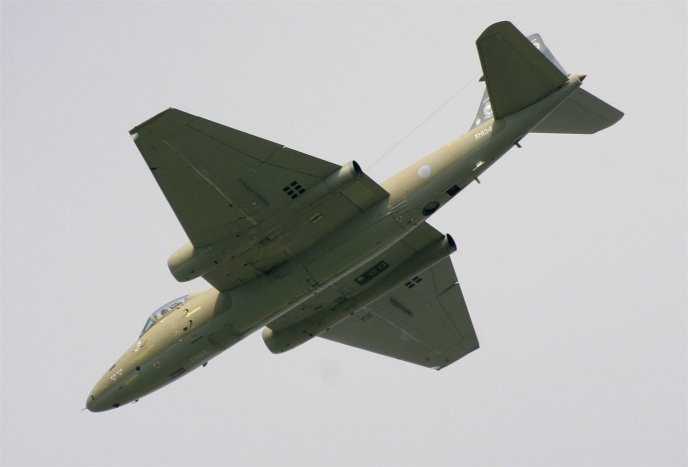 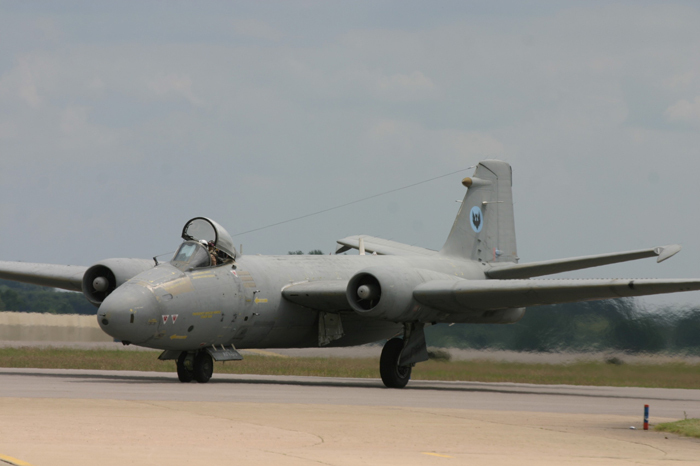 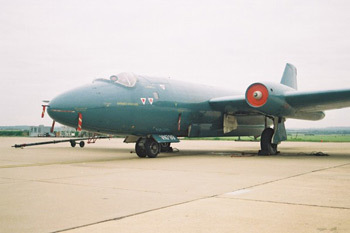 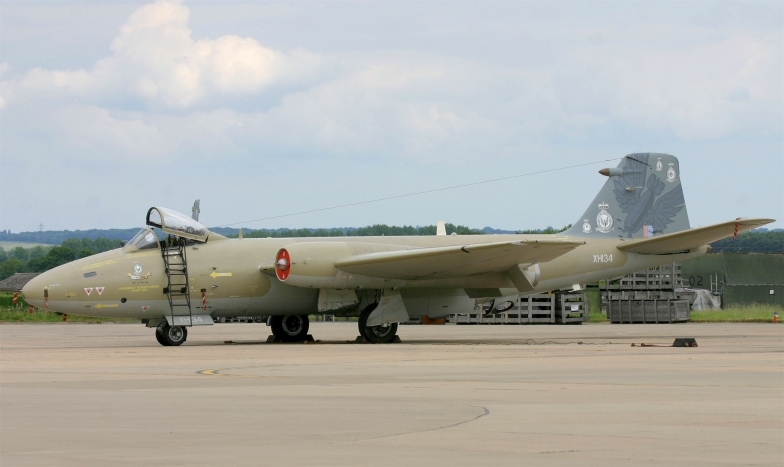 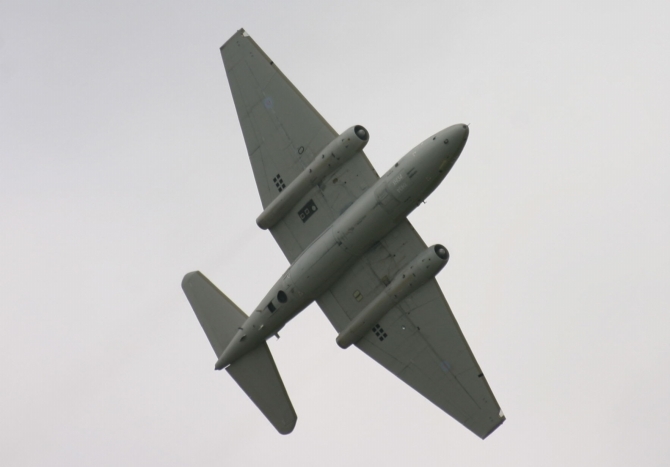 Canberra PR9 XH169, which was retired from service in 2006 and was used as a spares source to keep the other three aircraft operational. 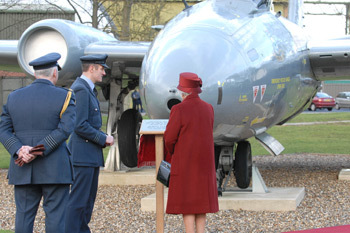 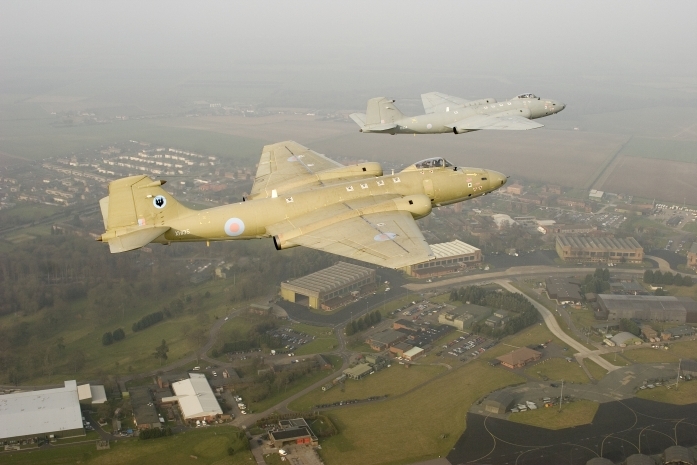 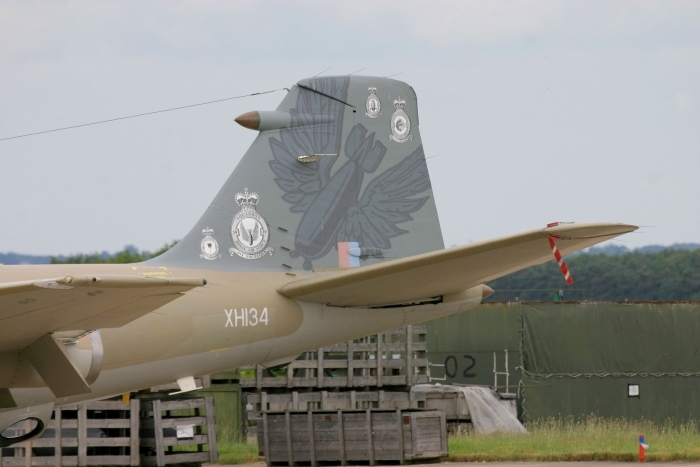 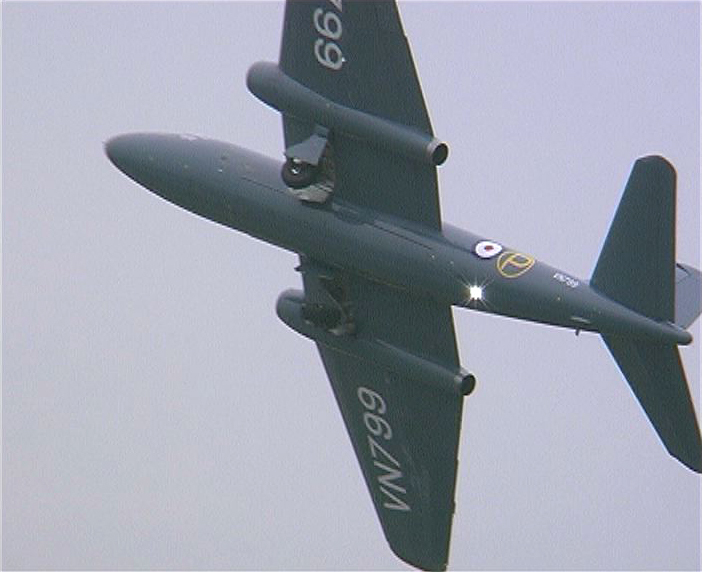 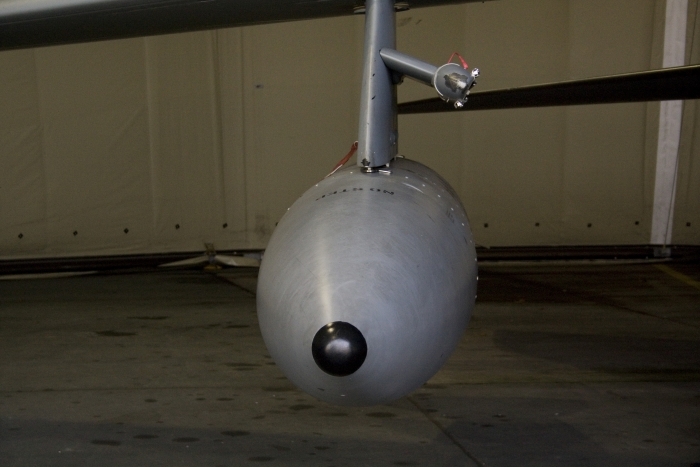 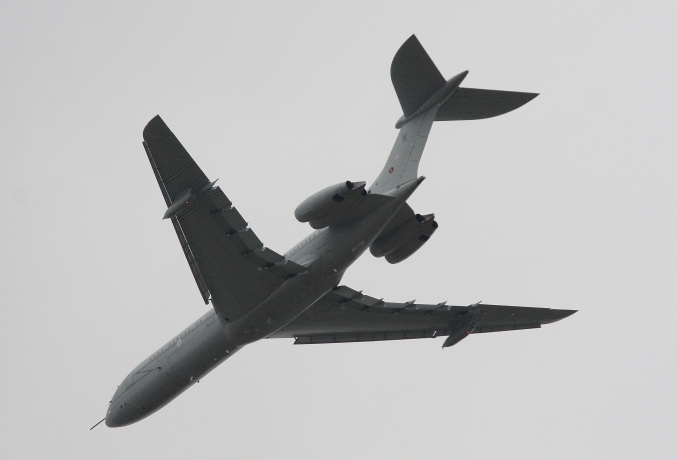 The aircraft was repainted in a grey gloss colour scheme with the same tail art as XH134 and was moved to and mounted on a purpose-built plinth next to the inner perimeter road at Marham, and on 4th February 2008 was unveiled by Her Majesty the Queen as a fitting memorial to the aircrew that served on the Canberra over the 55 years that the aircraft was in service with the RAF. 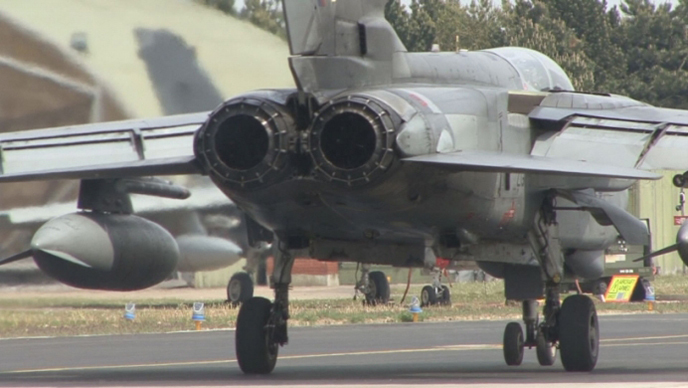 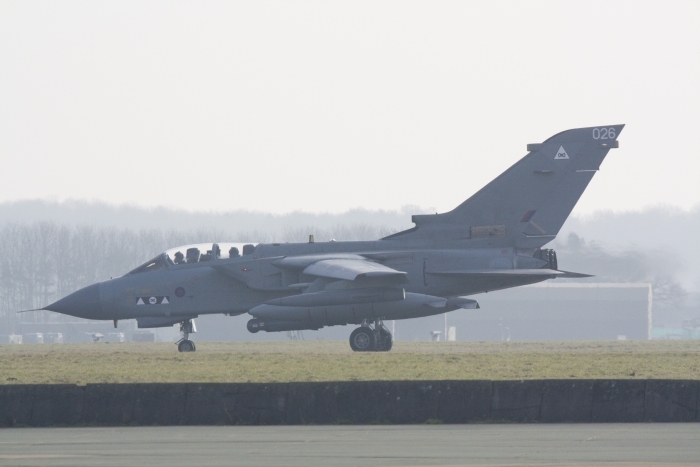 The last detachment of Tornados from Afghanistan arrived back at RAF Marham in Norfolk. 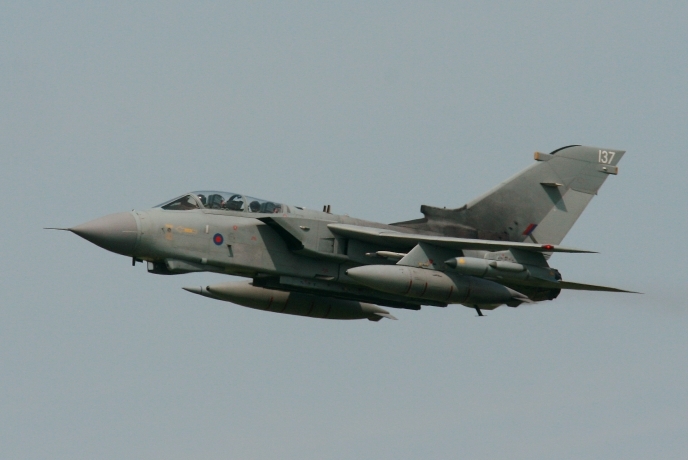 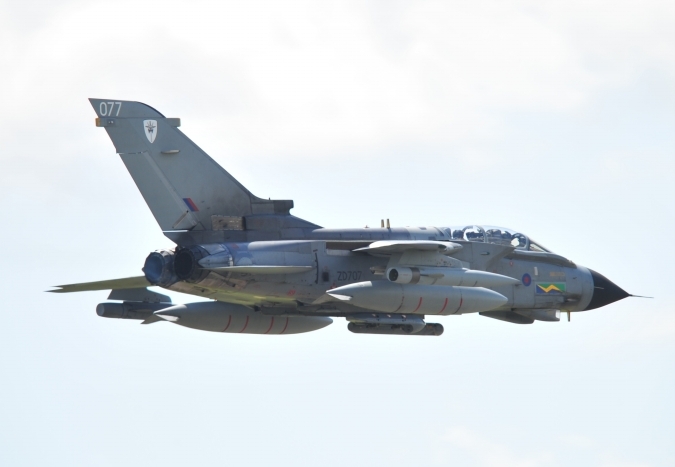 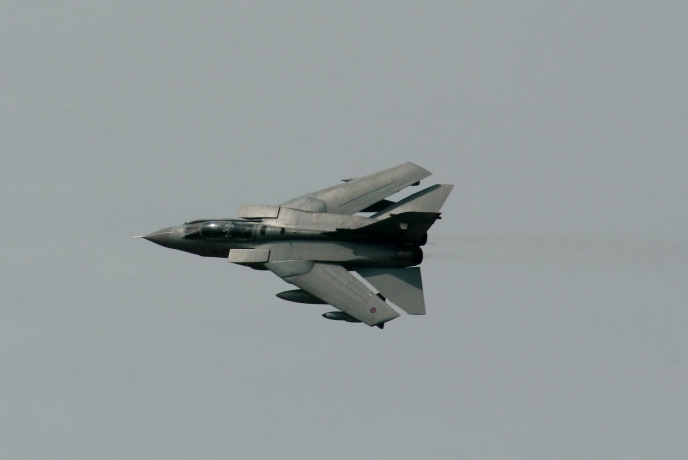 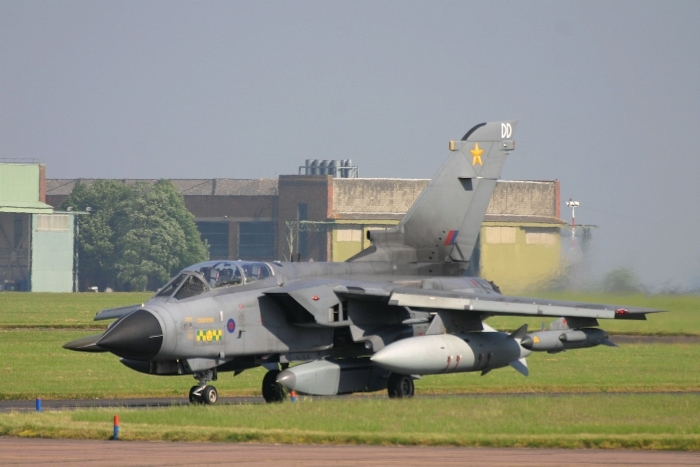 The aircraft were from 31 squadron (The Goldstars) which brought to an end Tornado operations in Afghanistan. 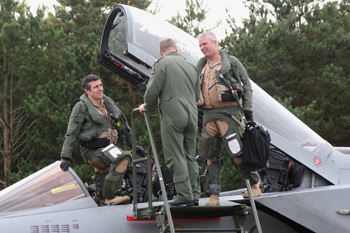 Wing Commander Richard Yates OC 31 Squadron and the rest of the crews were welcomed home by AOC 1 Group Air Vice-Marshal Gary Waterfall, Tornado Force Commander Air Commodore Dave Waddington and Marham's Station Commander Group Captain Harvey Smyth. 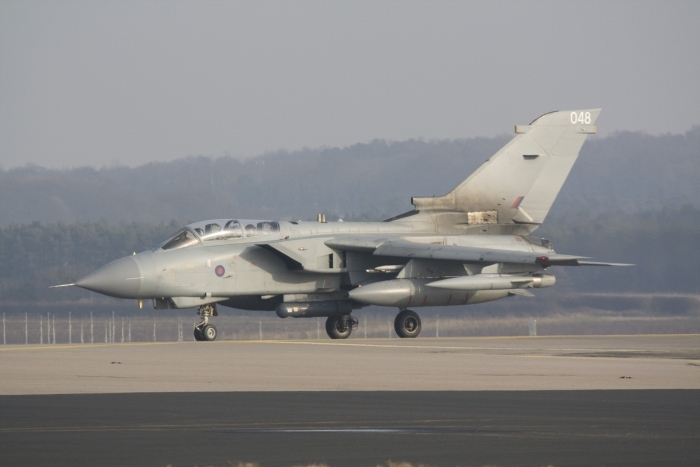 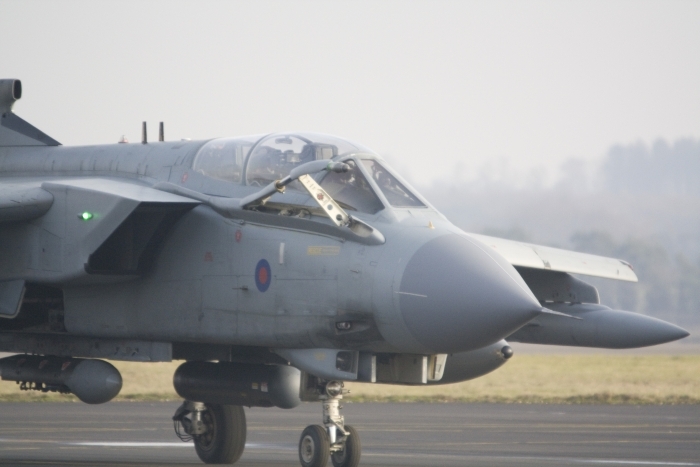 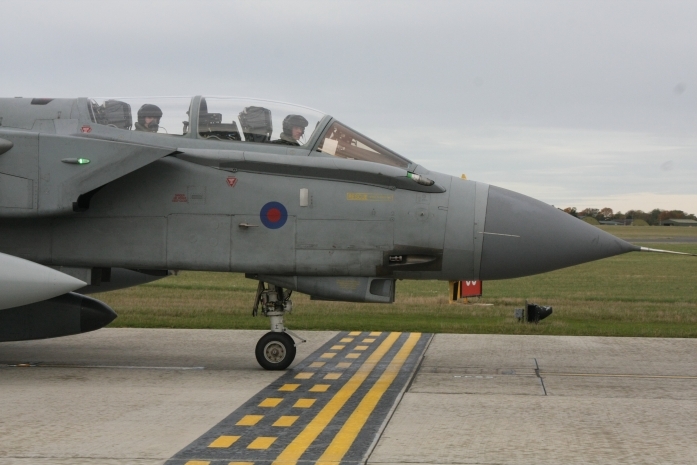 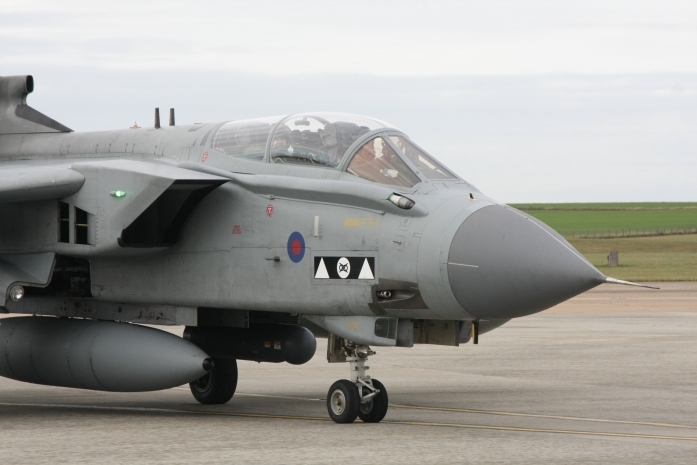 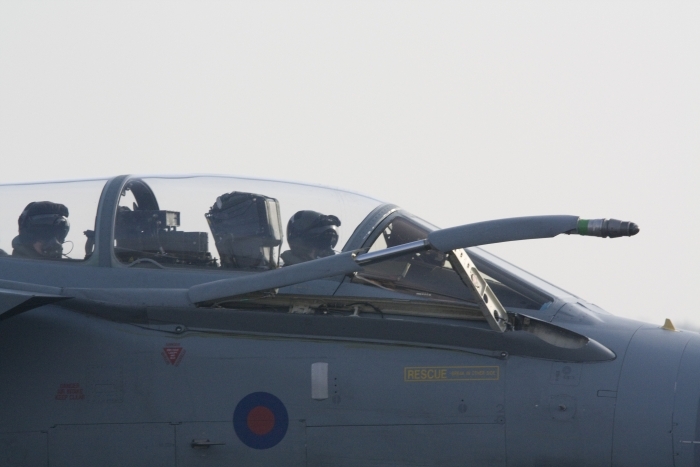 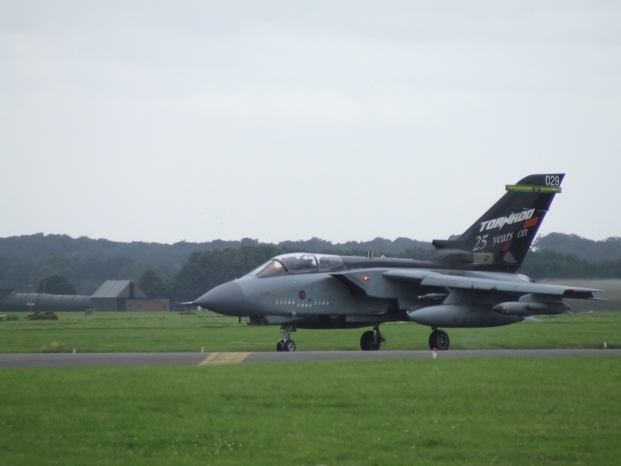 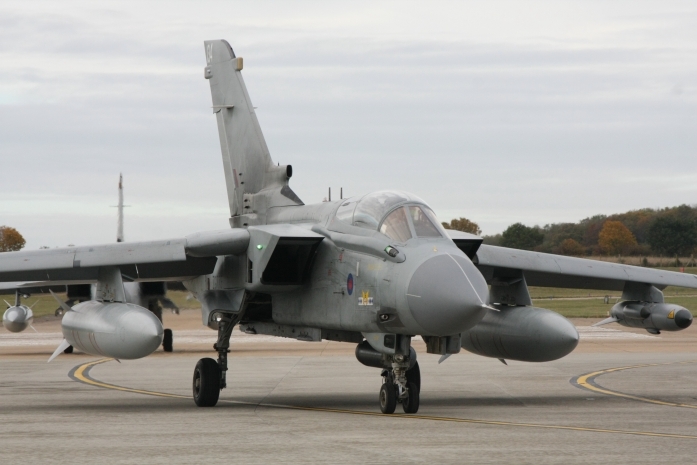 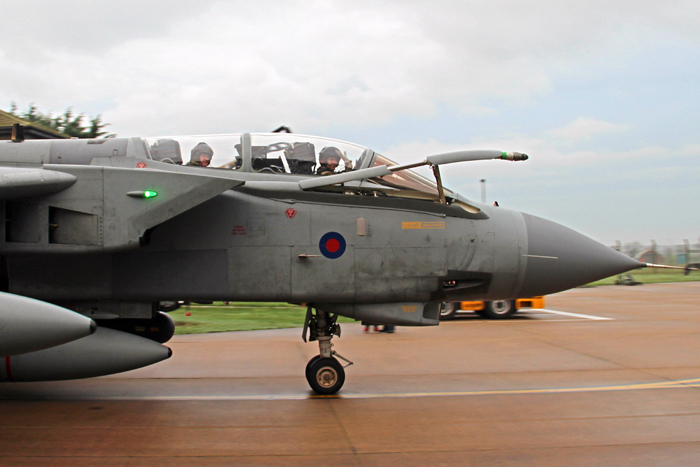 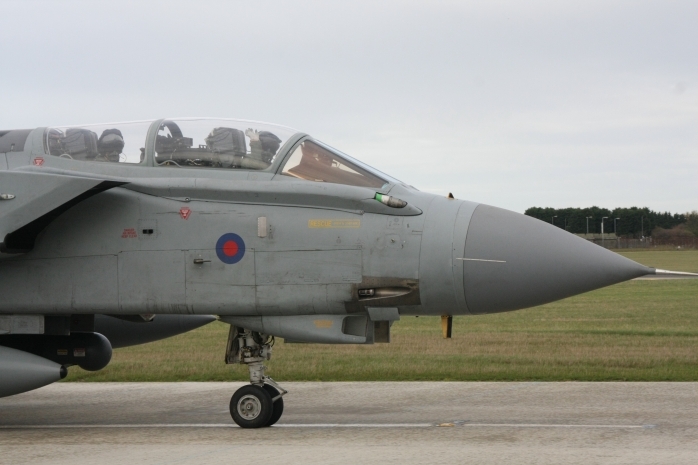 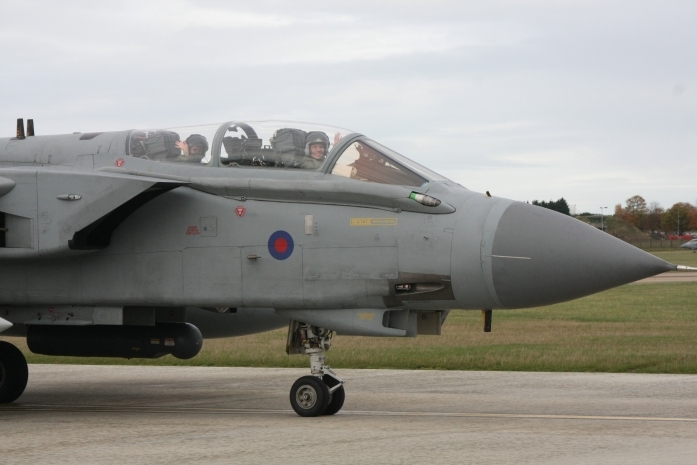 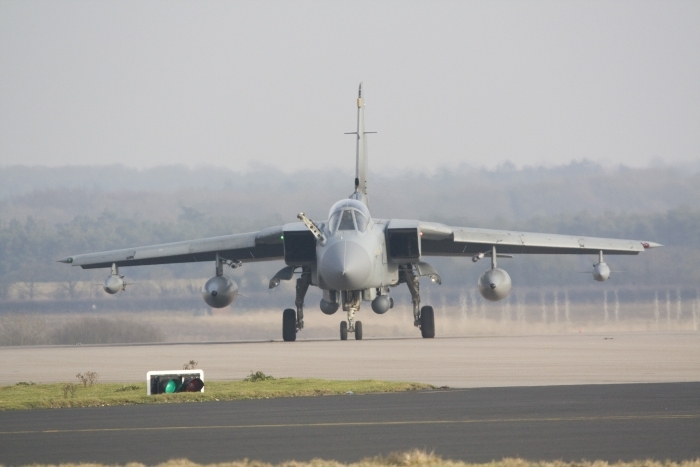 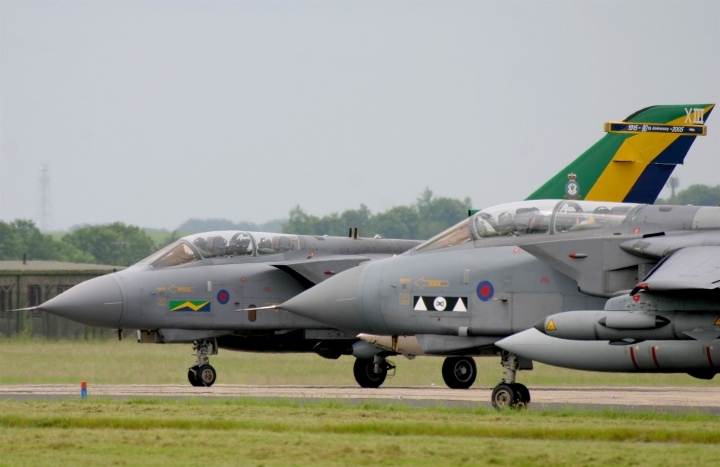 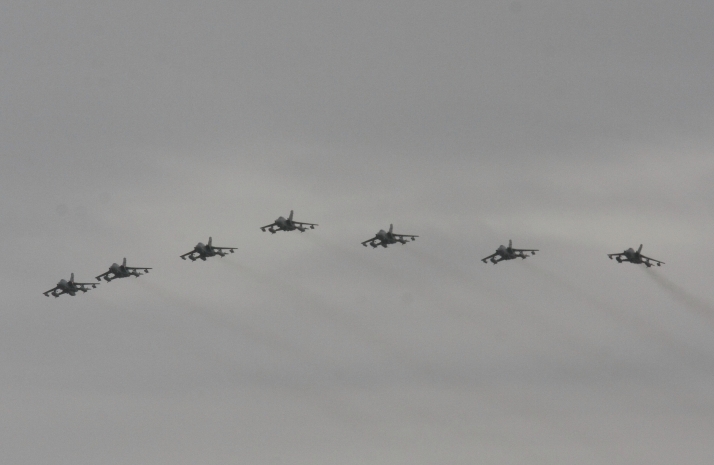 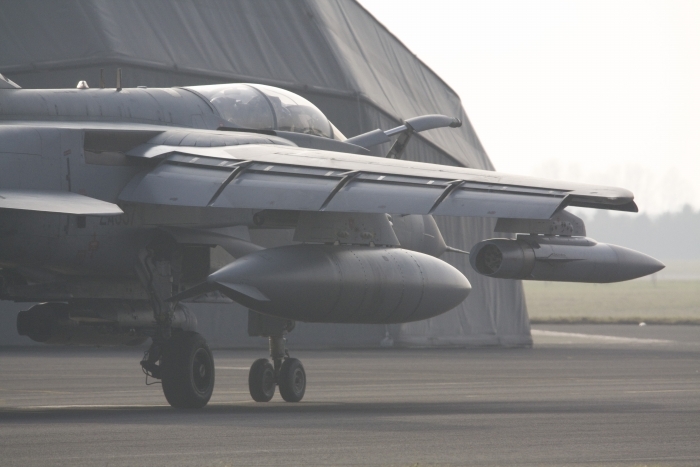 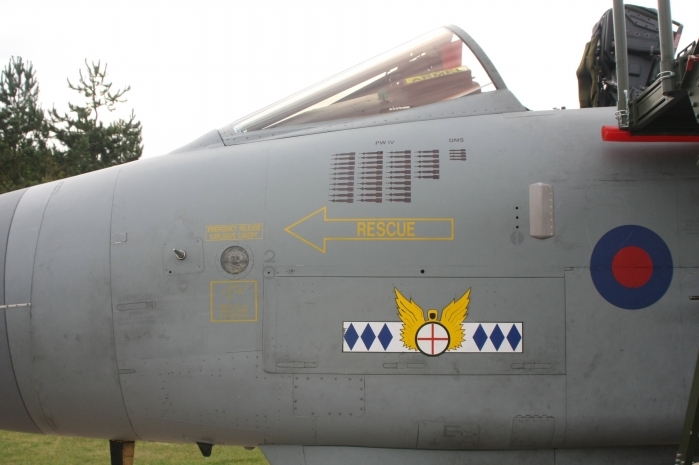 On 1st of November 2011 the last seven Tornado aircraft arrived back at RAF Marham from Gioia del Colle in Italy. 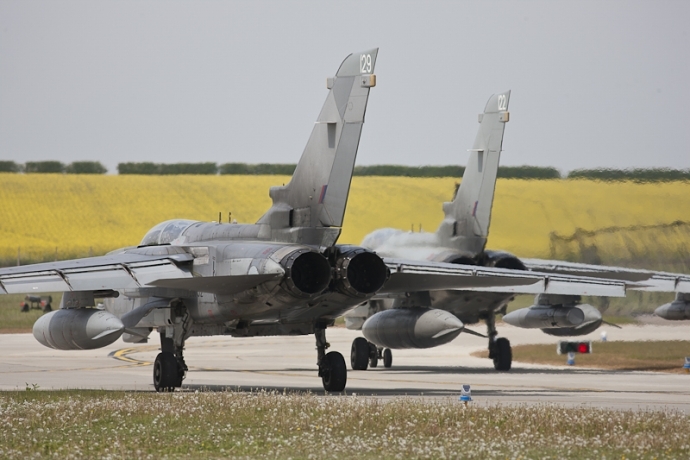 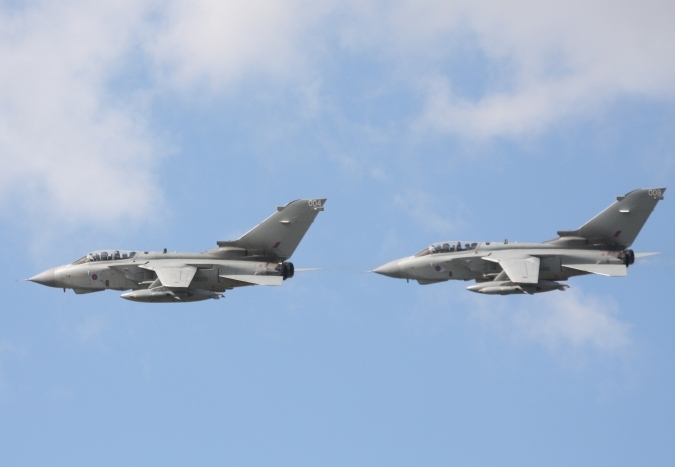 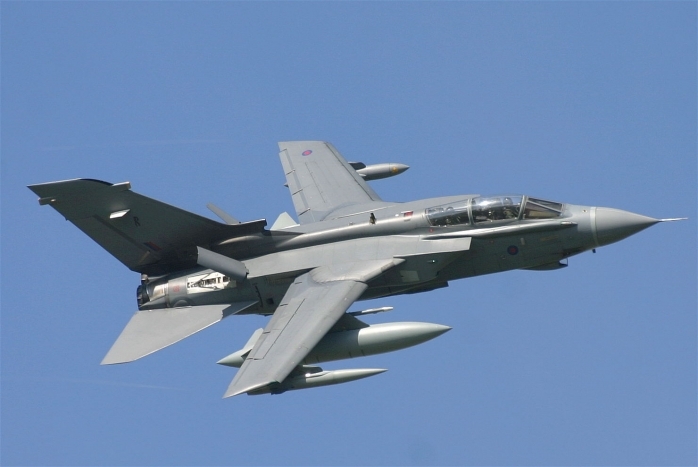 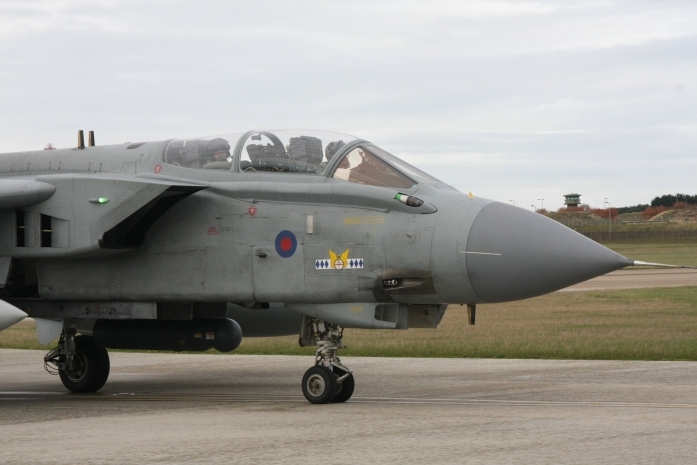 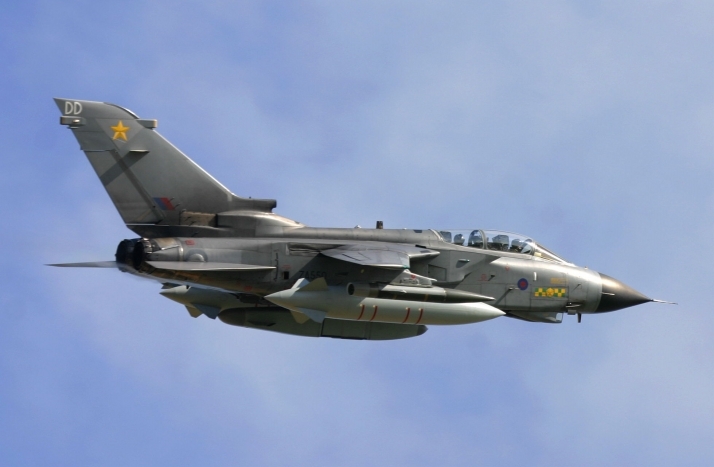 Tornados from RAF Marham and Lossiemouth have flown almost 1500 sorties and over 8000 hours during the conflict. 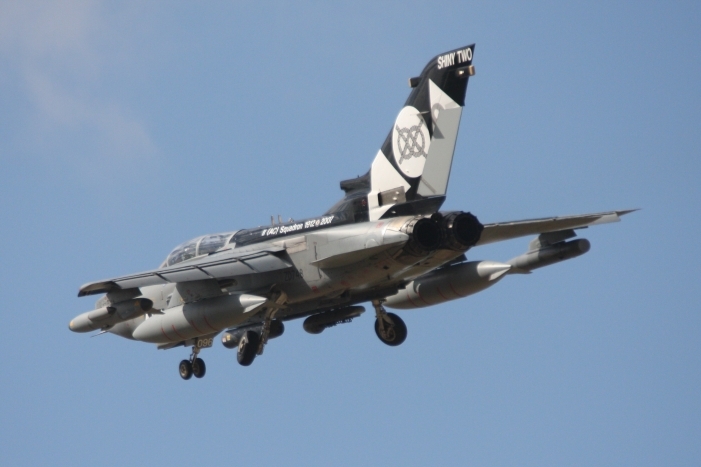 The Tornados first launched on 19th March 2011 and have taken part in missions to help and protect the civilian population from attacks. 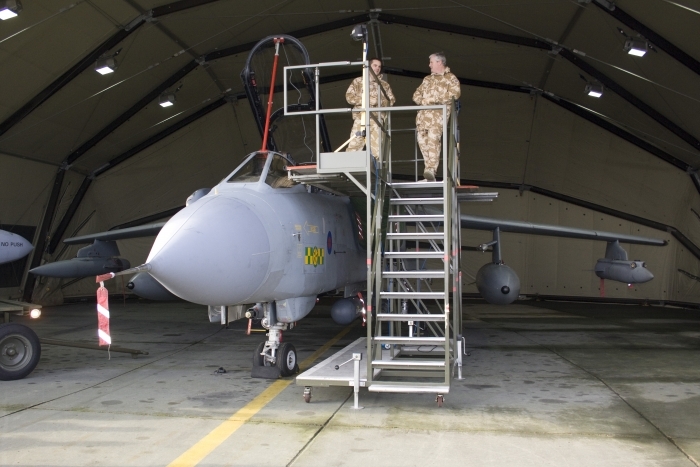 Over the last few months aircrews and engineers from both bases have put in a team effort to maintain and fly these aircraft. 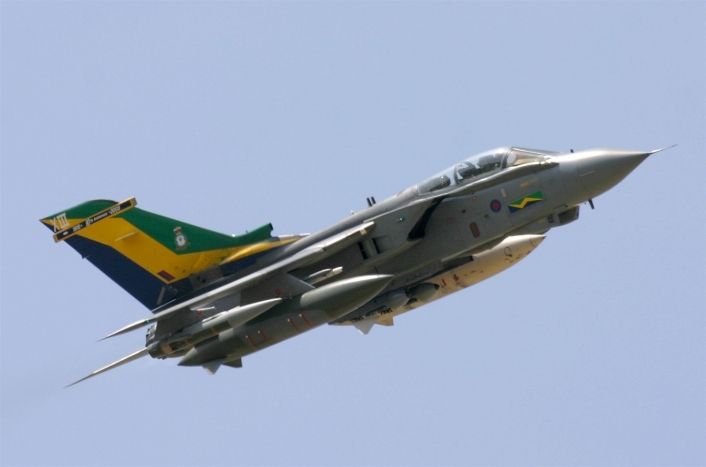 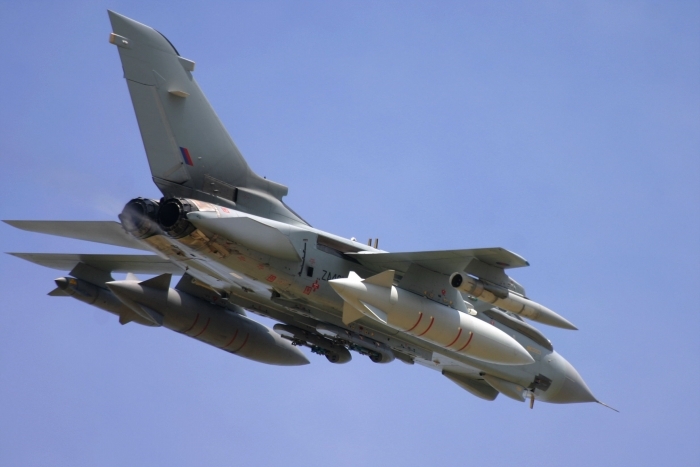 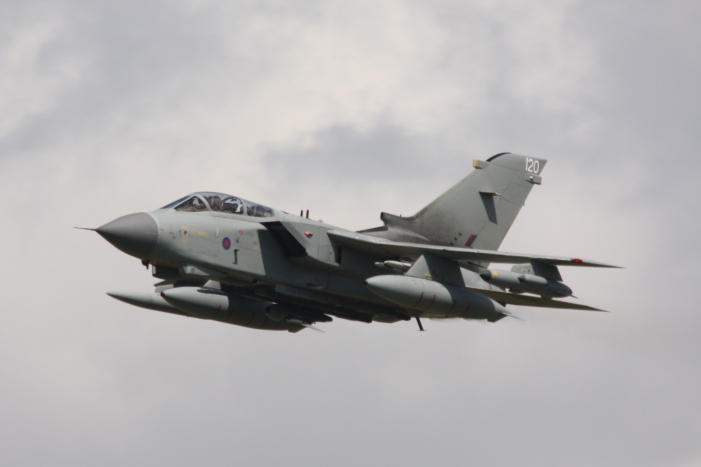 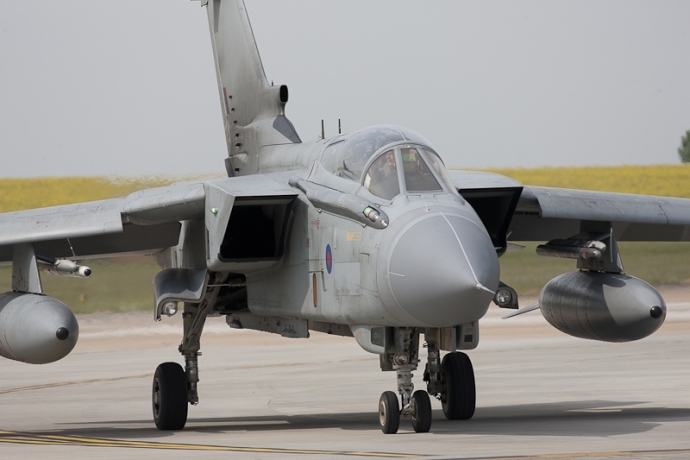 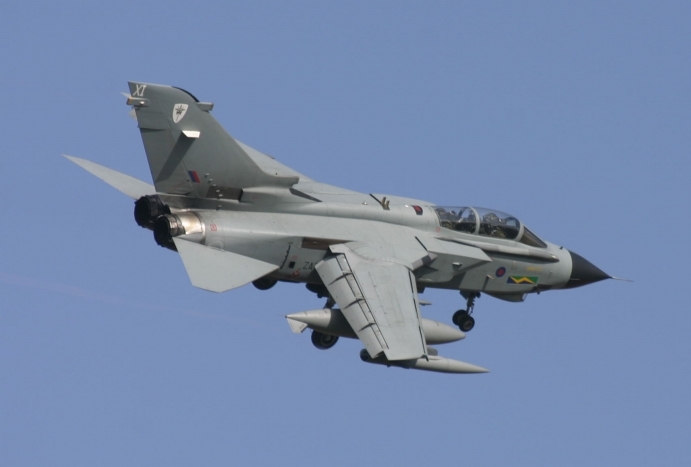 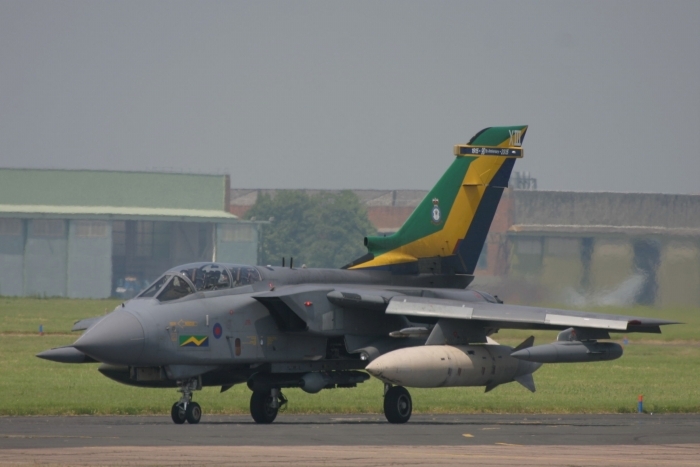 The Tornado's role in Libya was reconnaissance and surveillance as well as air strikes and the aircraft worked in conjunction with other aircraft such as VC10 tankers, E-3D tankers and Apache helicopters. 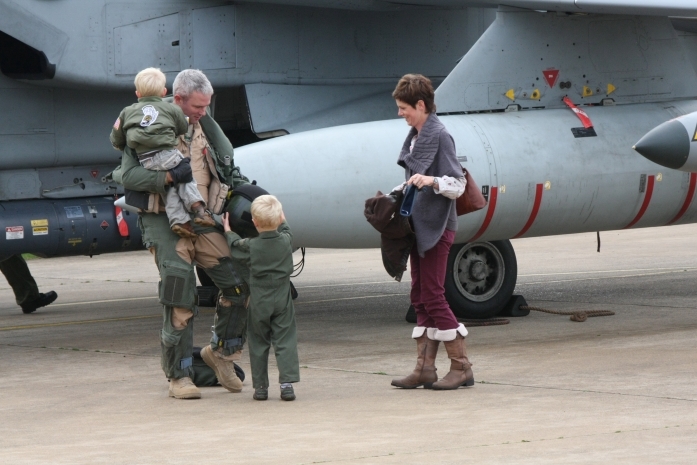 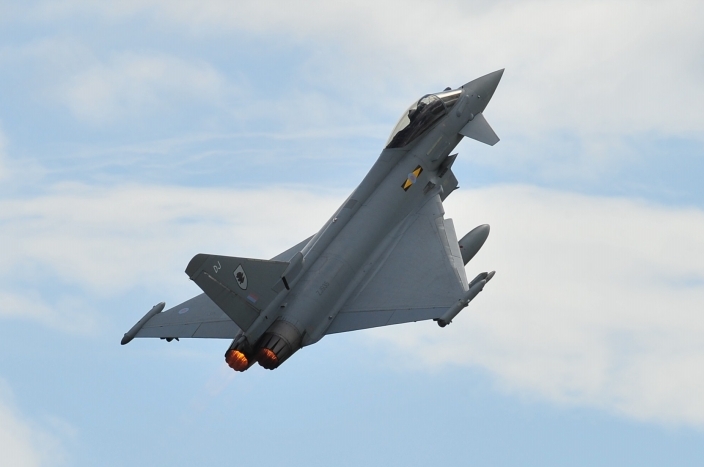 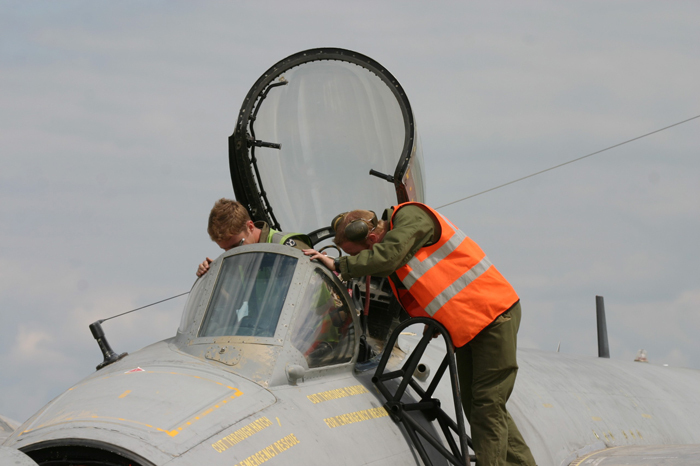 RAF Families Days are an event which are looked forward to, not only by the personnel from the station concerned but also their families and friends. 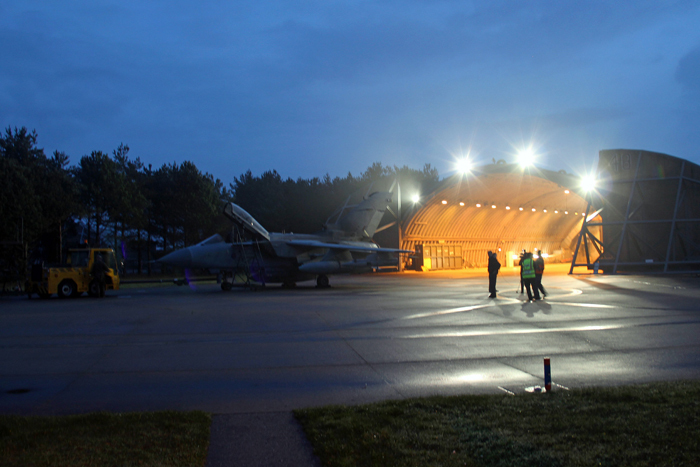 RAF Marham is no exception being the last RAF station in Norfolk. 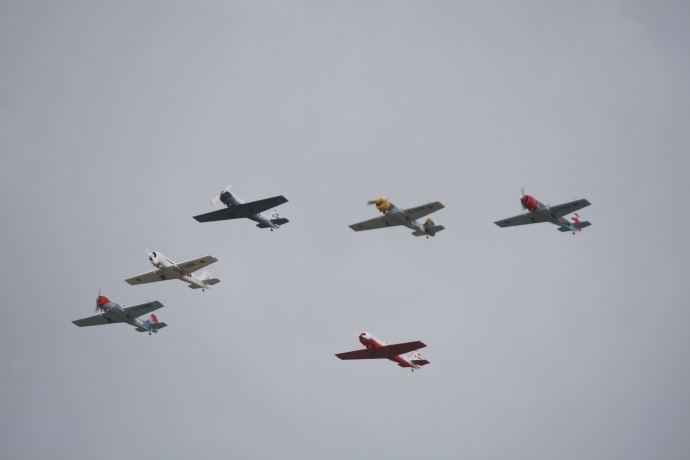 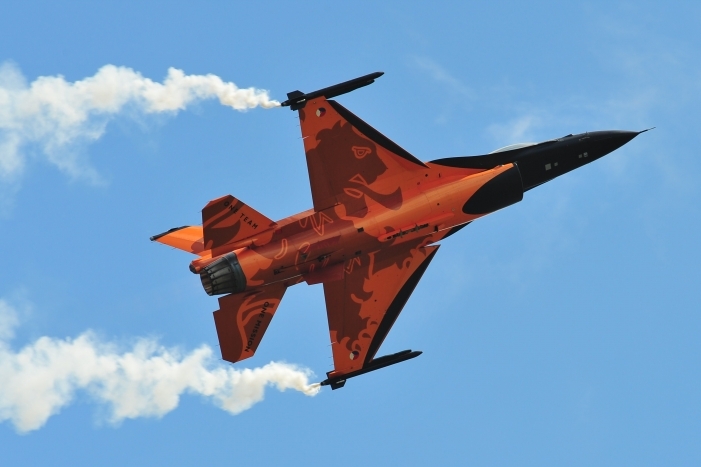 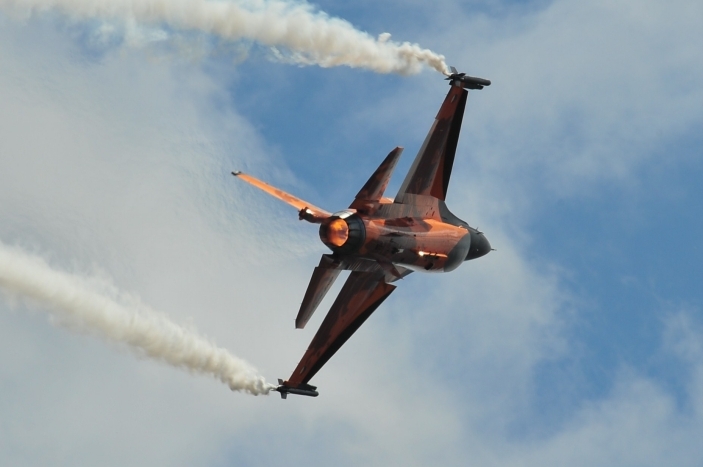 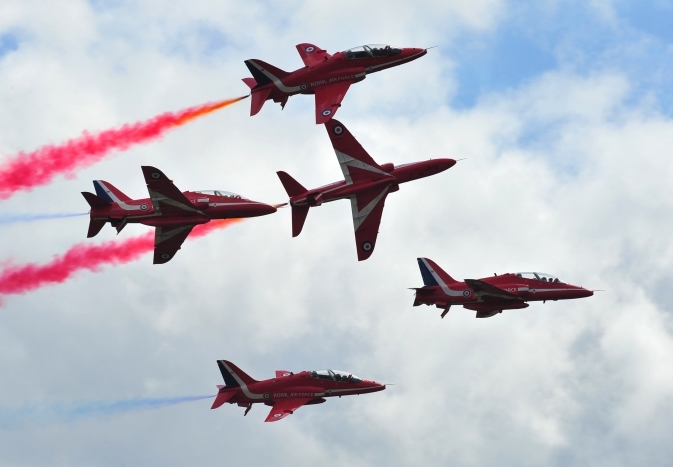 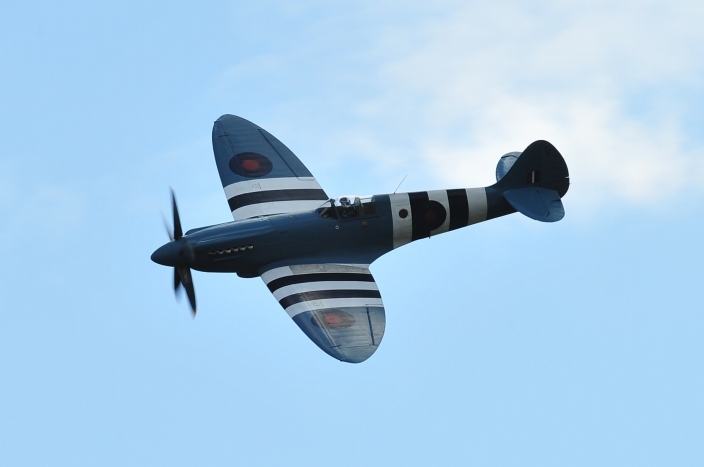 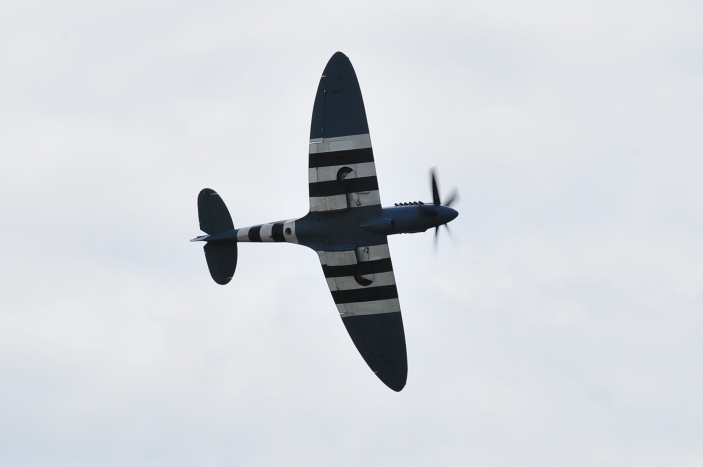 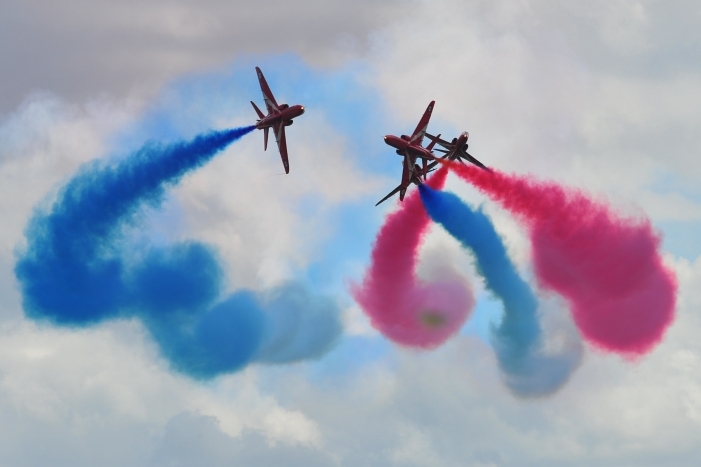 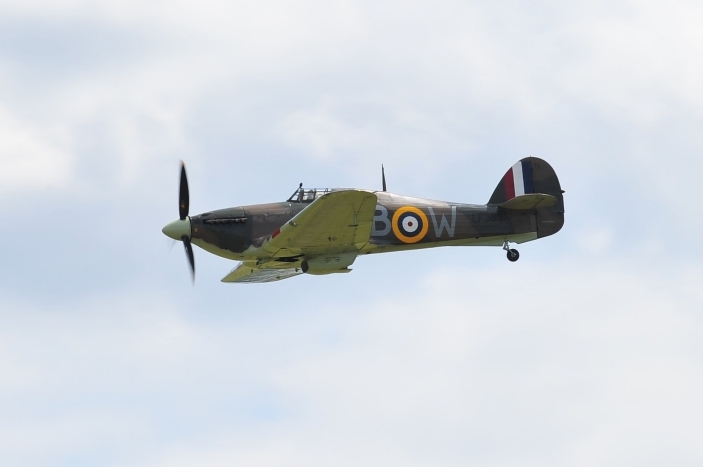 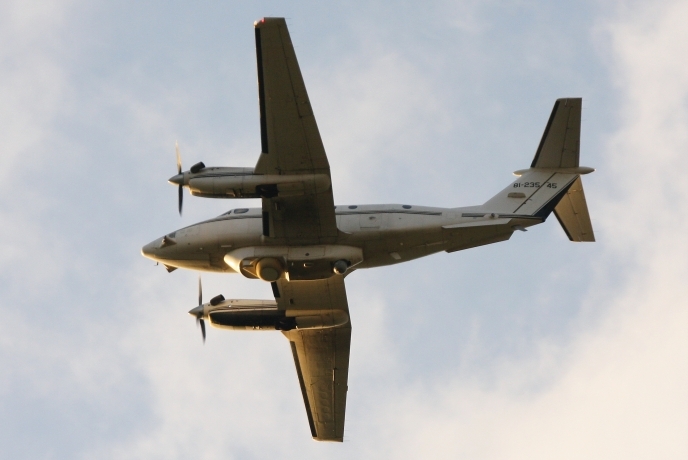 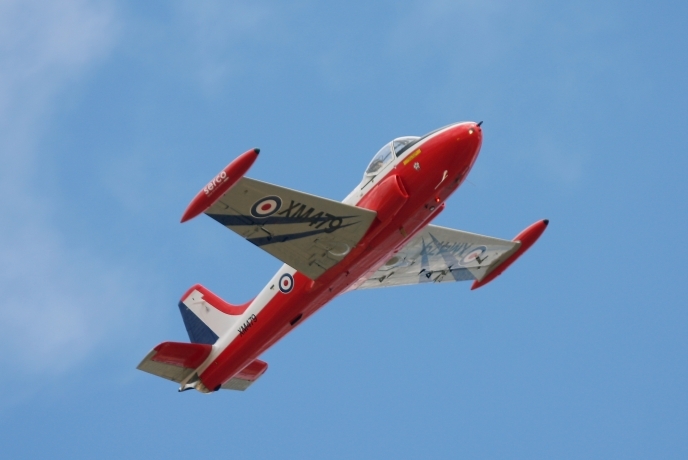 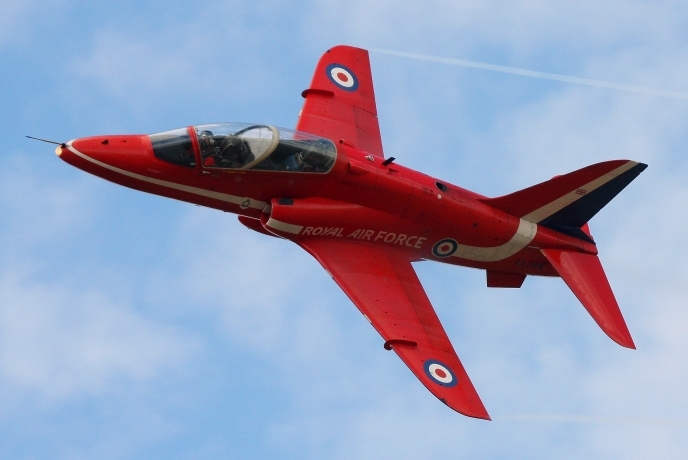 It also is one of the highlights of the summer for aviation enthusiasts and photographers, who can guarantee if the weather holds out a varied selection of flypasts and displays from visiting aircraft. 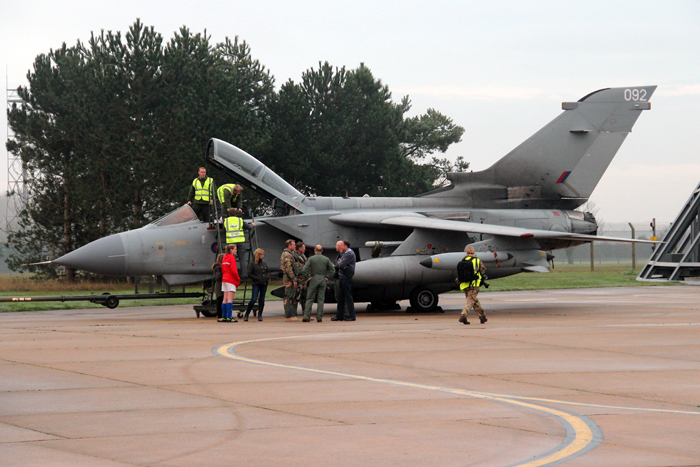 Aircraft appearing at Marham included The Red Arrows, a rare visit by a VC10 tanker, a display by The Aerostars and the Tornado GR4 role demo. 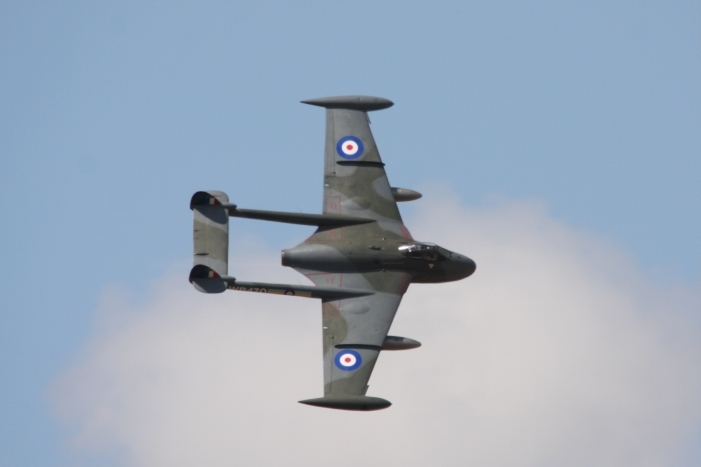 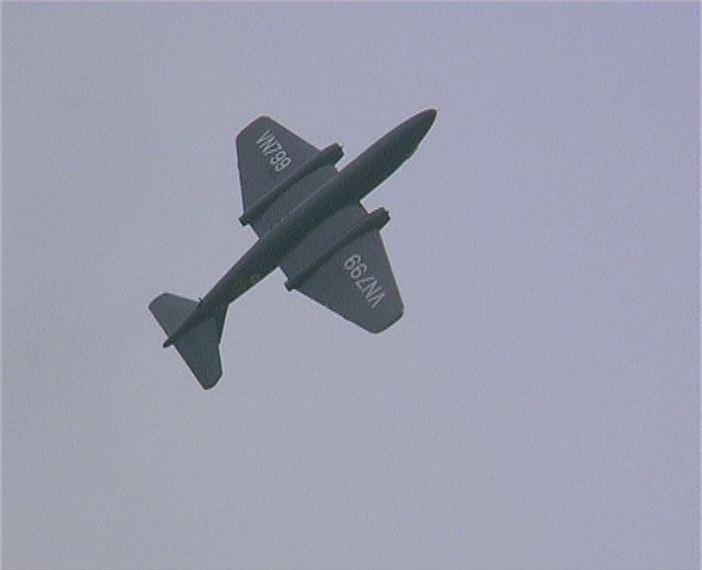 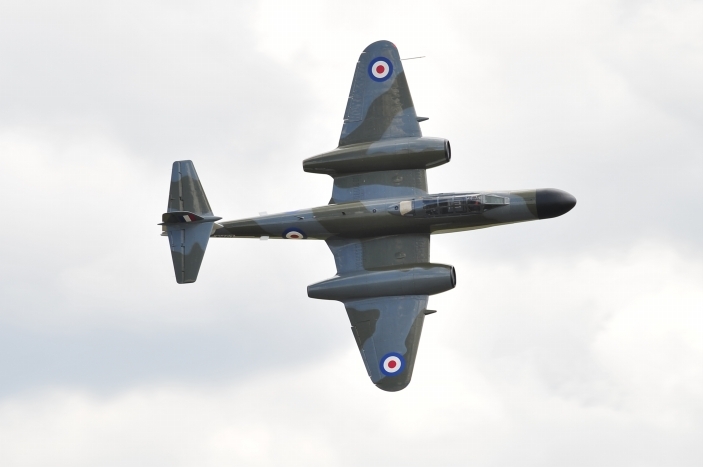 Also of note were the solo displays and flypasts by the Hunter, Jet Provost, F-16, King Air and A-10. 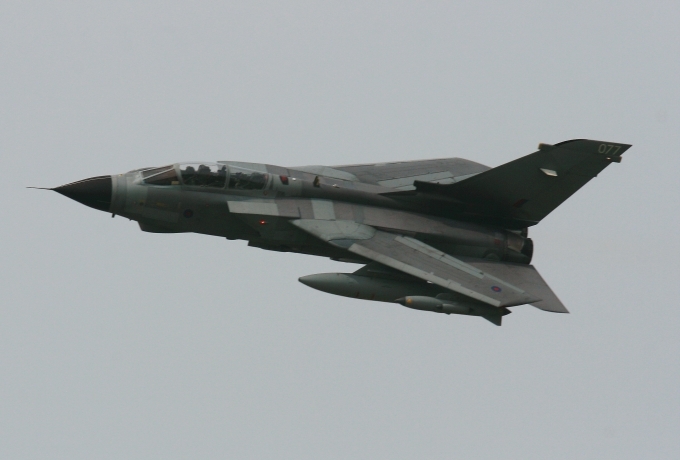 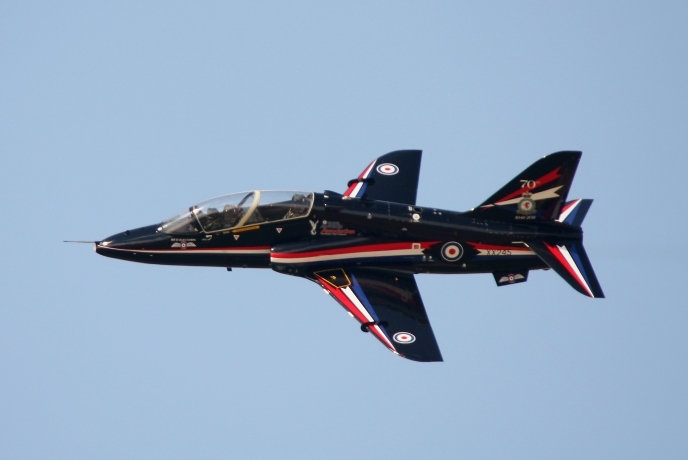 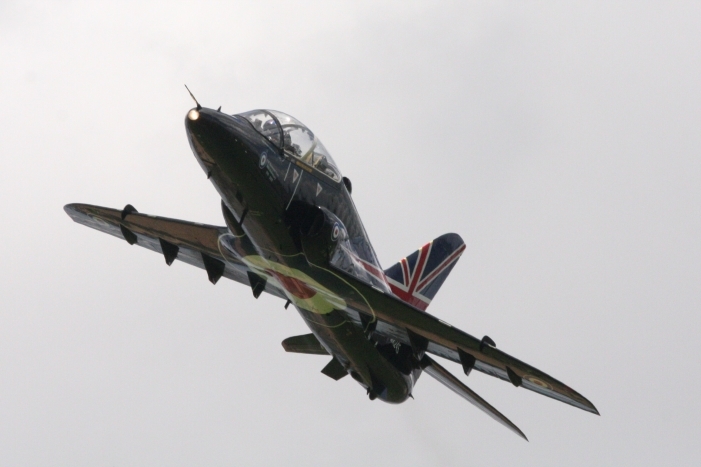 Not forgetting the RAF Hawk T1 flown by Flt Lt Jules Fleming, formally a Tornado pilot on 31 Squadron here at Marham. 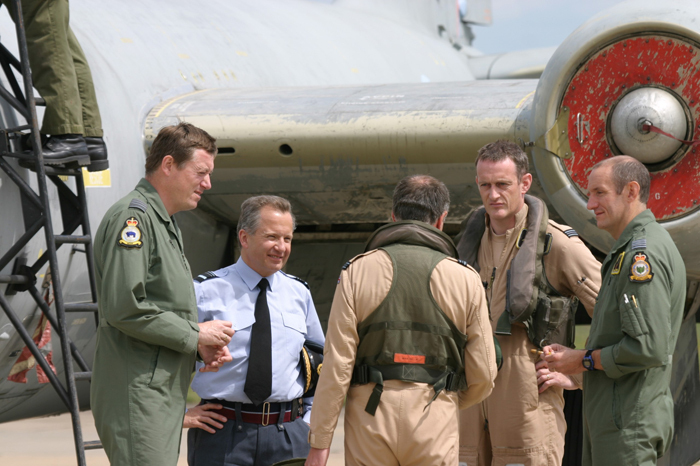 A first class event which brought together people from all walks of life and further strengthens relations between the RAF and the local community. 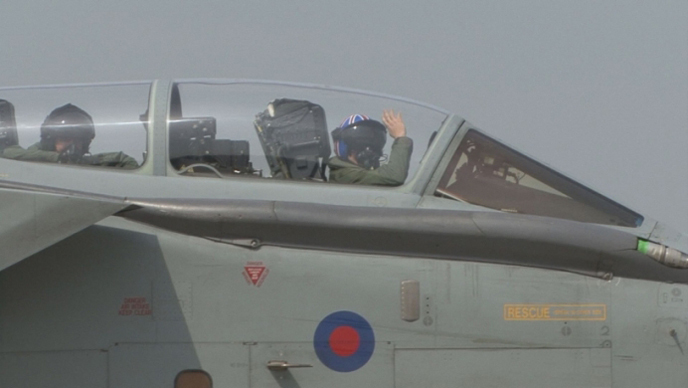 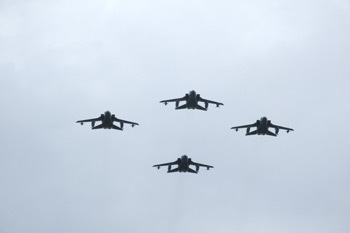 RAF Marham said a sad farewell to No. 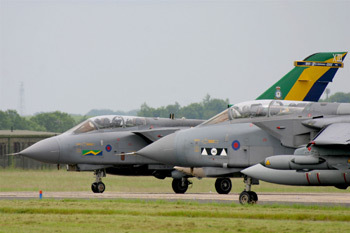 XIII Squadron (The Stabbed Cats) on 6th May 2011. 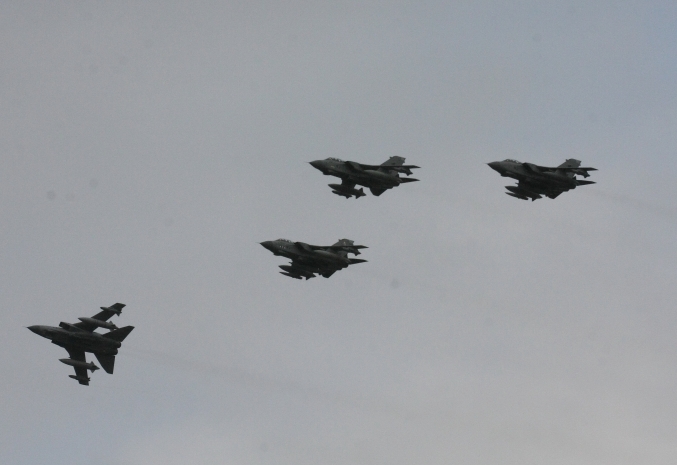 Six of the squadron's Tornado GR4 aircraft performed a formation flypast over the squadron's headquarters. 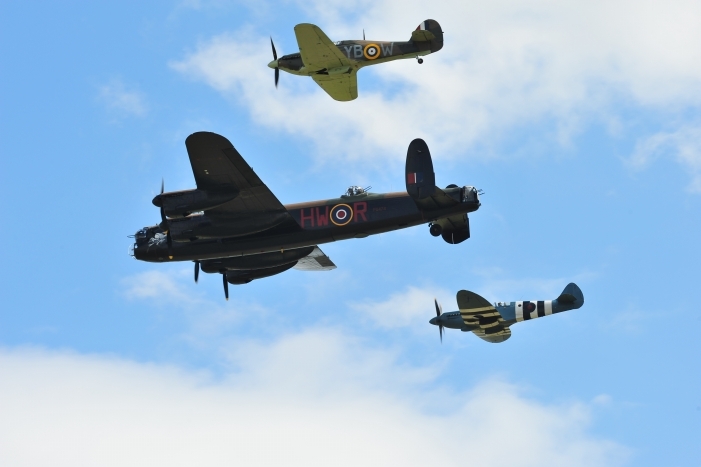 The aircraft then carried out flypasts at two of their old homes which were RAF Honington and RAF Wyton, before returning to Marham where they landed and taxied in to be greeted by their colleagues, families and friends, with the added bonus of several flypasts by the BBMF Lancaster. 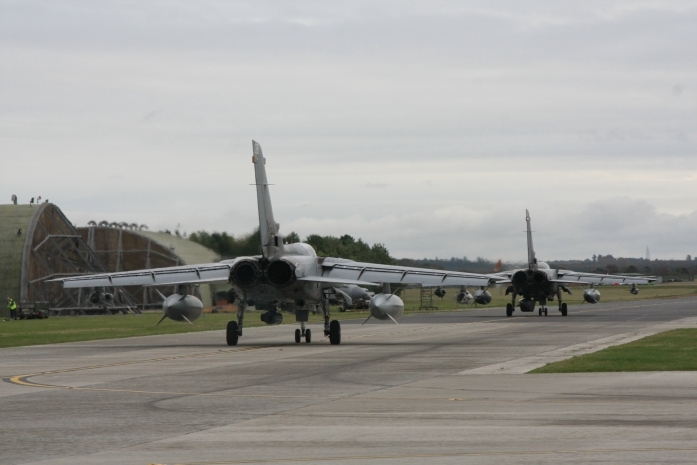 XIII Squadron took to the parade ground on 13th of May for their final parade, with their official disbandment on 1st of June 2011. 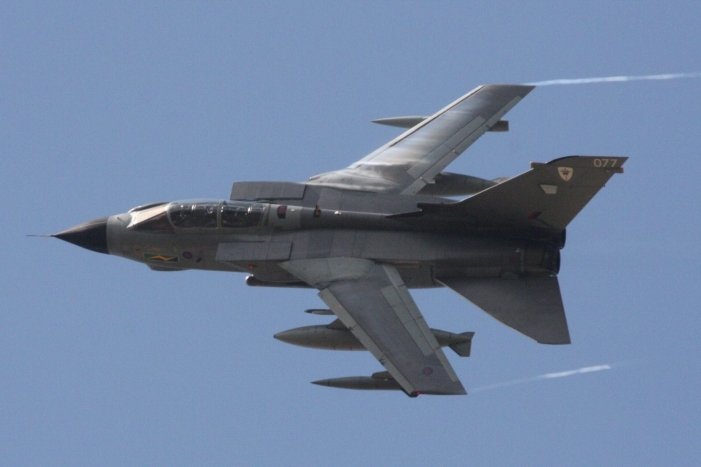 Which brought to an end, over a twenty year association with the Tornado and RAF Marham. 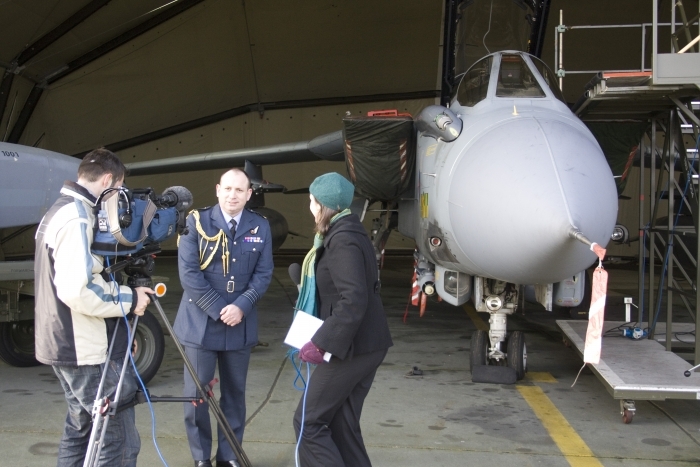 RAF Marham hosted a press and media event on Tuesday 26th January. 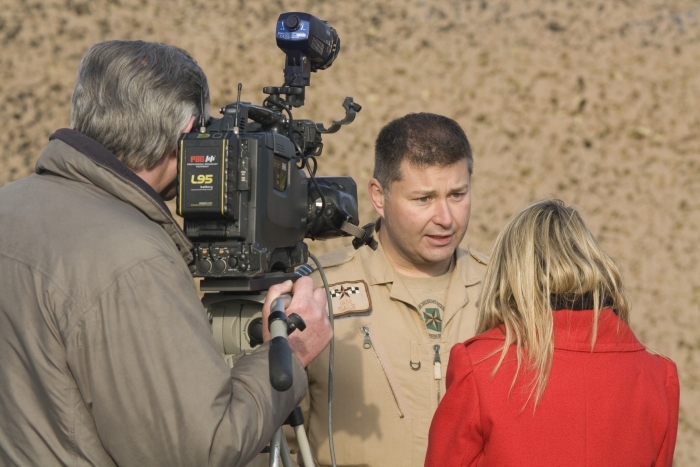 This event was arranged to introduce the media to No. 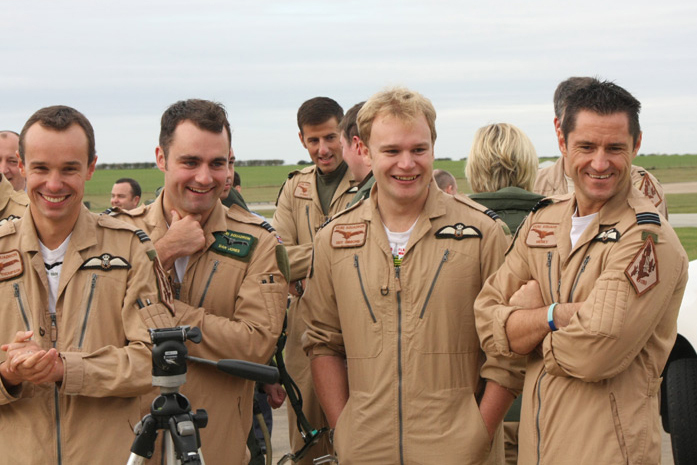 31 Squadron, who have just returned from a three month tour in support of Operation Herrick in Afghanistan. 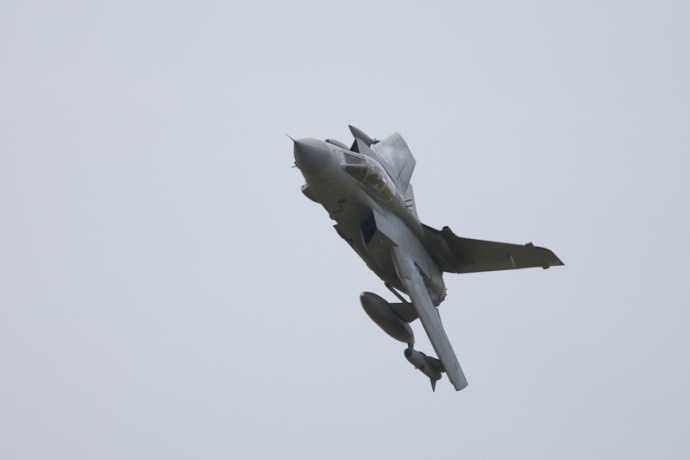 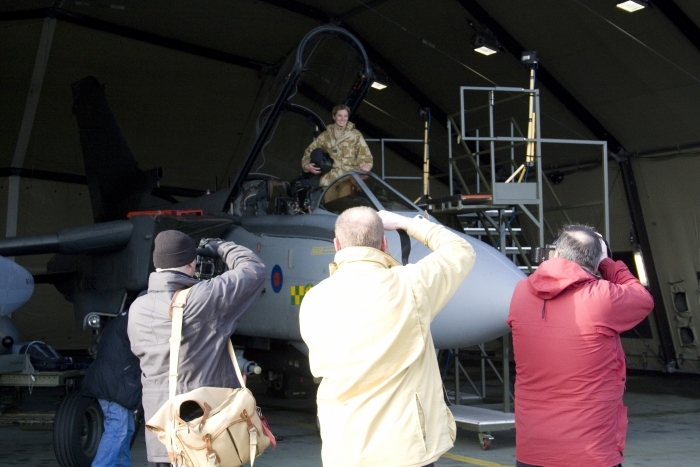 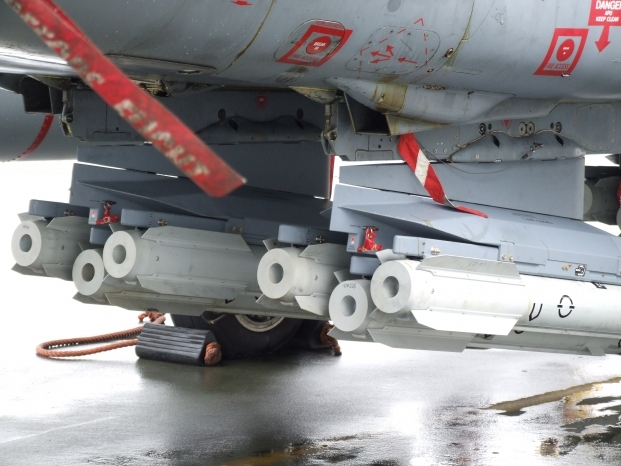 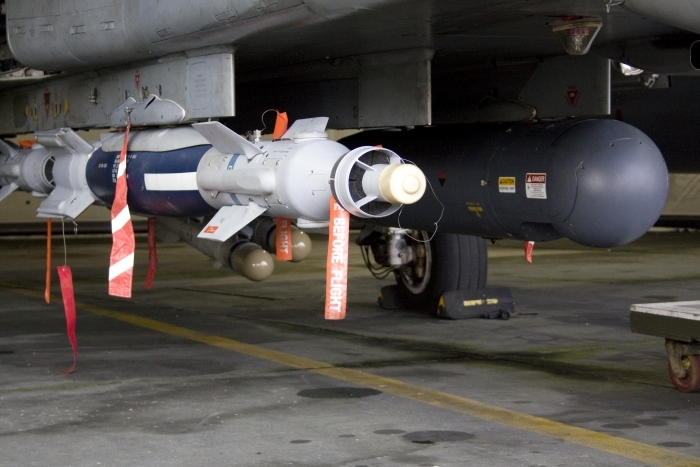 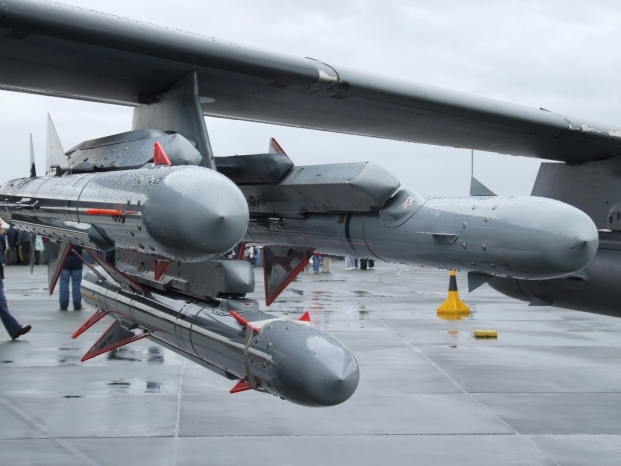 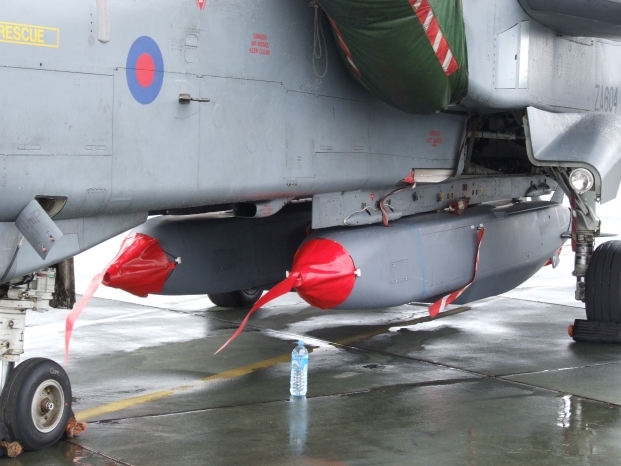 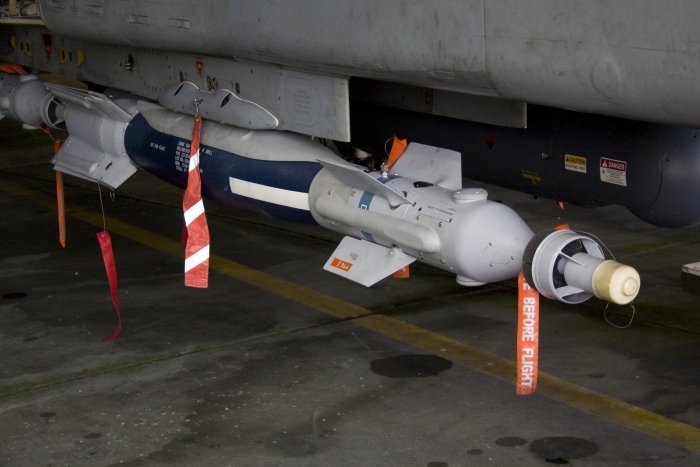 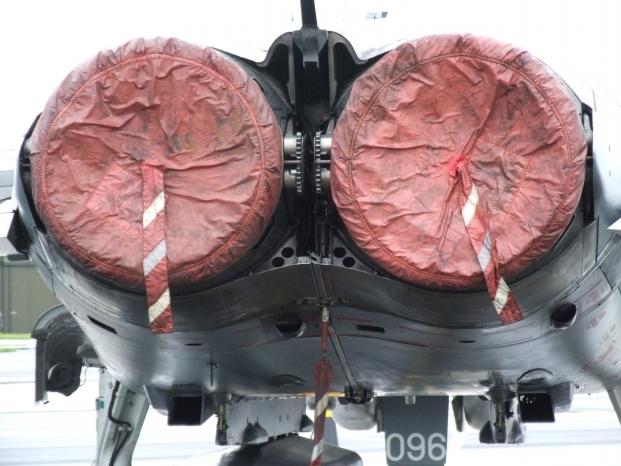 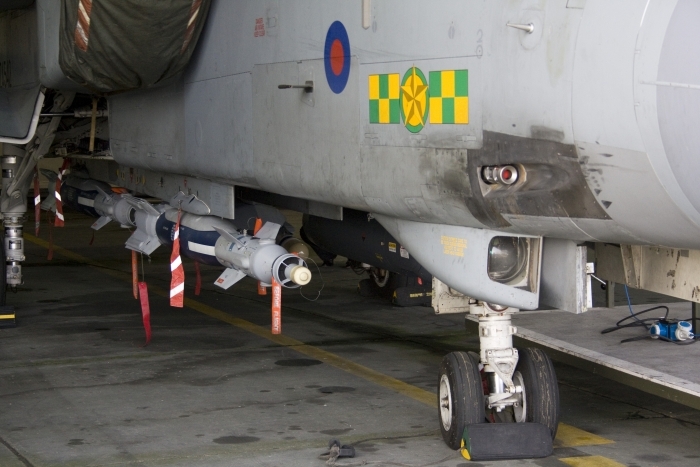 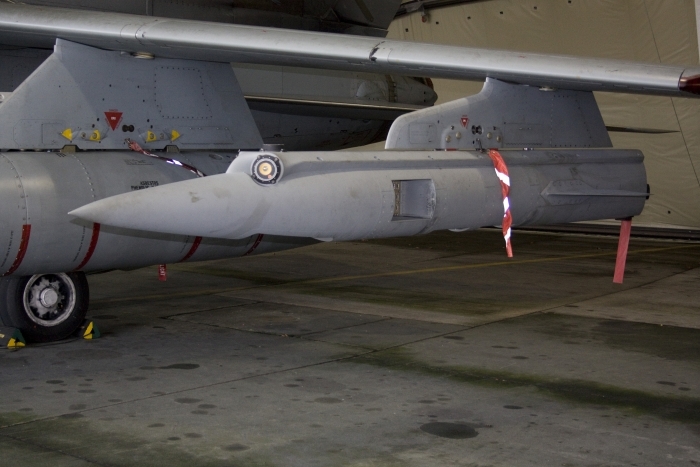 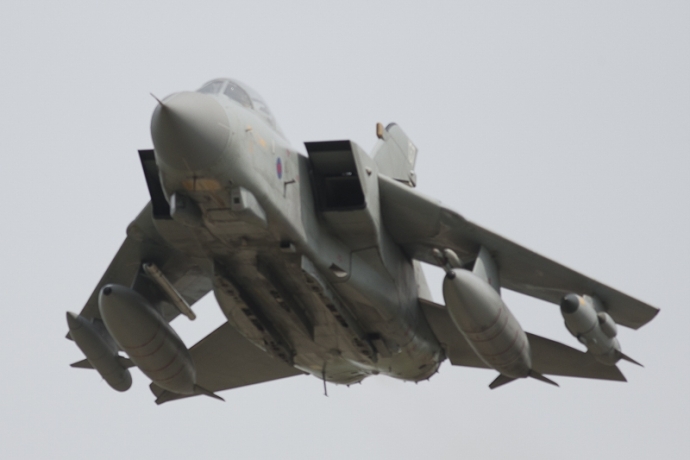 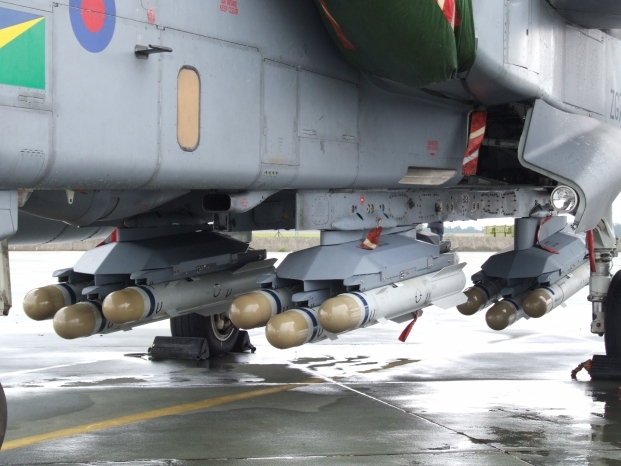 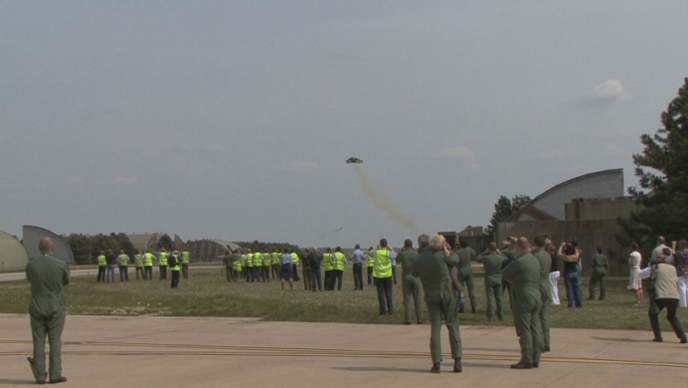 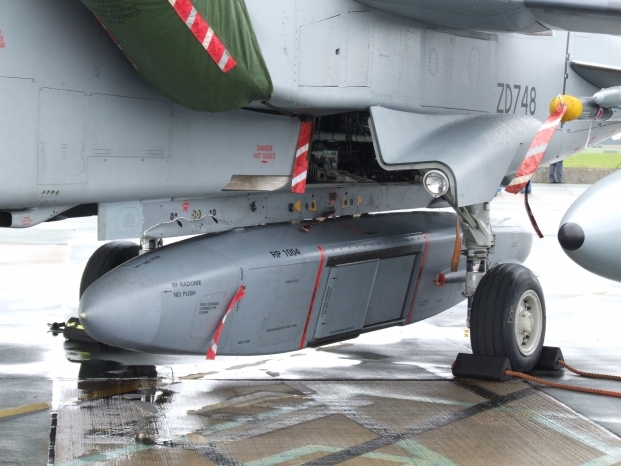 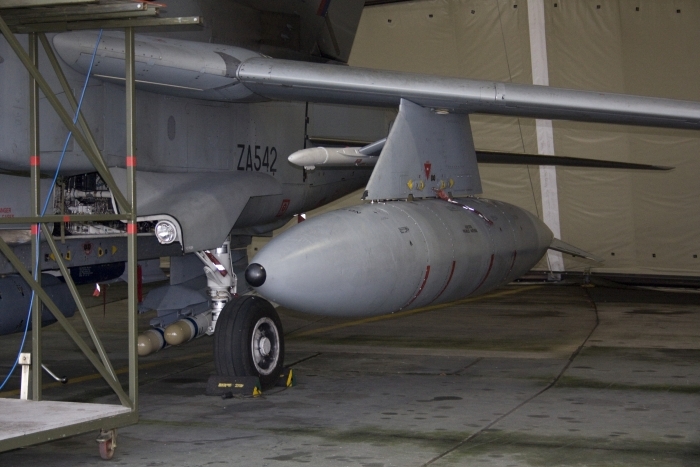 The object of the event was to demonstrate the Tornado GR4 and the weapon systems and personnel who use them. 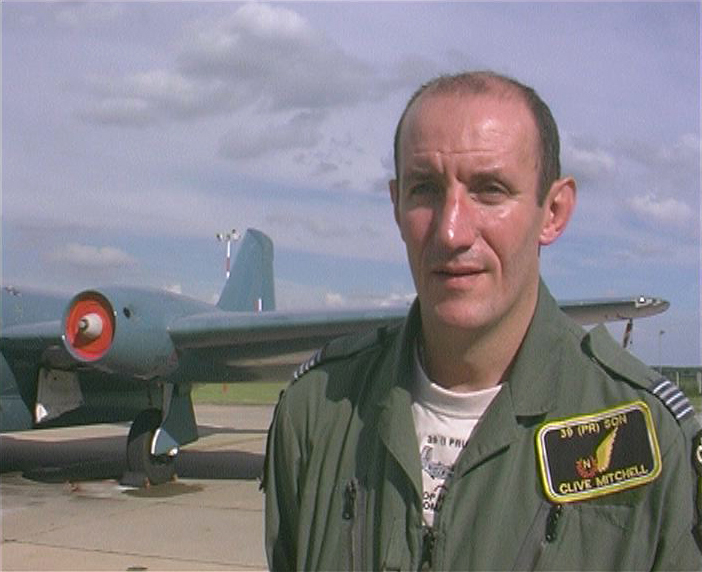 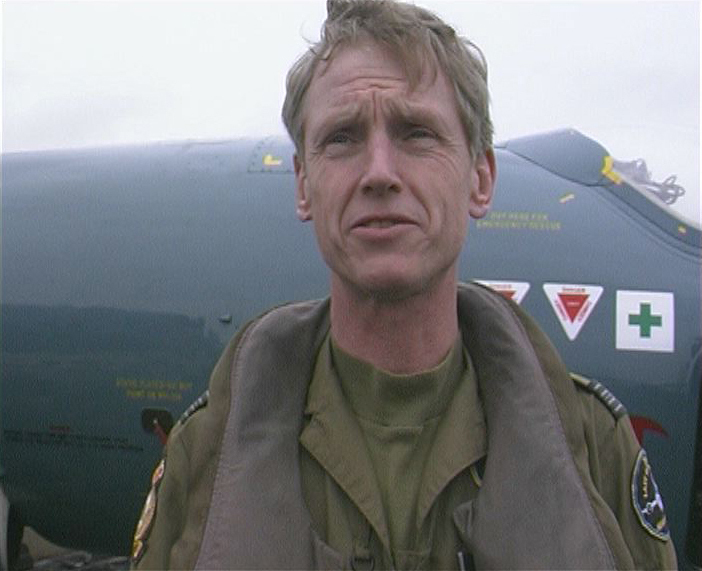 Marham's Station Commander (Group Captain Peter Rochelle) was on hand talk to the media as was the officer commanding 31 Squadron Wing Commander Ian Gale. 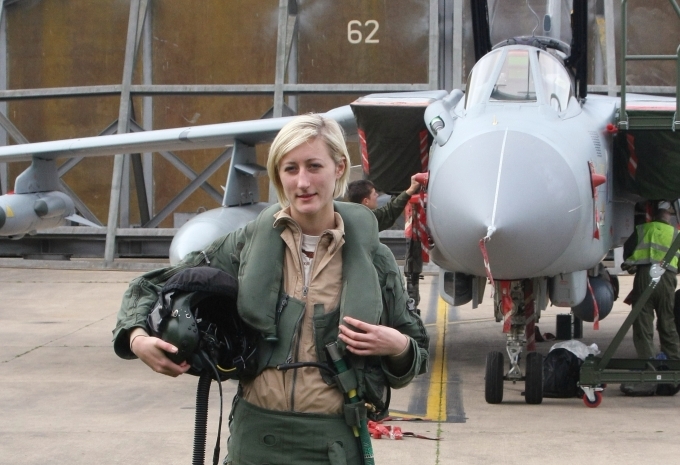 Other members of the squadron were also on hand including 31 Squadron's lady pilot Flt Lt Juliette Fleming. 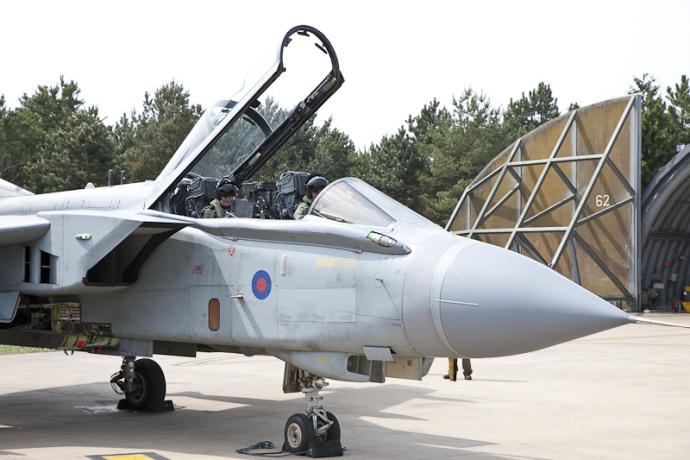 Members of the ground forces who support the Tornados gave a demonstration of how the information is interpreted back on the ground in one of their mobile units. 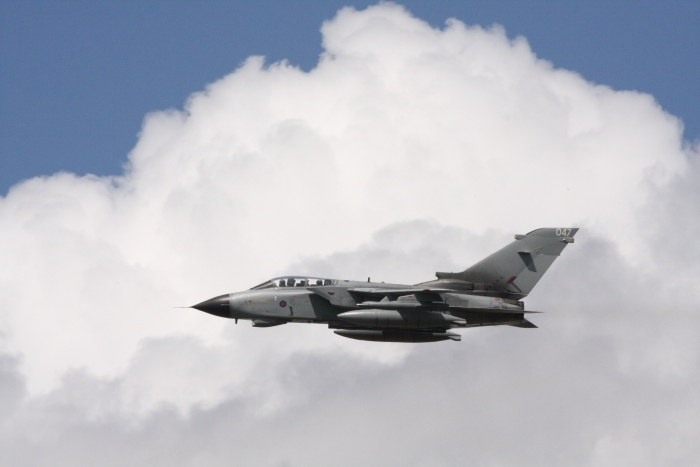 Wing Commander Gale described how the Tornado was used in Afghanistan which included overflying insurgents over 500 MPH at 100ft, which forces them to take cover. 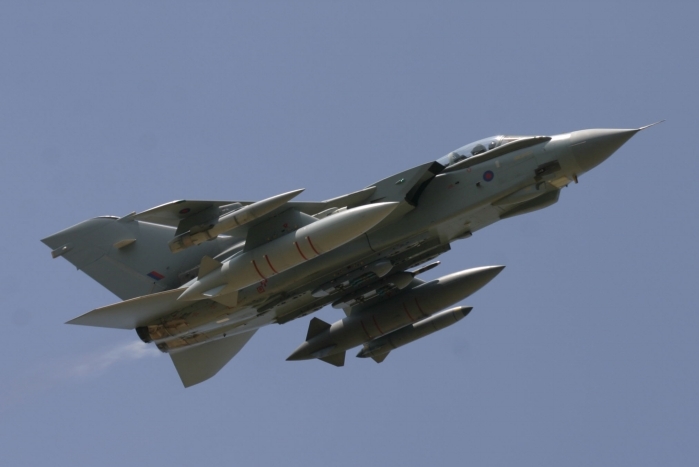 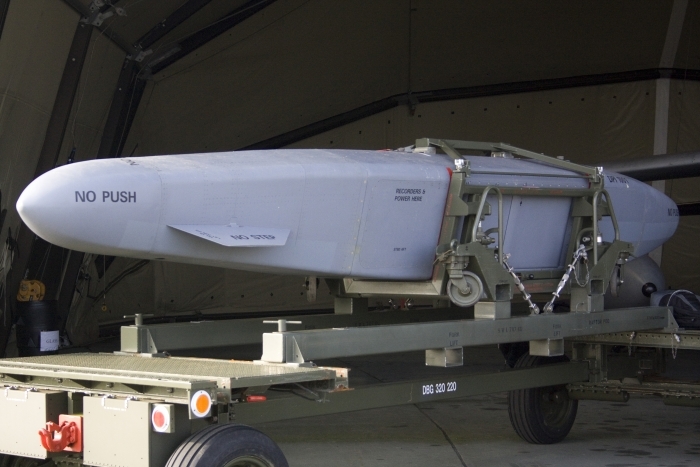 This policy means that the RAF is using the minimum amount of munitions which has reduced the possibility of killing innocent civilians. 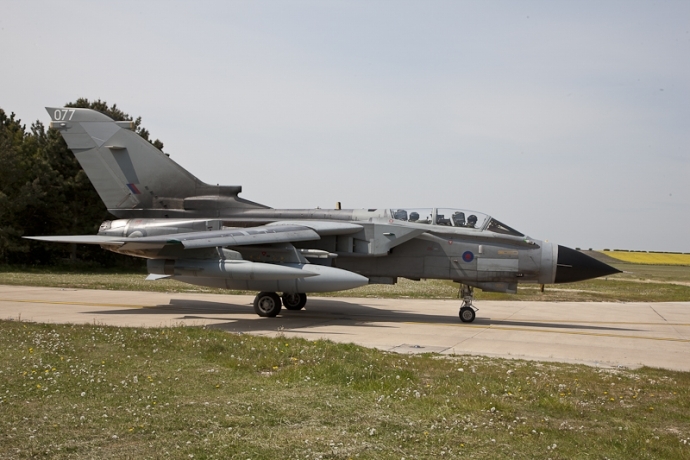 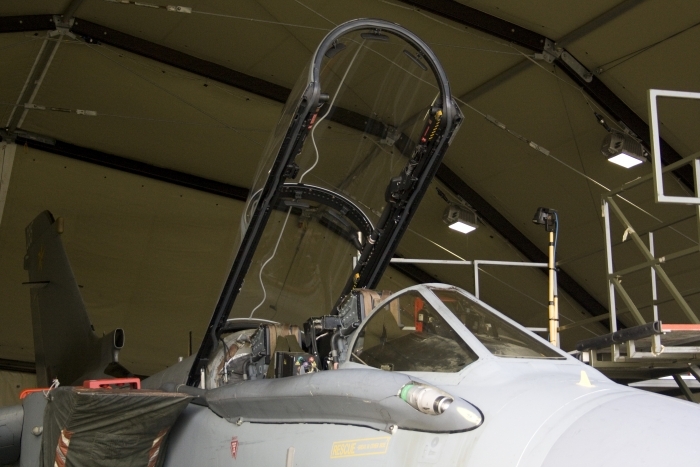 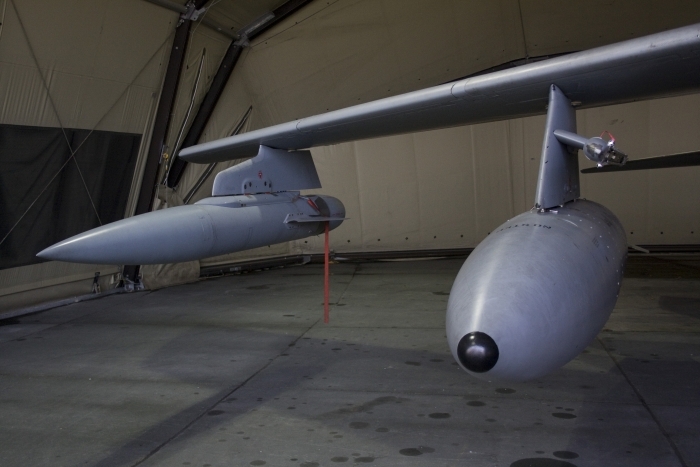 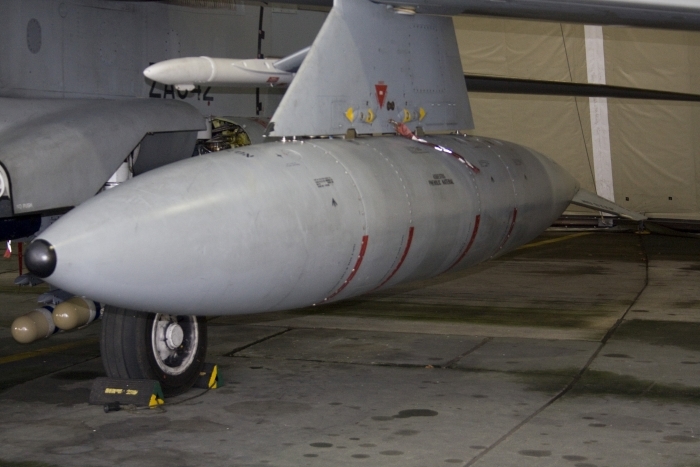 The Tornados also use their sophisticated equipment to detect the presence of IEDs (Improvised Explosive Devices) and mortar firing positions. 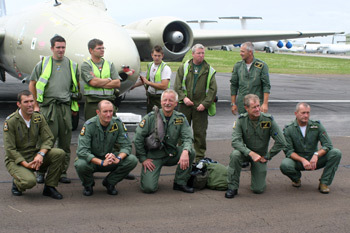 Many thanks to Squadron Leader Jenny Dennis Media Communications Officer and her staff for organising the event. 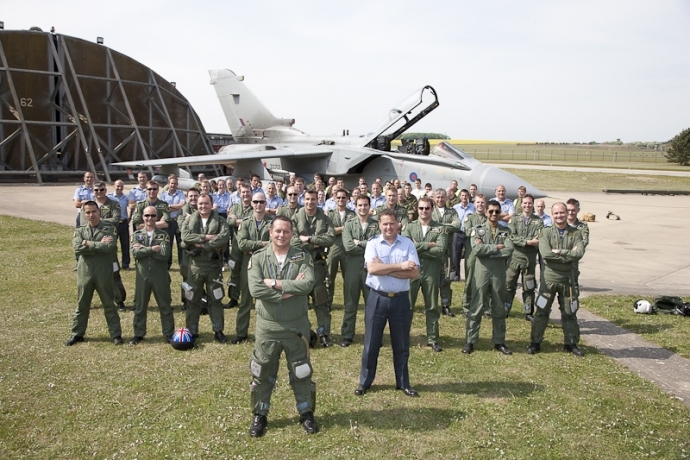 RAF Marham has its annual Families Day in July and like most other RAF stations it's a chance for service personnel to bring their families and friends on station to enjoy an afternoon of leisure activities, flypasts and flying displays, including Marham's own base Tornados and other types such as The Red Arrows and Typhoon, as well as a mix of civilian-owned Ex Military aircraft including the Vulcan, Meteor and Sea Venom. 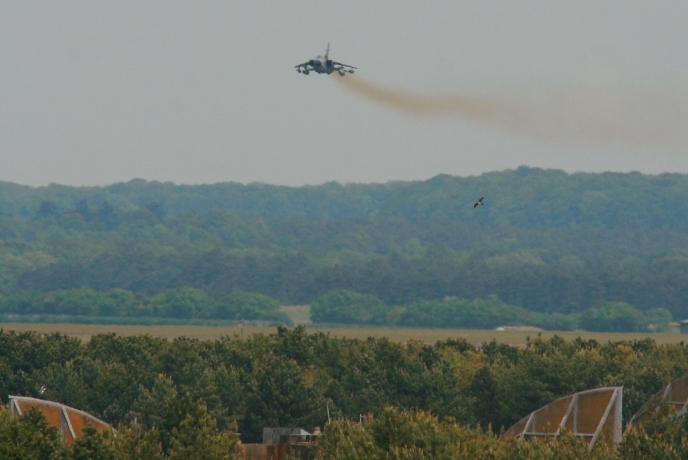 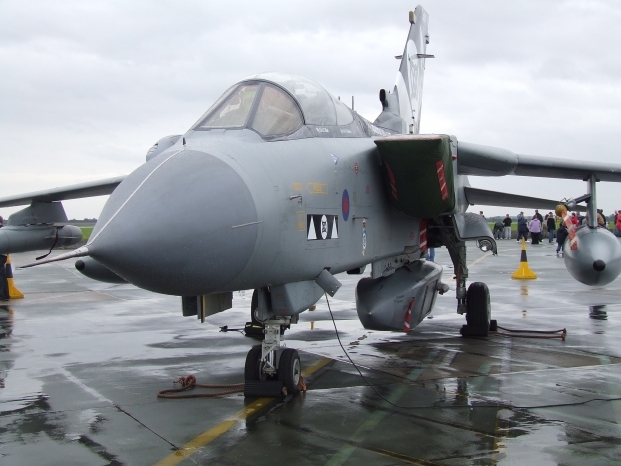 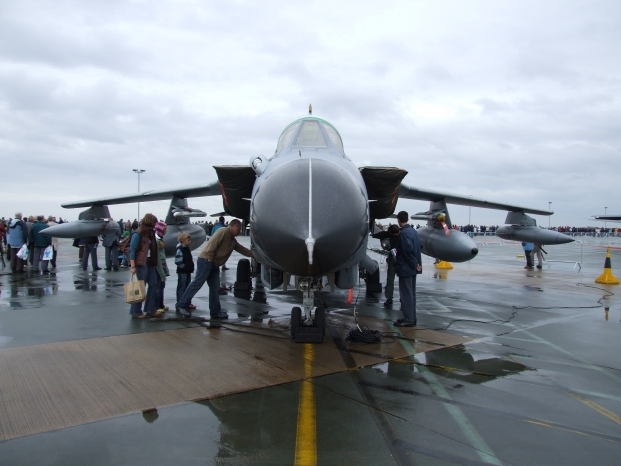 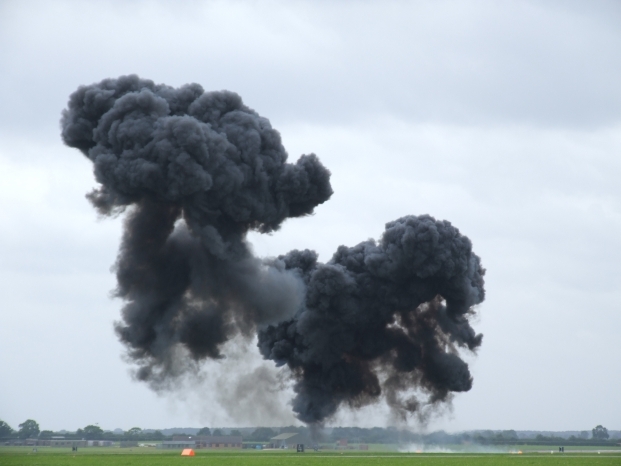 The 25th anniversary of the Tornado was celebrated on July 2007 at RAF Marham during Marham's annual Friends and Families Day, which including static and flying displays, sideshows and exhibits. 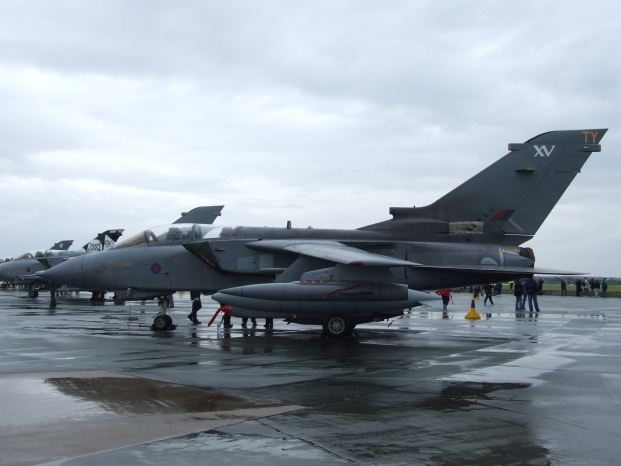 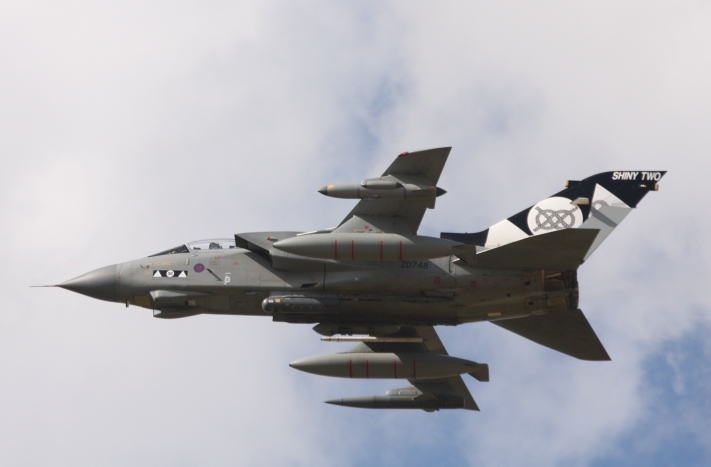 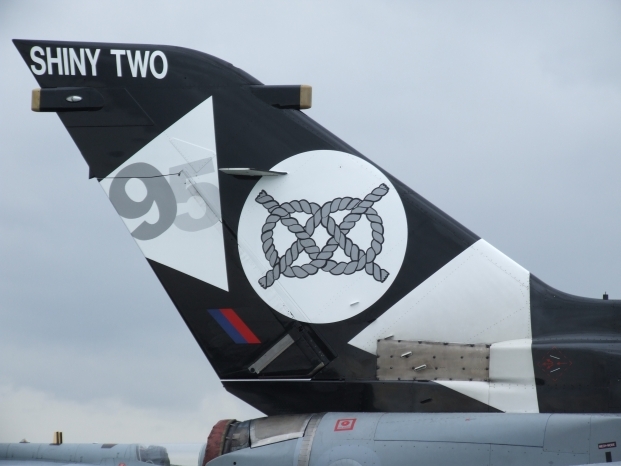 Several Tornados were on static display including 95th anniversary aircraft with their tail art. 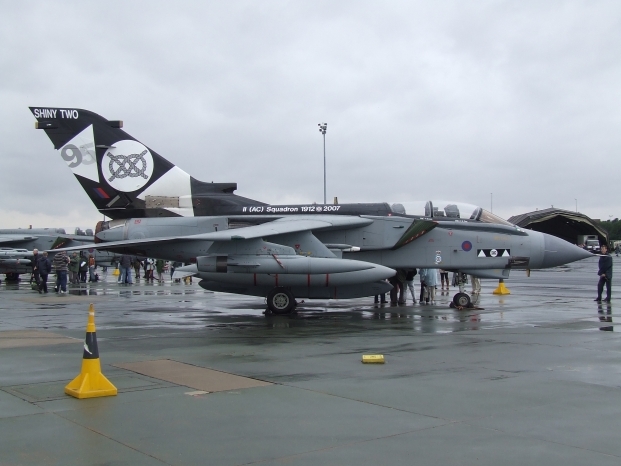 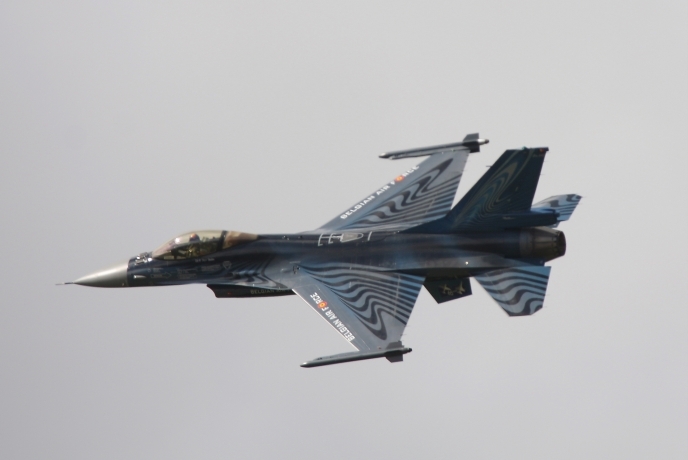 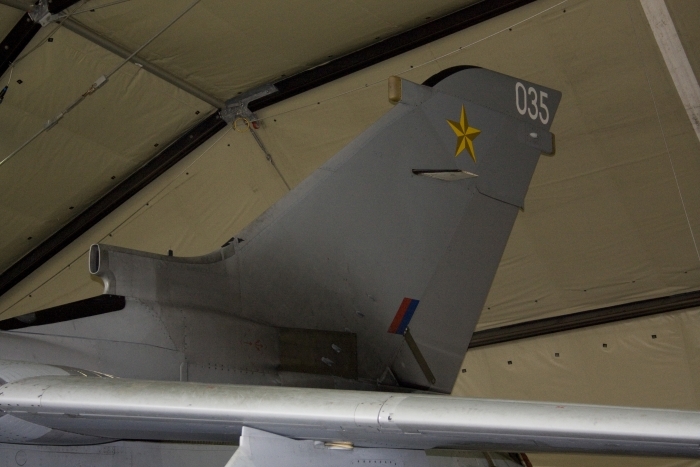 There was also an aircraft with the fin painted with the '25th anniversary of the Tornado' tail art. 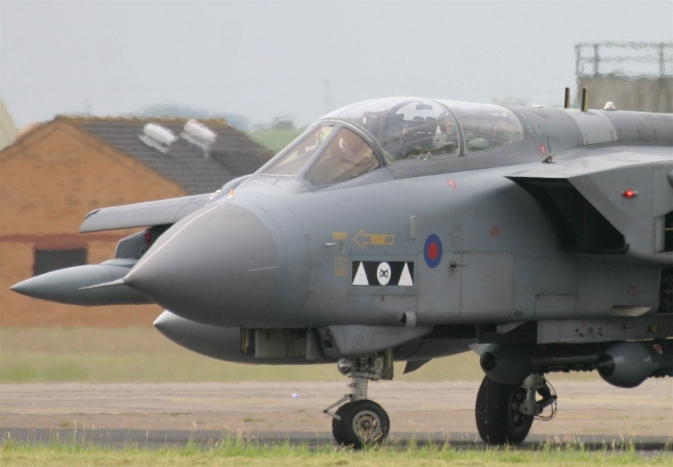 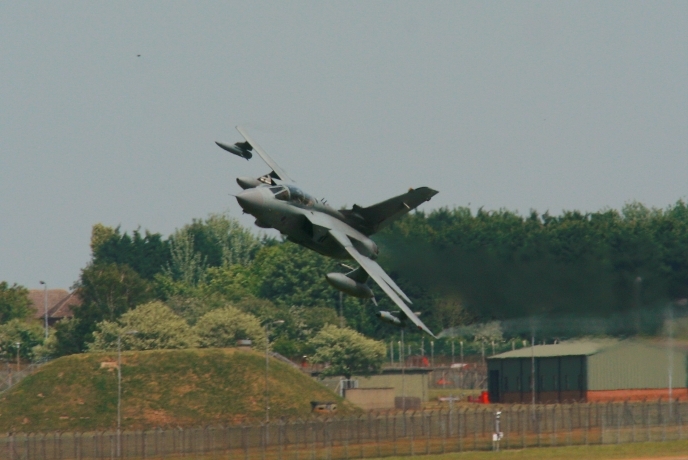 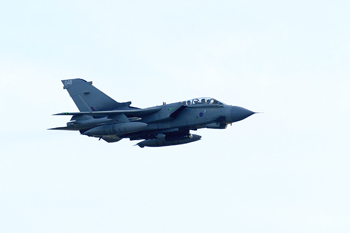 RAF Marham is home to part of the RAF's GR4 Tornado force. 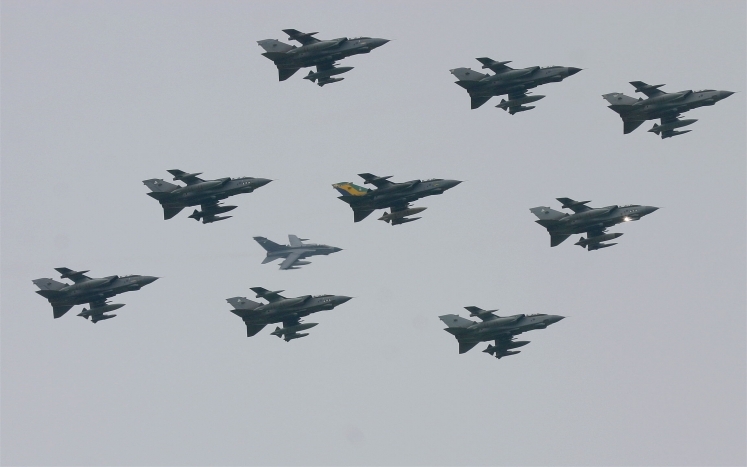 Having four squadrons of Tornado GR4s on strength, 2, 9, 13 and 31 Squadrons. 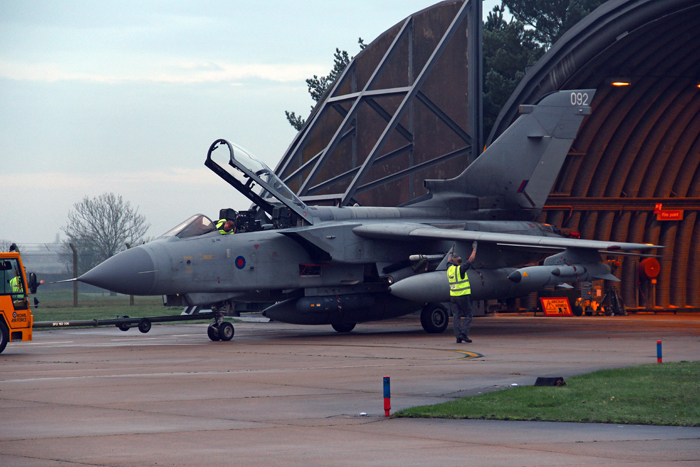 Marham is one of the busiest RAF bases in the area. 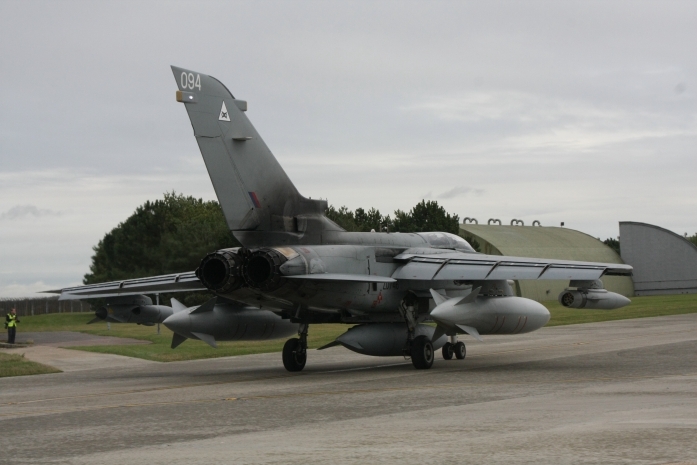 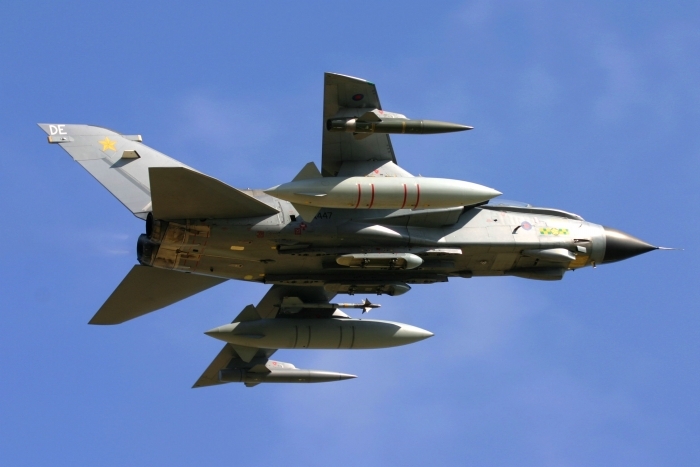 The other GR4 Tornados are operated in Scotland at RAF Lossiemouth. 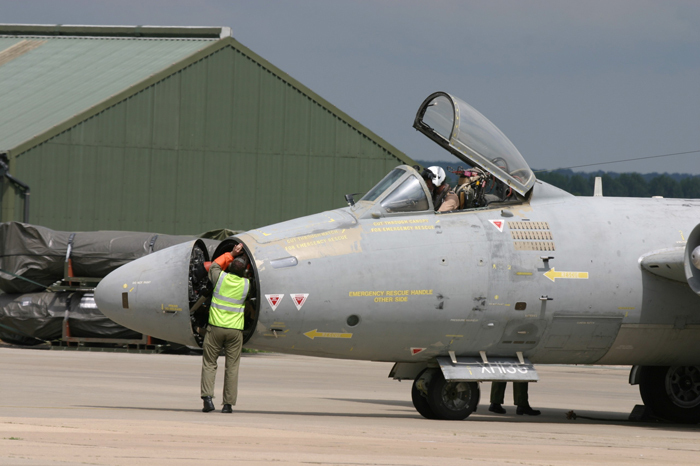 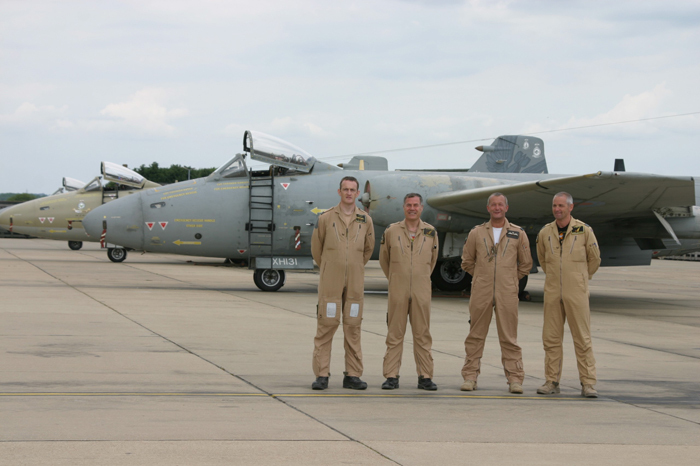 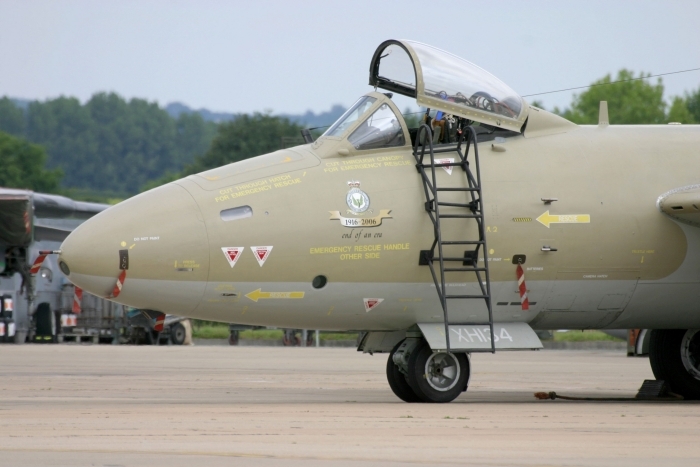 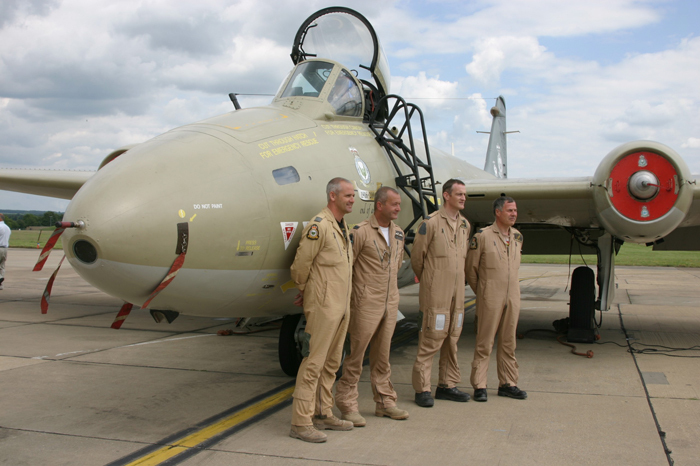 After the Canberra PR9s returned from their last detachment July 2006 became a very busy month with the run-up to the PR9's retirement and the squadrons disbandment. 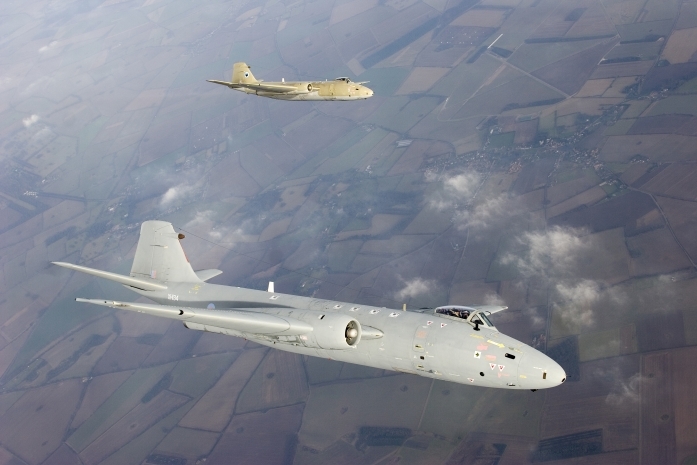 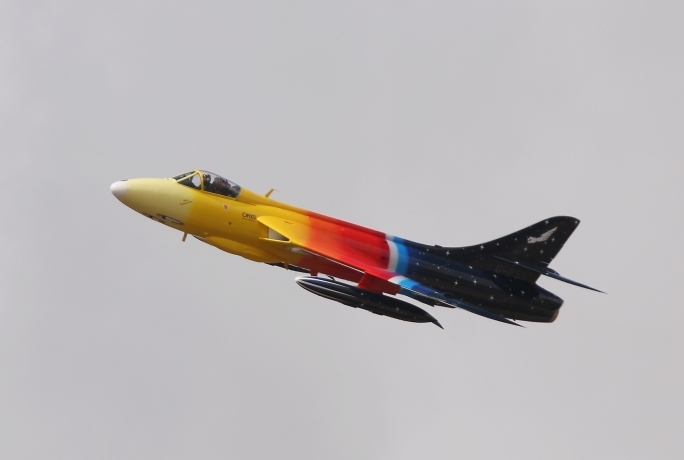 Numerous practice displays were flown by Sqn Ldr Terry Cairns and Sqn Ldr Roger Newton in readiness for their display at RAF Waddington, RIAT at Fairford and the RAF's final Canberra display at Marham's Families Day. 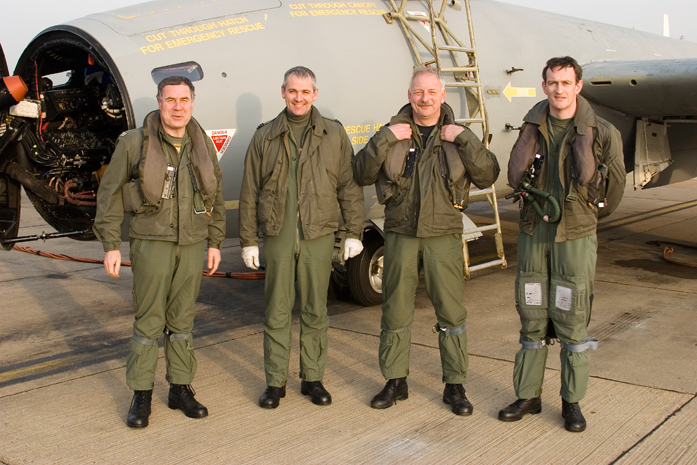 During this hectic time a pair of PR9s flown by Sqn Ldr Dave Piper, Sqn Ldr Gary Winwright, Flt Lt Mike Leckey and Flt Lt Colin Fryer took off from RAF Marham for a final air-to-air photo shoot. 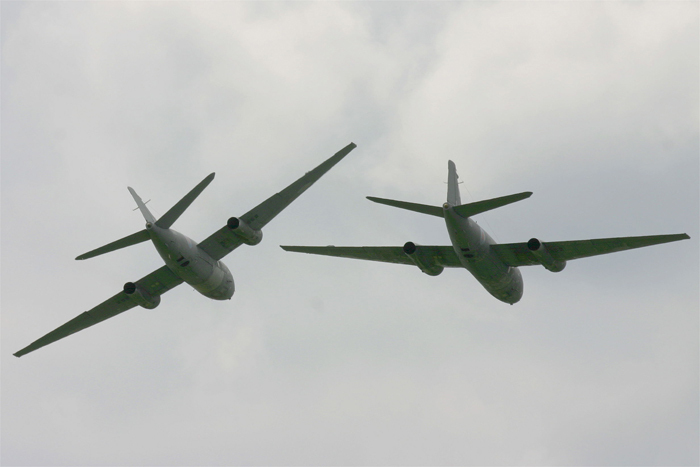 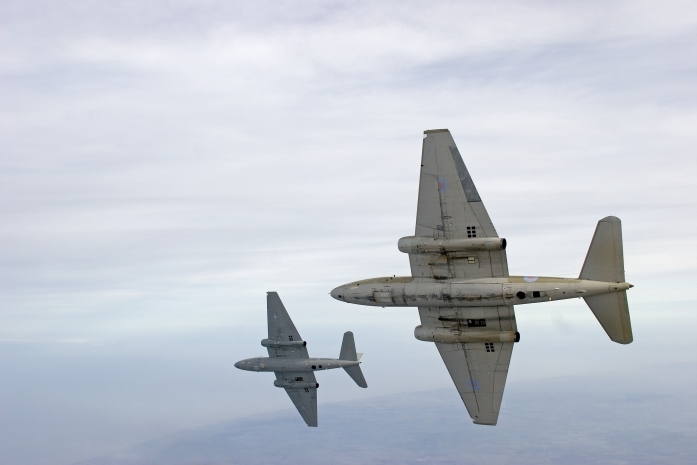 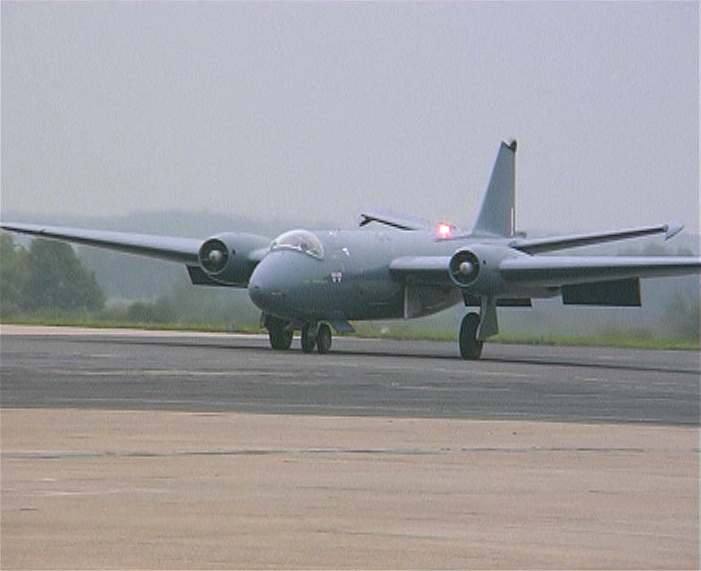 In fact this may be the only time that two PR9s have been filmed in formation for many years. 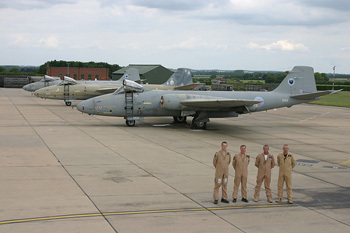 As the impending retirement of 39 Squadron's last three PR9 aircraft loomed even closer on 28th July 2006, Squadron Leader Terry Cairns and his navigator (Squadron Leader Roger Newton) started their work up display practices for Waddington and Fairford Air Shows and Marham's Families Day later in the summer. 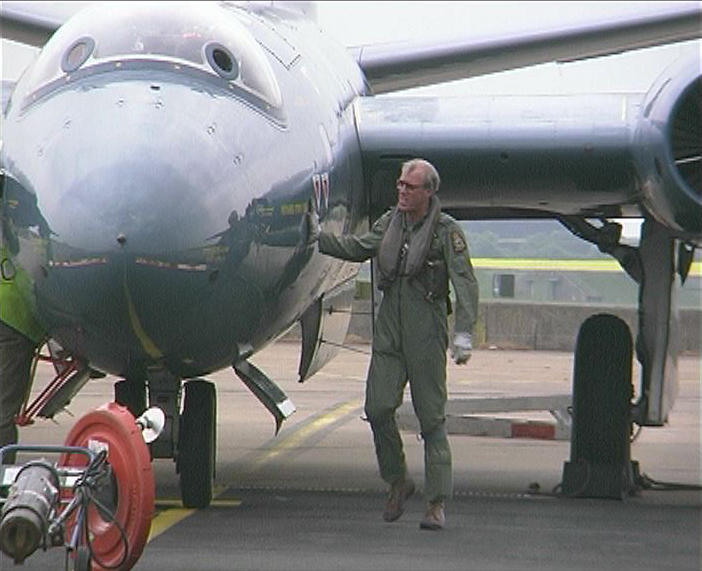 Over a few weeks period Terry and Roger could be seen putting XH134 through its paces. 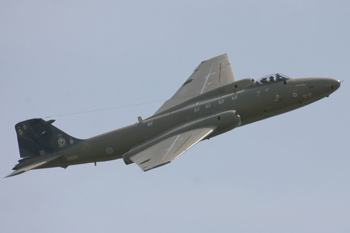 The clean lines of this aircraft gracing the skies overhead Marham, with the PR9's final flypast and blue note reverberating around the airfield at the end of each display. 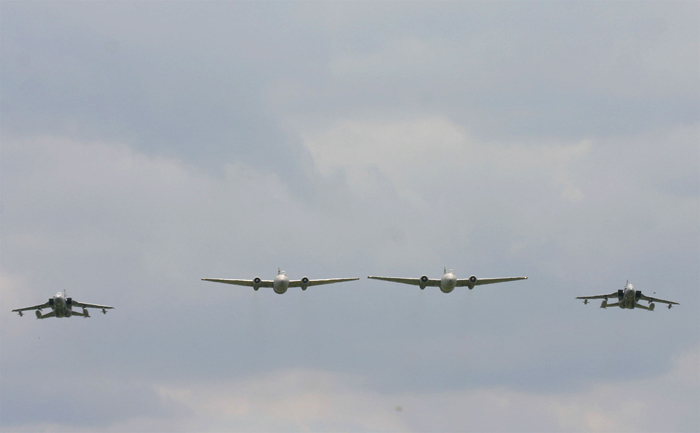 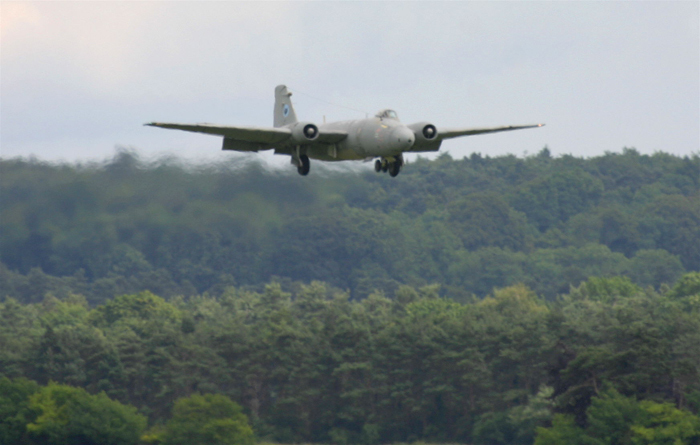 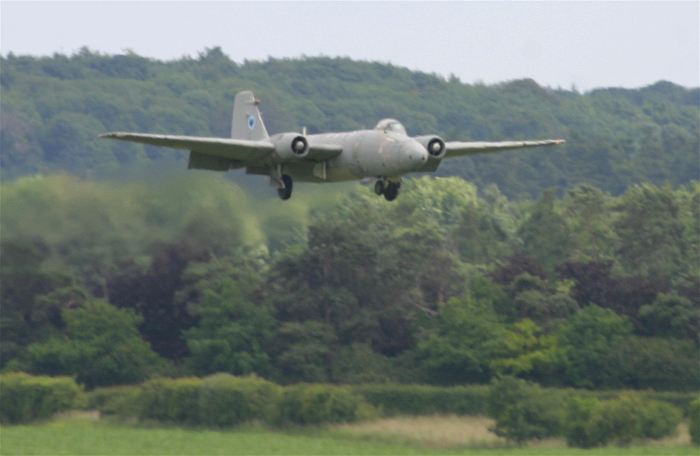 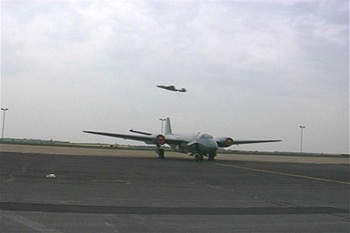 The culmination of these practices were the four displays over the weekends of Waddington and Fairford's air displays with the last ever RAF Canberra display being carried out at RAF Marham's Families Day on 27th July 2006. 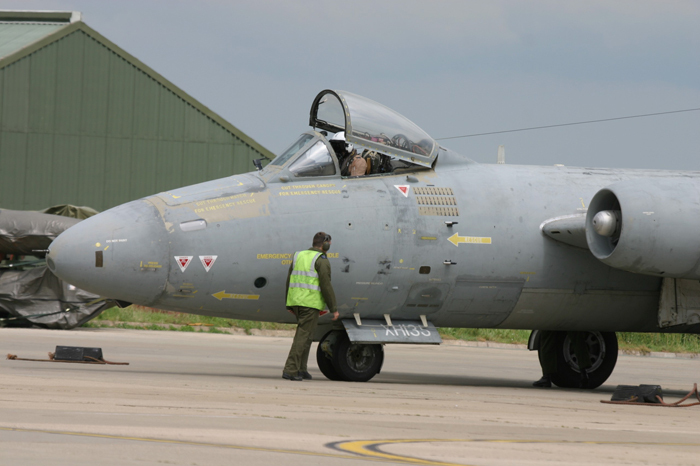 After landing Terry taxied XH134 back into the dispersal and shut the aircraft down, which for him was going to be the last time as this was his last flight in a Canberra before his retirement. 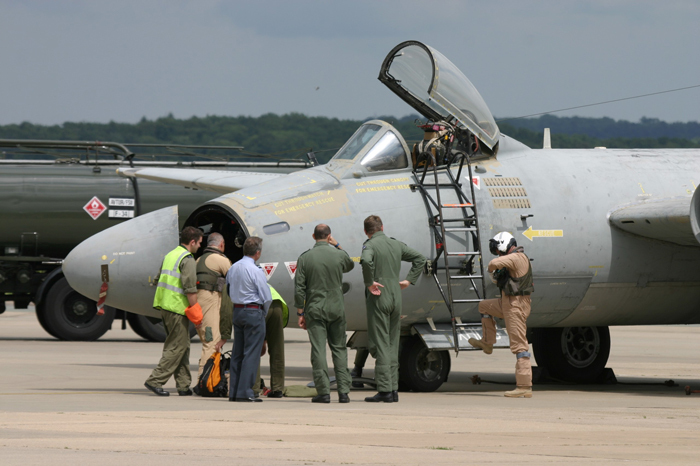 After over thirty years of flying Canberras and over 7000 hours on type he was met with applause from fellow members of the squadron and family and friends and a well deserved glass of champagne. 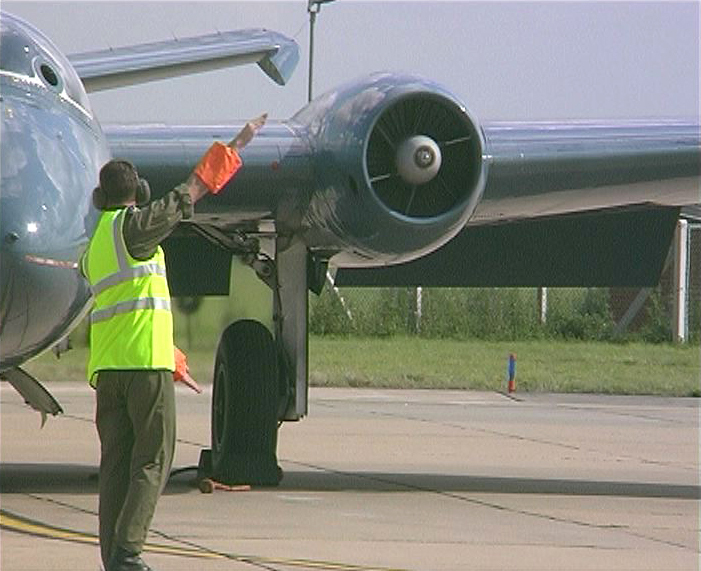 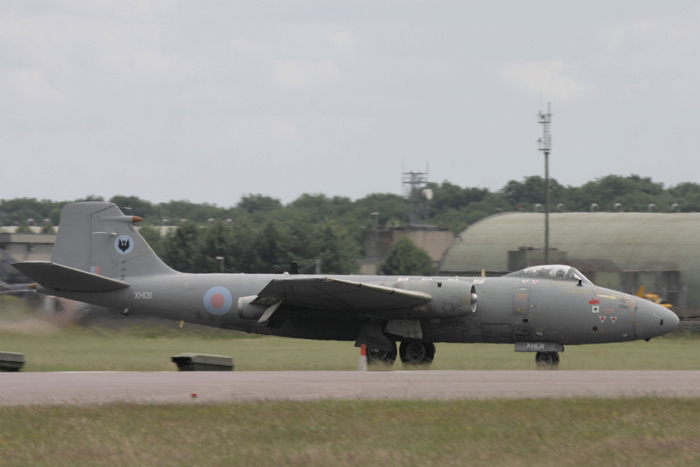 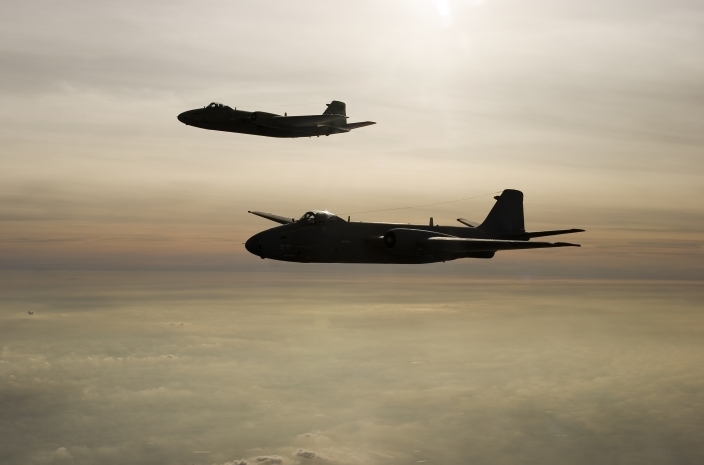 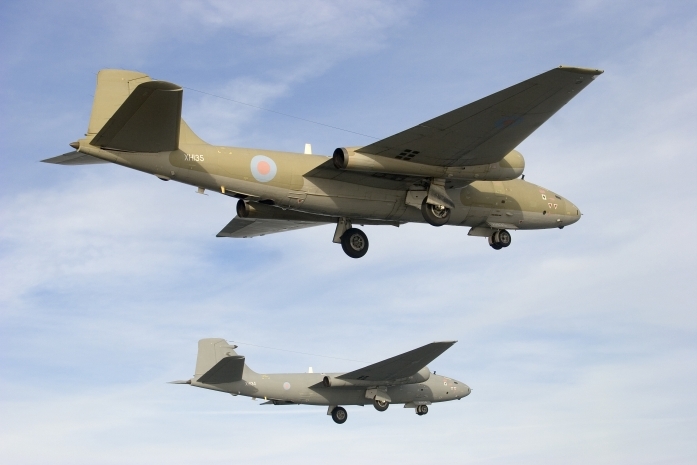 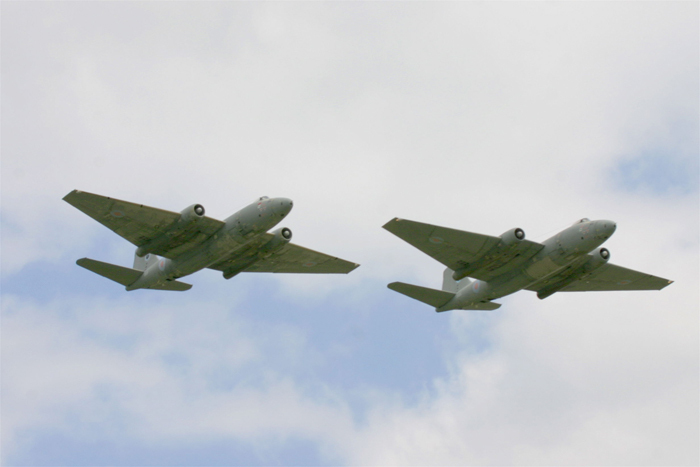 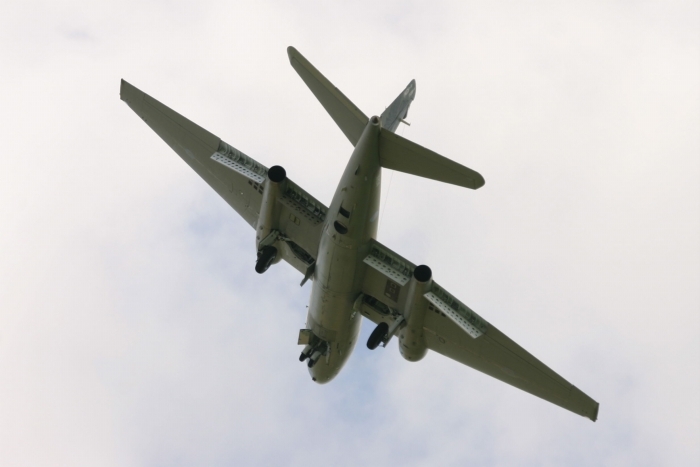 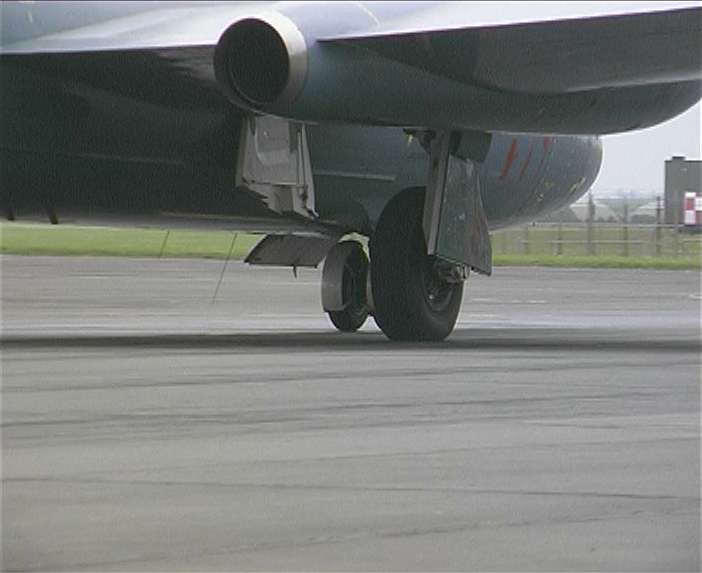 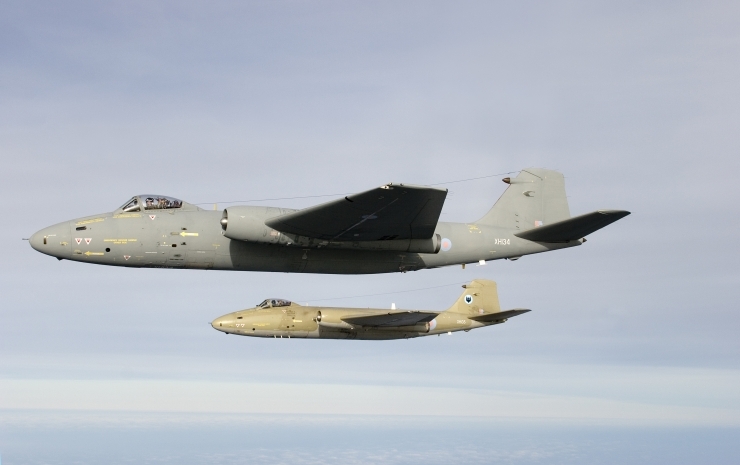 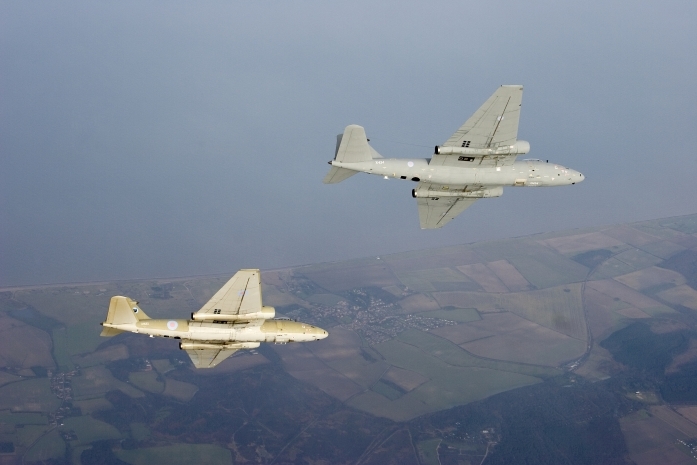 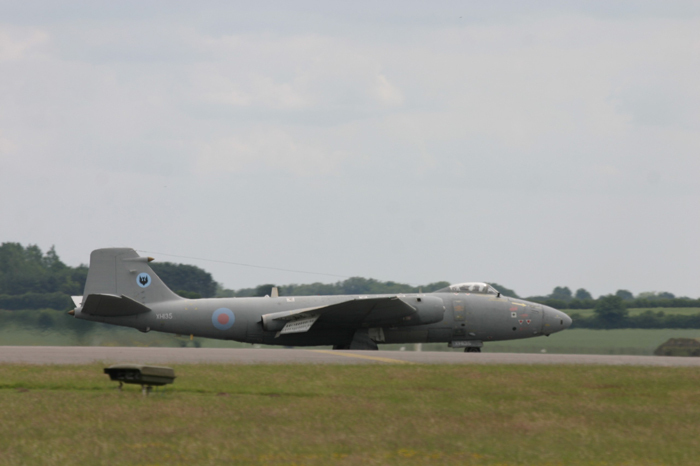 Two PR9 Canberra aircraft XH131 and XH135 from 39 Squadron arrived back at RAF Marham in Norfolk from the squadron's last detachment at Seeb in Oman. 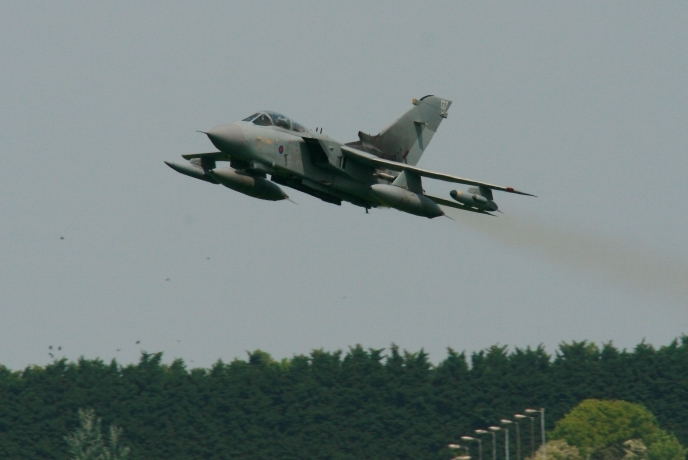 The Canberras were escorted back to the station by two GR4 Tornados from Marham. 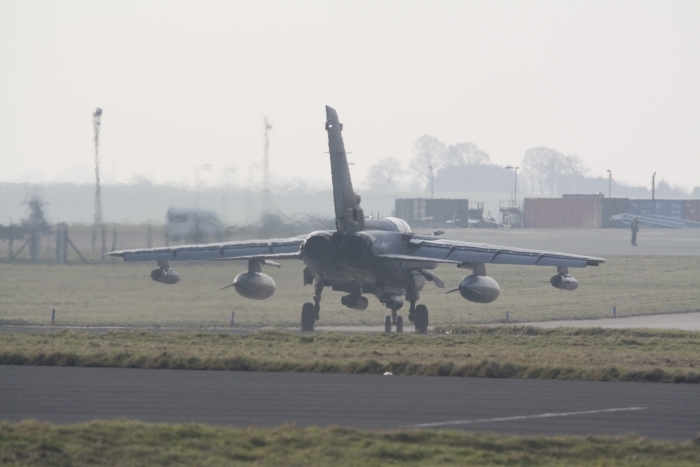 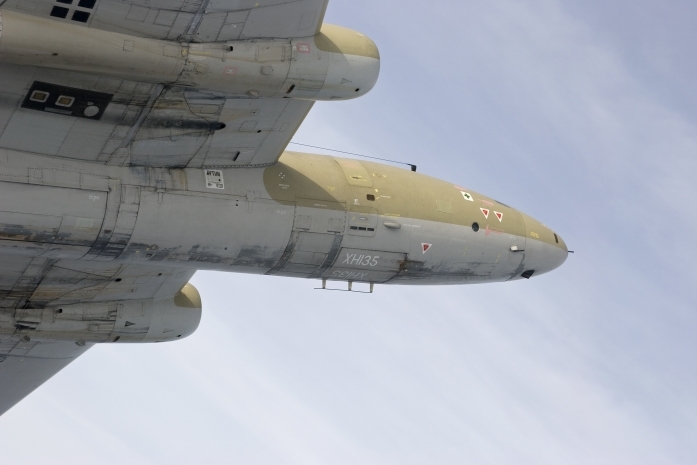 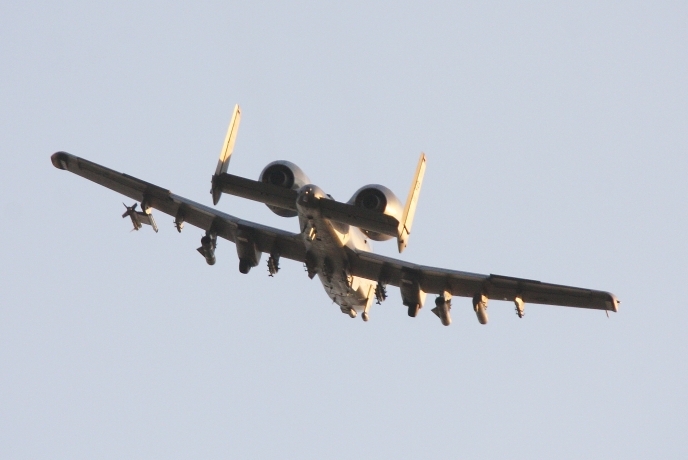 The five months detachment was supported by ground and aircrews rotating every few weeks. 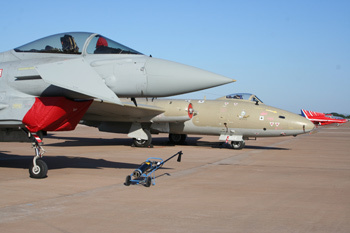 On their arrival the two aircraft were met on the dispersal by Air Vice-Marshal Chris Harper Chief of Staff Operations, Group Captain Greg Bagwell RAF Marham Station Commander and Wing Commander Clive Mitchell Officer Commanding 39 Squadron, colleagues from 39 Squadron and family members, TV crews and local media. 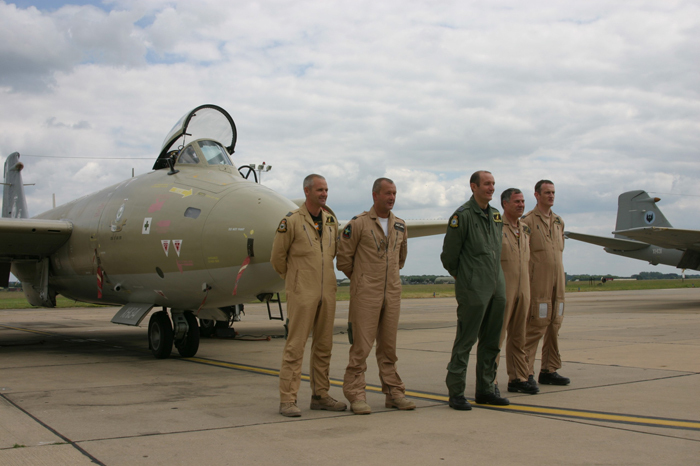 The aircraft were flown by Flt Lt Mike Leckey, Flt Lt Colin Fryer and Flt Lt Ronnie Fairbrother and Sqn Ldr Gary Winwright. 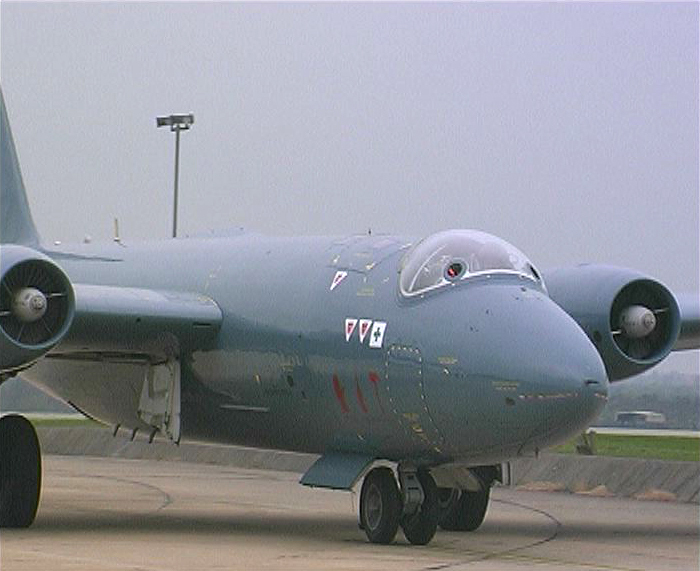 On 1st September 2005 the Blue Canberra WJ874 from 39 Squadron at RAF Marham made its last operational flight (a round robin), starting from RAF Marham overflying airfields and RAF stations throughout the country which have had Canberra connections over the last 54 years. 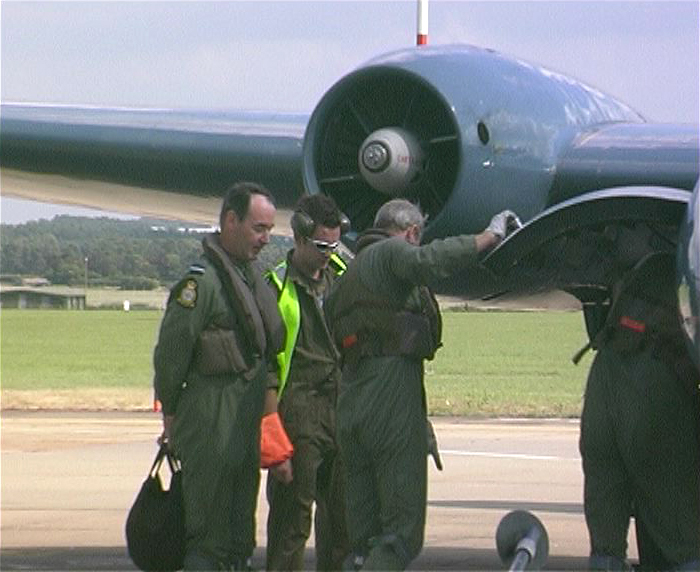 The crew of the Canberra for this unique flight, Squadron Leader Terry Cairns (pilot), Wing Commander Clive Mitchell (navigator) and their passenger Air Officer Commanding No. 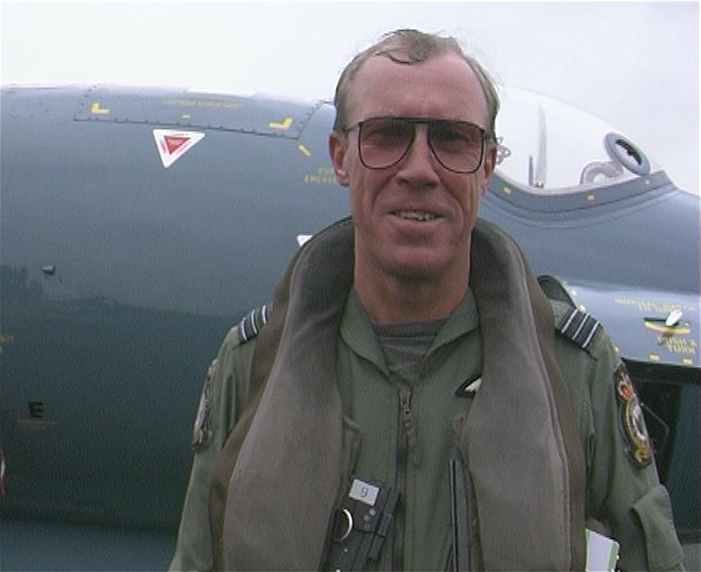 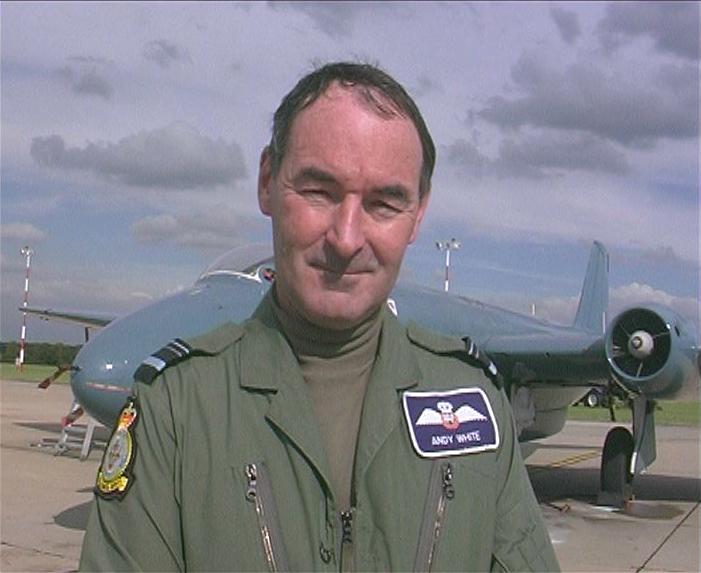 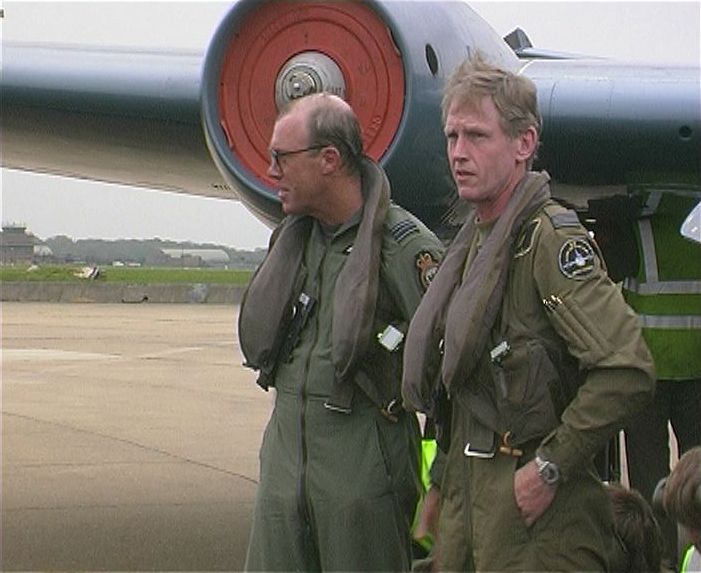 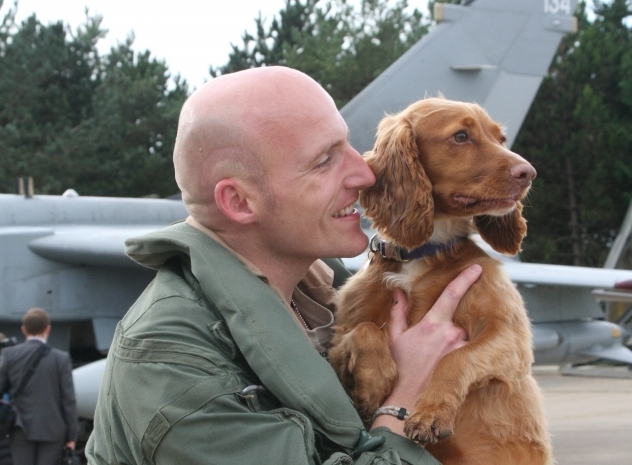 3 group Air Vice-Marshal Andy White. 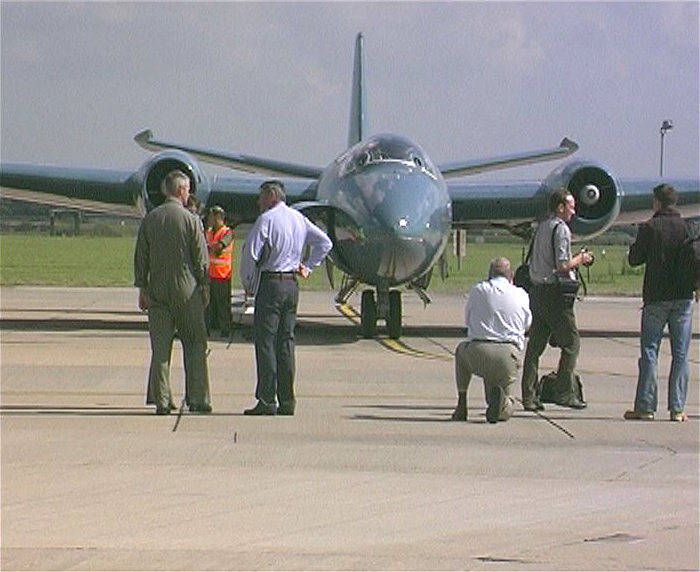 With good weather conditions the press and TV cameras were out in force to witness the aircraft take off and then return some time later after its trip around the country. 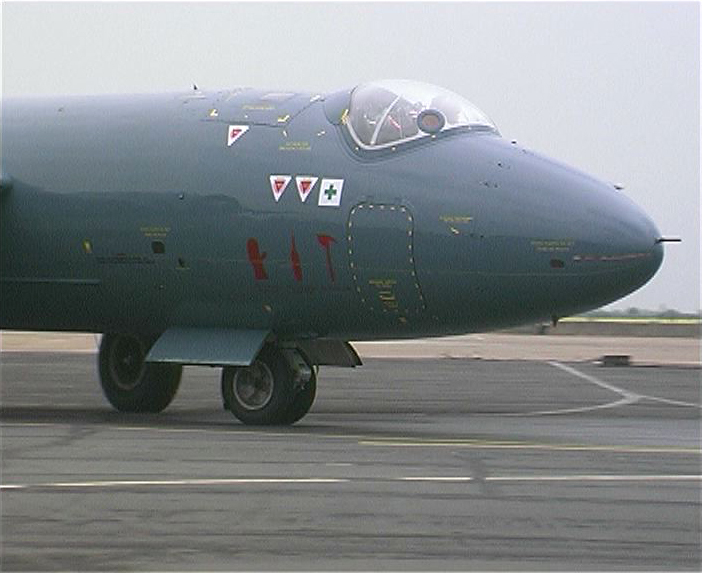 On 13th May 1949 Wing Commander Roland 'Bea' Beamont carried out the first flight in the prototype Canberra at Warton in Lancashire. 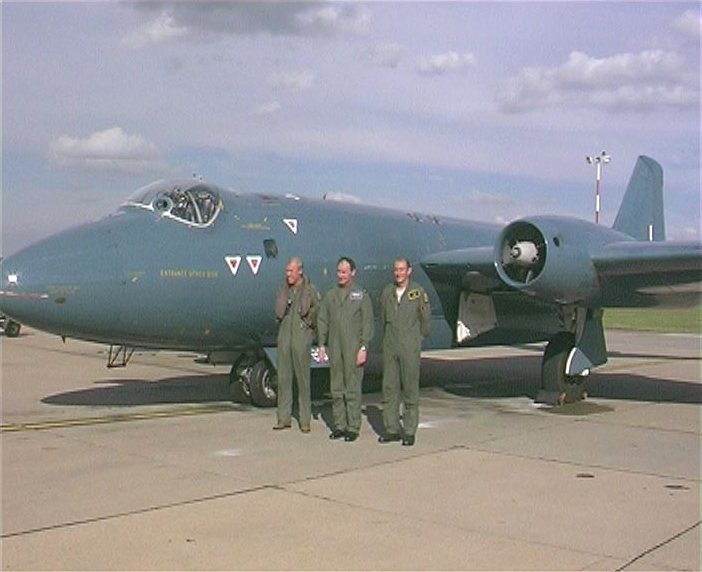 To celebrate this anniversary 39 Squadron at RAF Marham have had Canberra T4 WJ874 painted in a new gloss blue paint scheme, similar to the original aircraft. 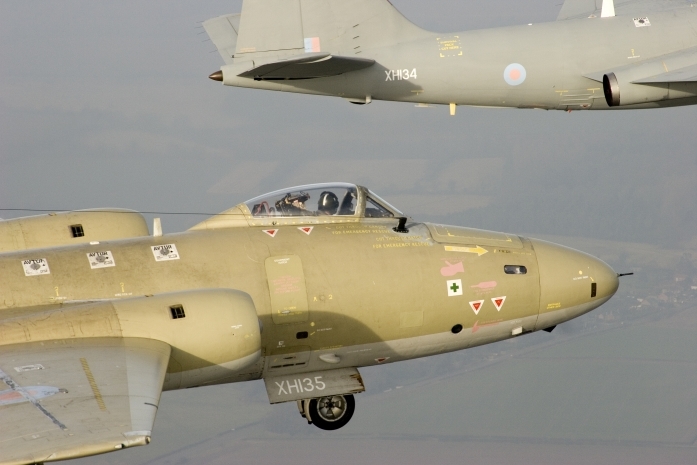 During the week leading up to the anniversary Squadron Leader Terry Cairns (pilot) and Squadron Leader Brian Cole (navigator) did several practice displays in WJ874 in readiness for a busy display season at air shows throughout the country.